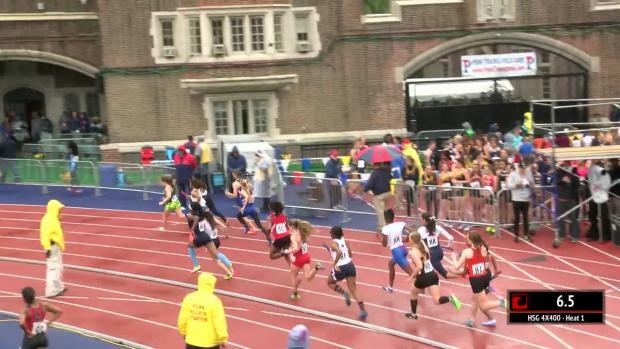 An early fall, an astounding kick, a sub-four minute miler on the anchor with an 80-meter deficit to make up... this race has it all. 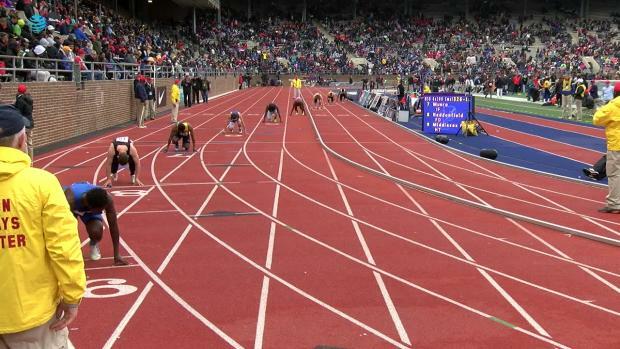 Live stream details and schedule. 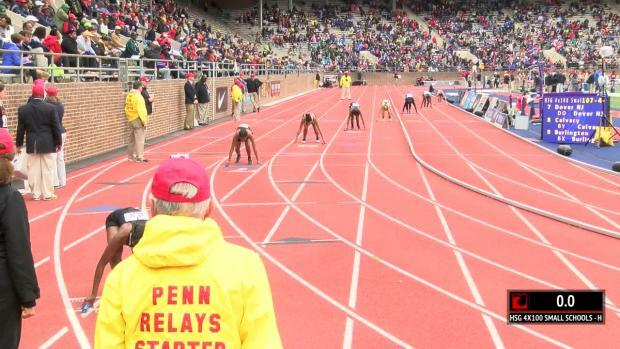 We break down the six running events at Penn. 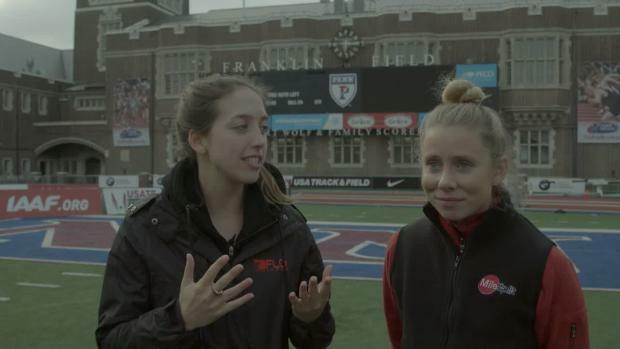 The stars of Penn Relays share their most embarrassing track and field moments, fav emojis & more! 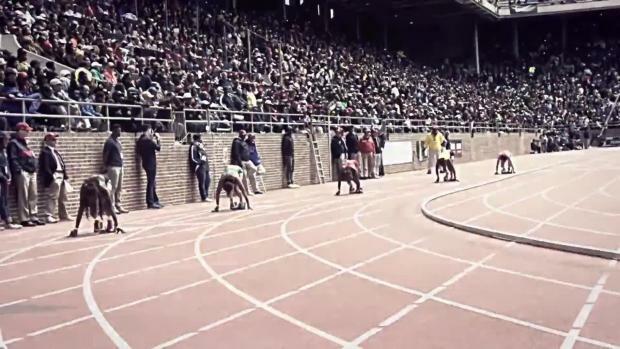 Thousands of races go off every year. 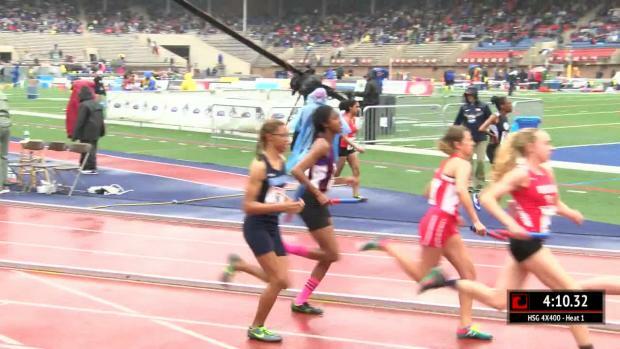 Hundreds have great kicks that determine the finish. 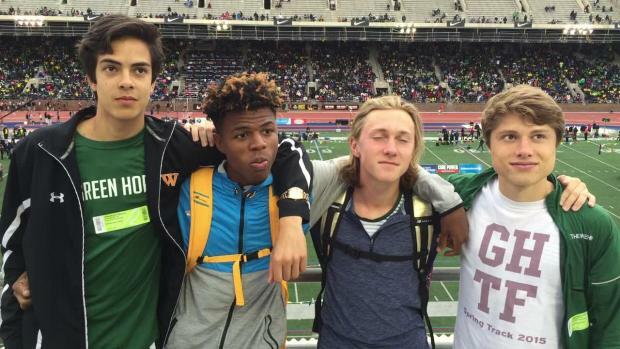 We picked our top ten Kick of the Weeks from 2016. 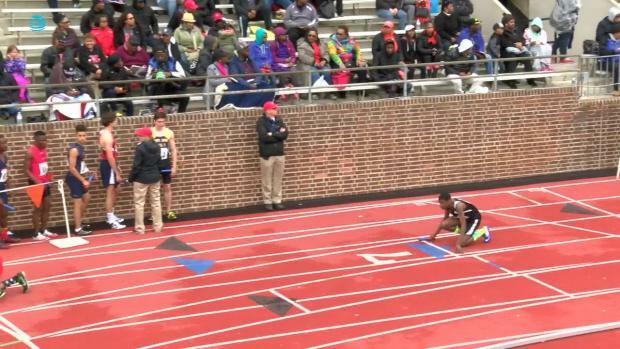 Click through the slides to see why you should never give up in a race. See it here first! 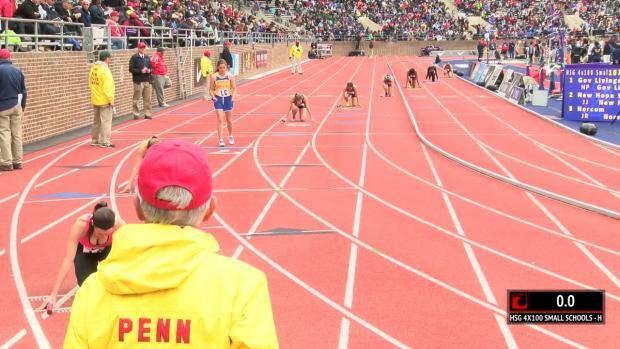 Who made the cut and got into the Penn Relays' individual events from Virginia. 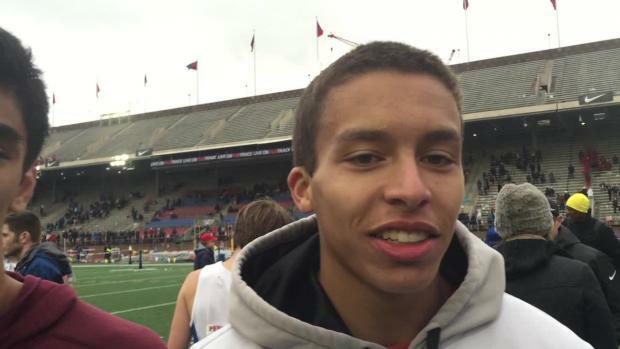 Two-time individual Penn Relays champion Drew Hunter will go for the DMR title this weekend with his team, Loudon Valley High School. 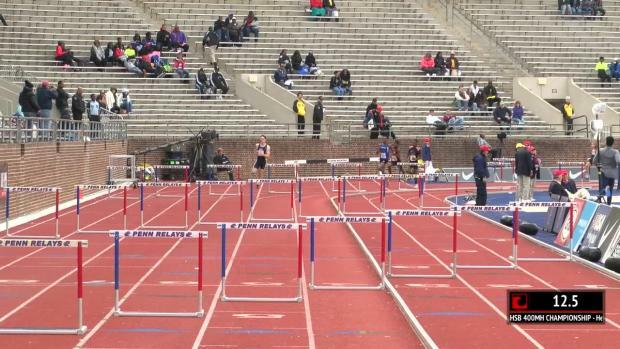 See who made the Penn Relays Carnival 3K, Mile, 400m hurdles and more! 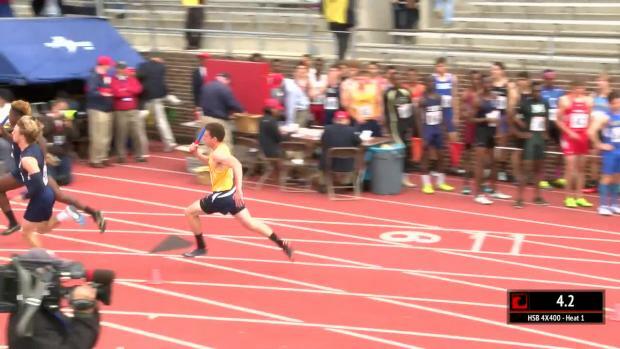 Watch the races that brought home the wheels! 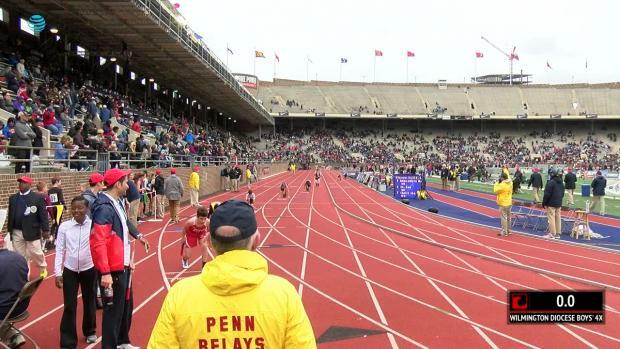 Previewing all the invitational action for this week's Penn Relays at Franklin Field in Philadelphia. 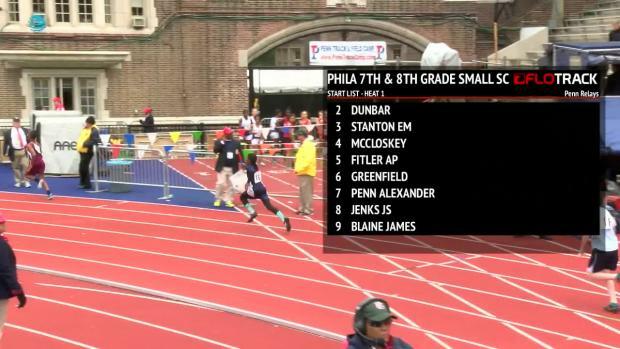 Meet this year's new Wall of Famers. 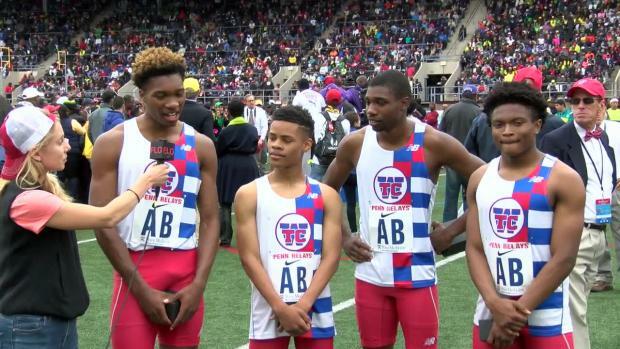 The New York squad ran a PR of 9:11 in the prelims, then improved to 9:00 in the finals to take home the Championship of America trophy. 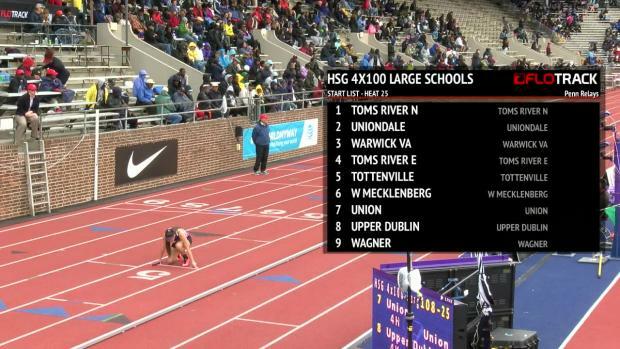 Hannah Reale ran a huge PR of 2:10 on the anchor to kick past Jamaican teams Edwin Allen and Holmwood Tech. 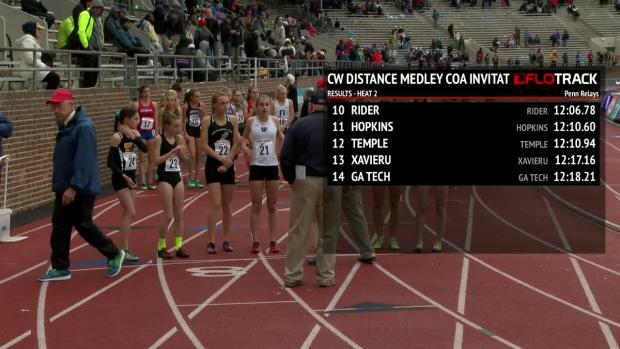 This will be Hunter's second major DMR of the year. 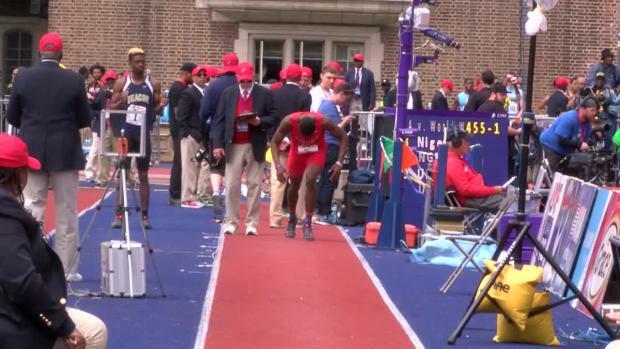 Mahlique Booth of T.C. 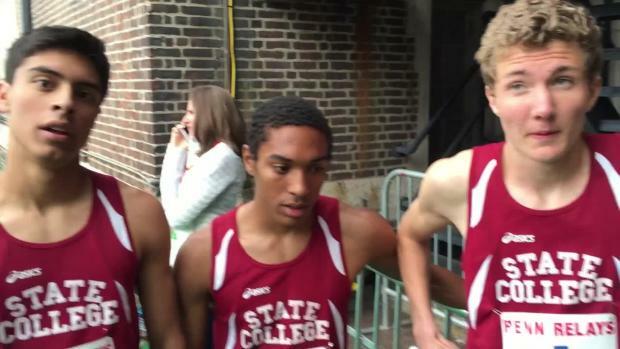 Williams talks about what it means to place third in the 4x400m Championship of America. 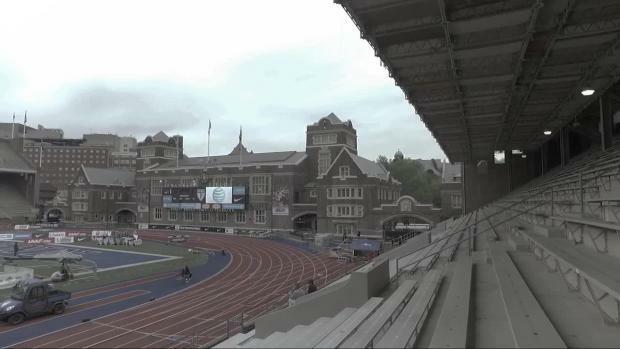 Follow along here all day for live updates and more as PTXC is live from Franklin Field in Philadelphia. 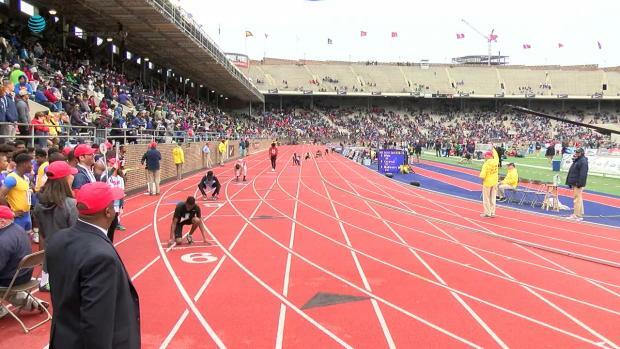 Another large group of Maryland schools will be making the trip north on I-95 to compete from Thursday thru Saturday at the 2016 Penn Relays. 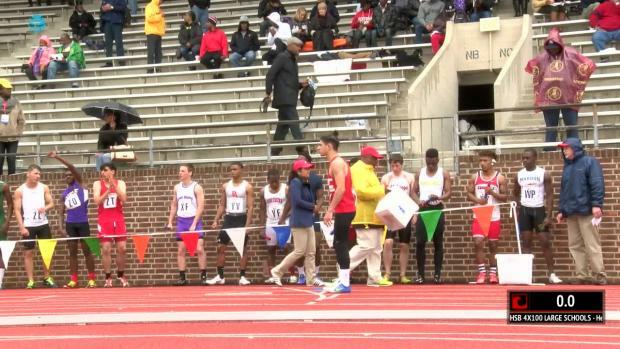 Can find a full list of Maryland high school relays and individuals competing at the Penn Relays below. 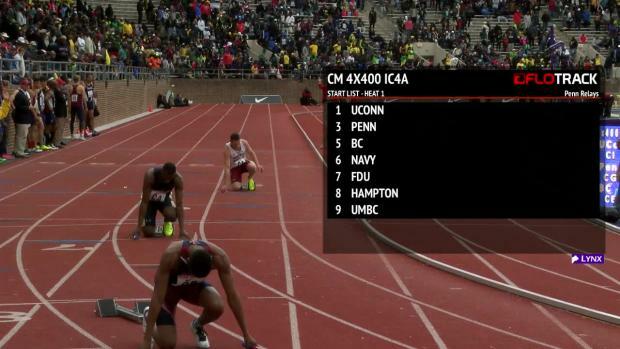 Check out who made the cut for Virginia. 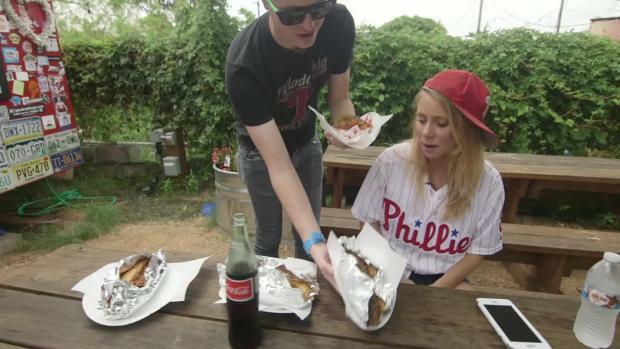 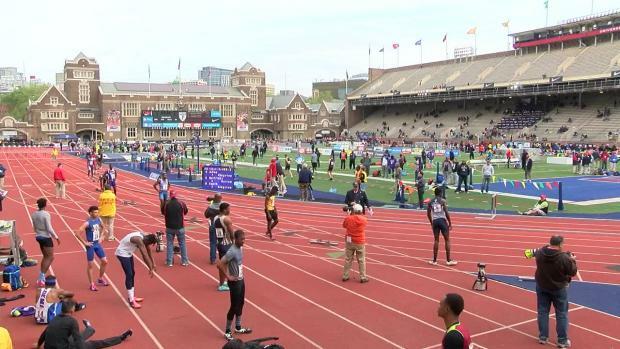 Stay up to date all weekend from Philly with your live updates here! 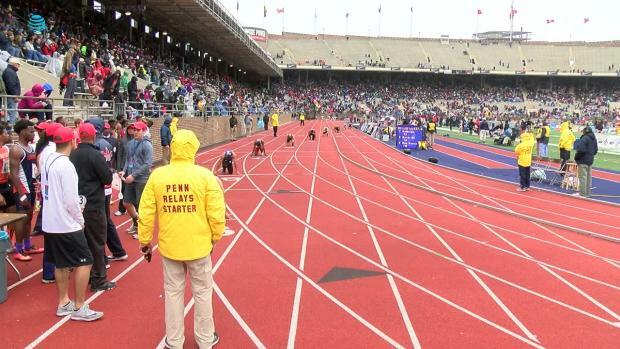 Check out the full list of Penn Relays entries from Pennsylvania high schoolers. 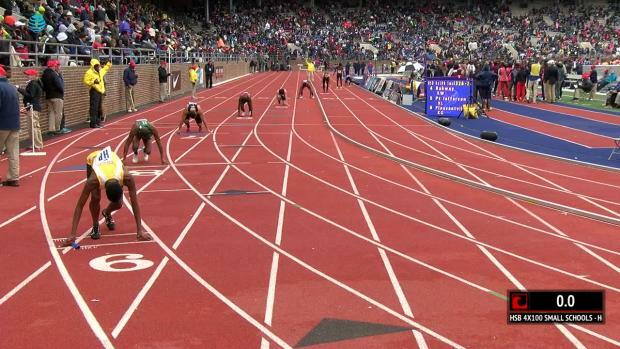 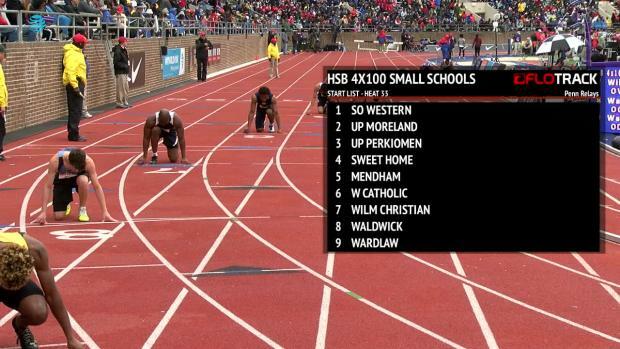 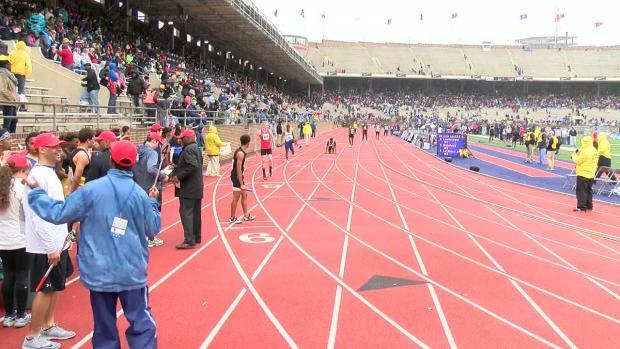 Which state can take home the ultimate Penn Relays bragging rights? 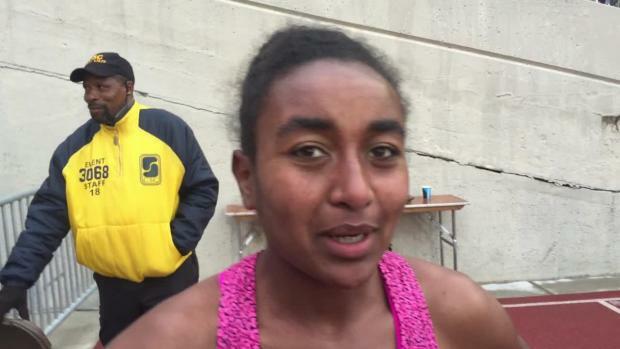 What happened to Obea Moore? 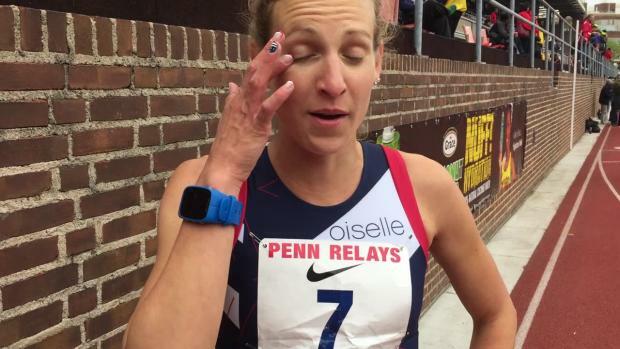 It was a huge weekend for some PA individuals who left Philadelphia with some brand new watches! 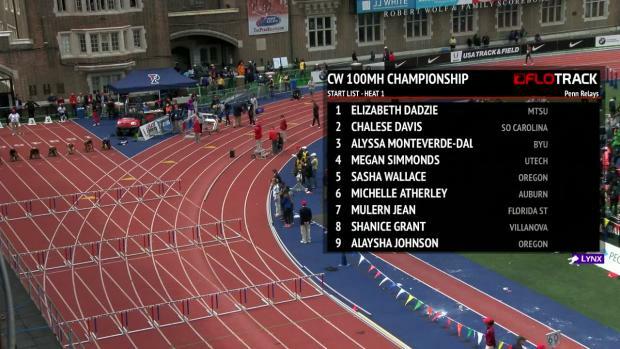 Some of the NCAA's best have a chance to join the NCAA's best of all time this weekend in Philly. 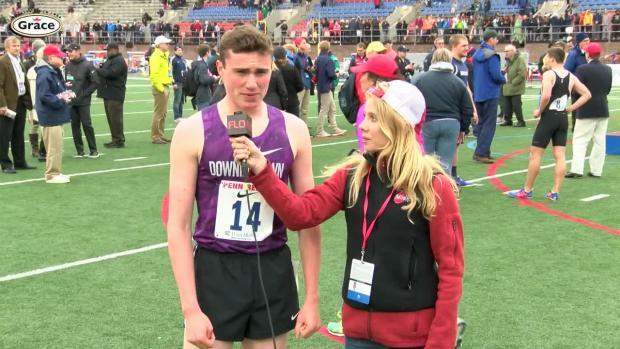 Jordan Geist (Knoch) and Josh Hoey (Downingtown West) won Penn Relays individual titles. 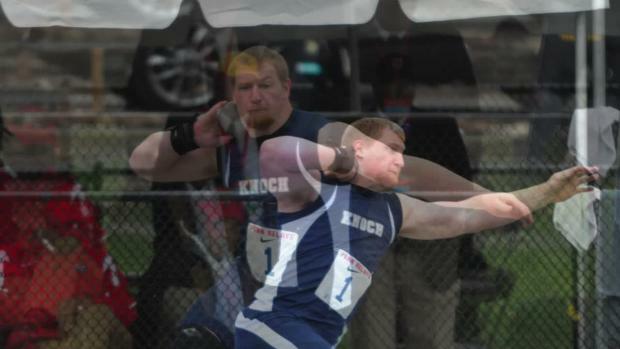 Geist broke his own state record in the shot put. 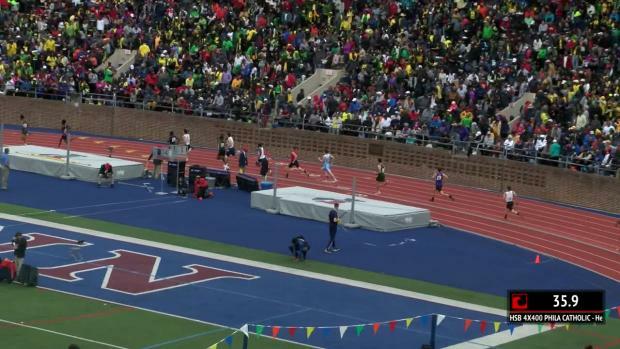 In the final COA of Friday's competition the tens of thousands of fans at Franklin field got the Drew Hunter and Loudoun Valley special. 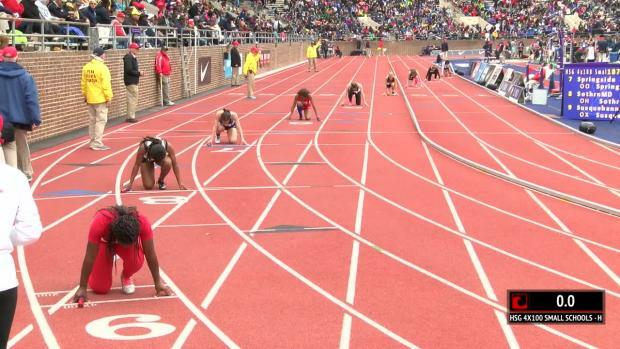 This is the year for VA, check out all the major contenders for our state over the next three pages. 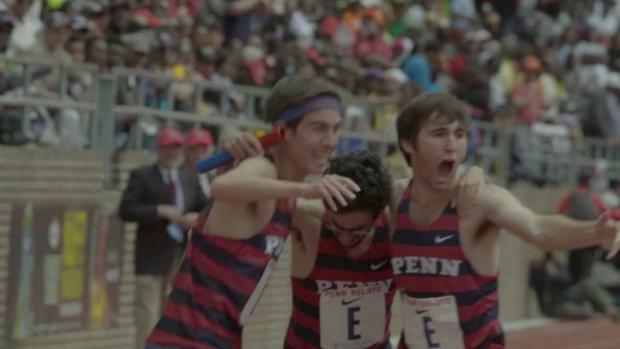 It's never easy taking home the title in the 4x800m at the Penn Relays. 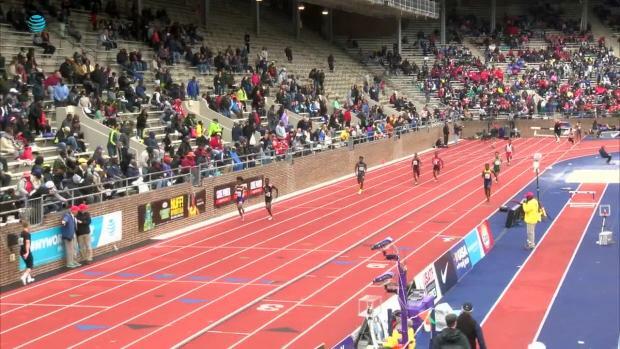 Day one recap for Team VA from Philly! 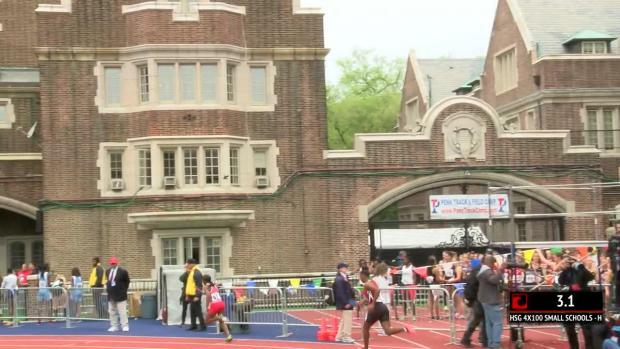 Check out the best performances from a decade of Penn. 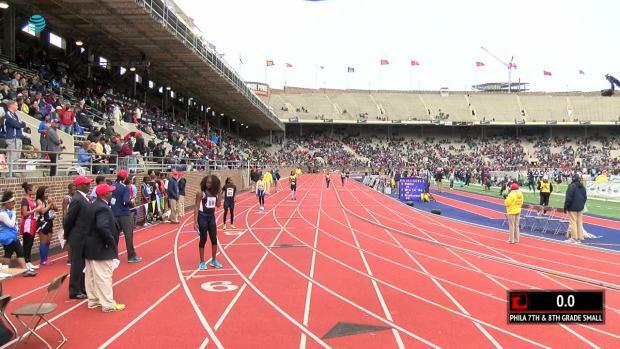 For many, winning a Penn Relays Championship of America Title is a once-in-a-lifetime accomplishment. 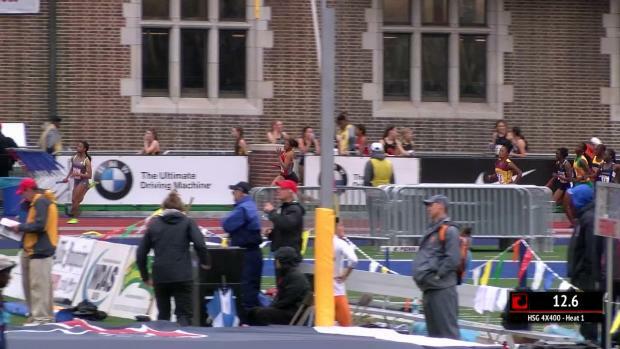 But for a pair from New York, it was all about getting a Gold Watch for the other arm. 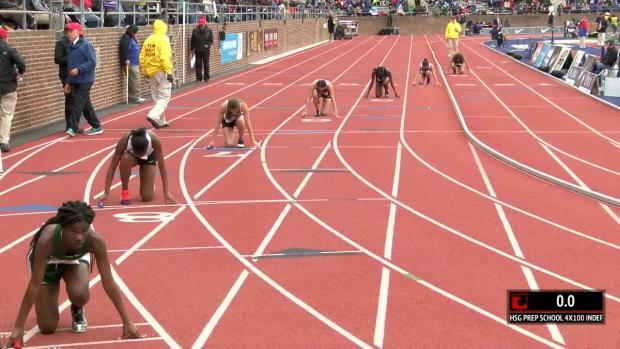 Get inside of the NCAA's top sprint programs! 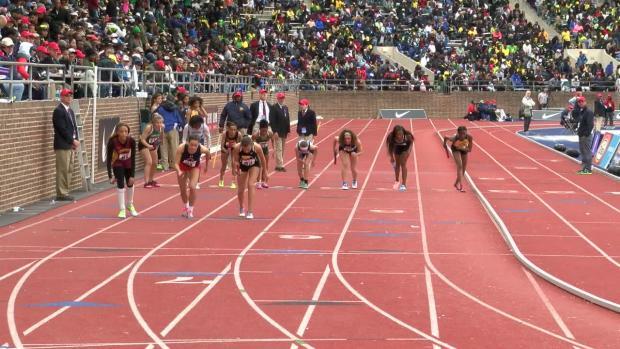 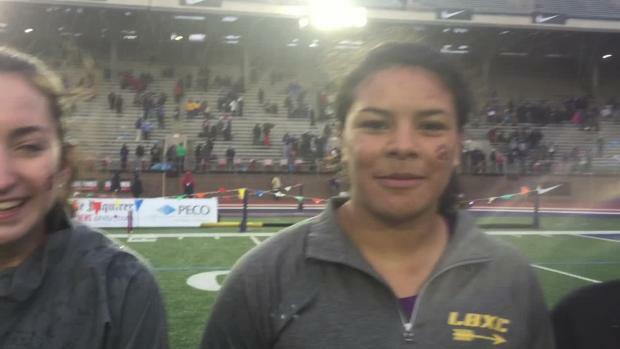 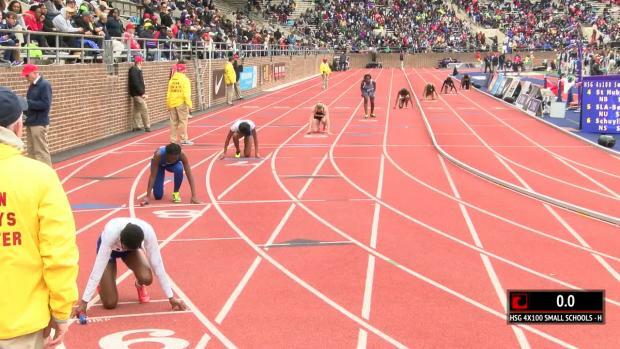 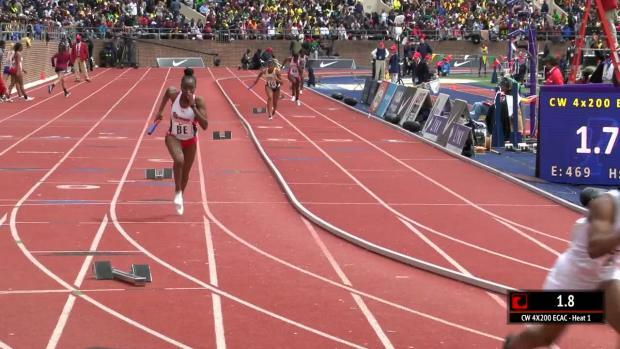 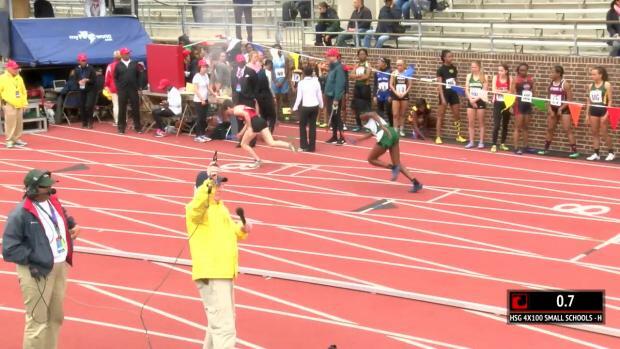 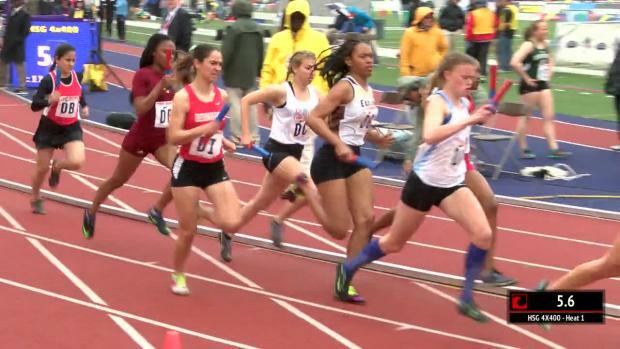 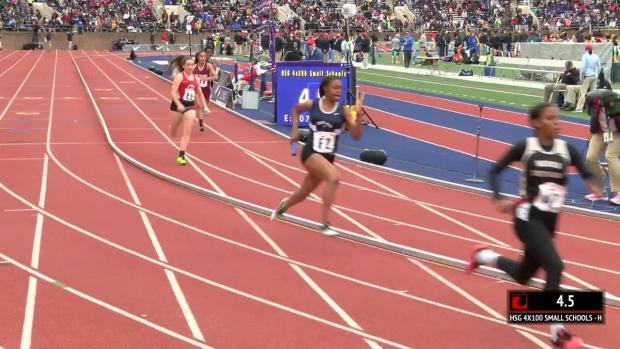 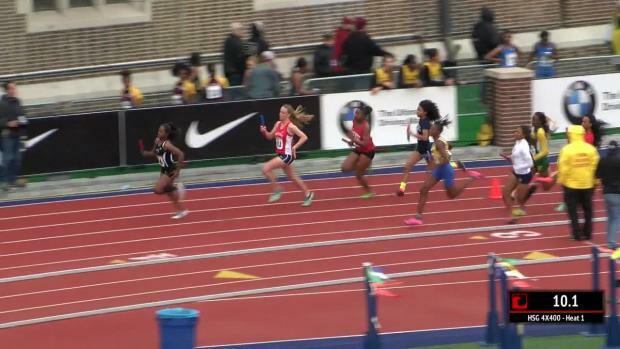 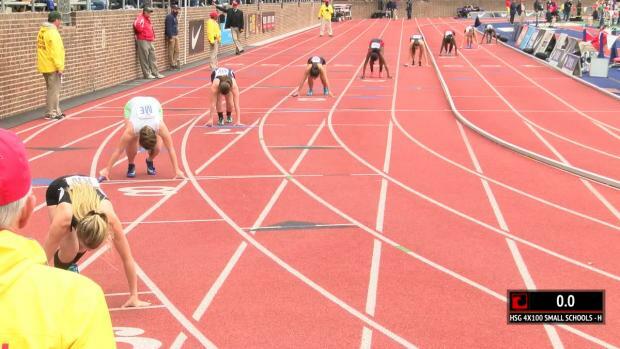 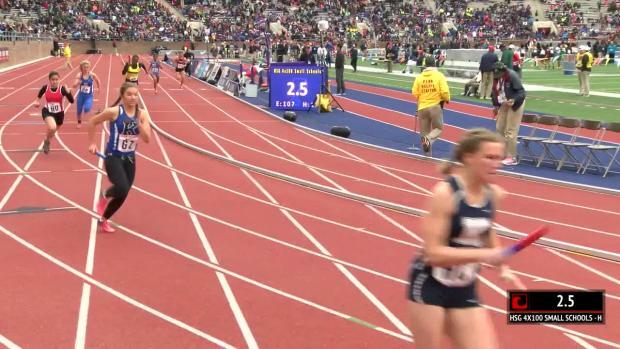 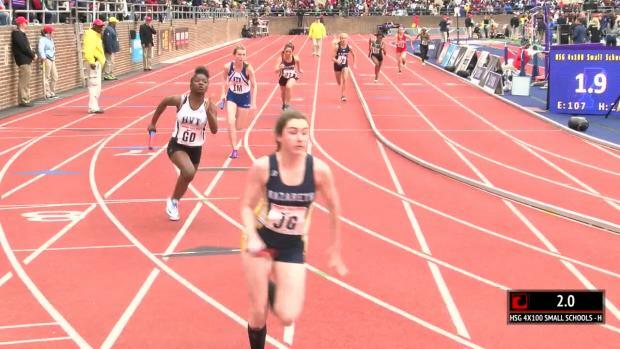 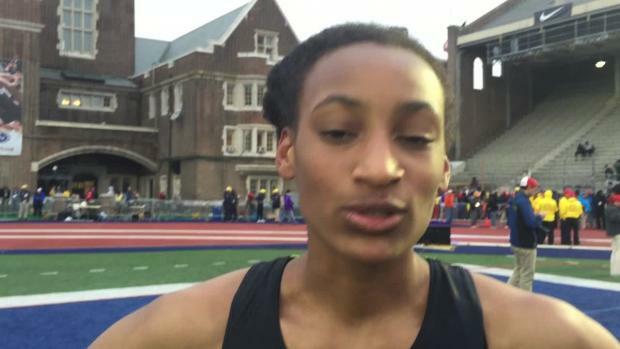 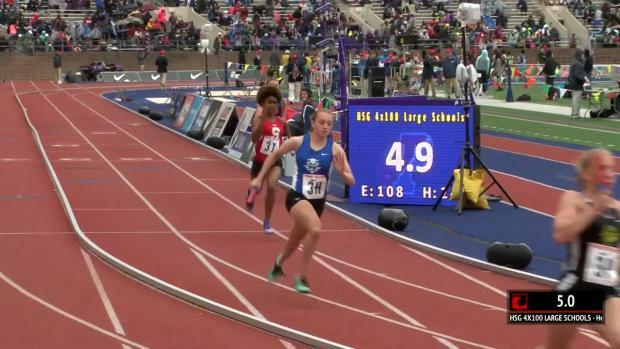 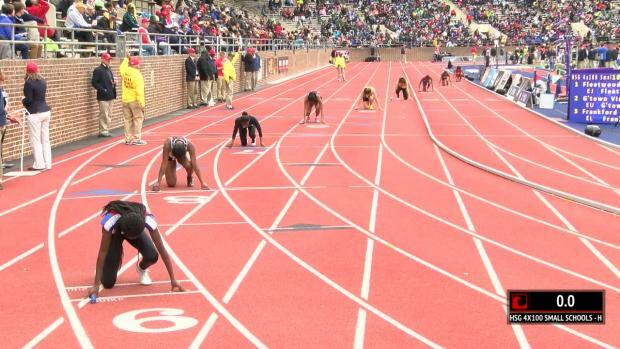 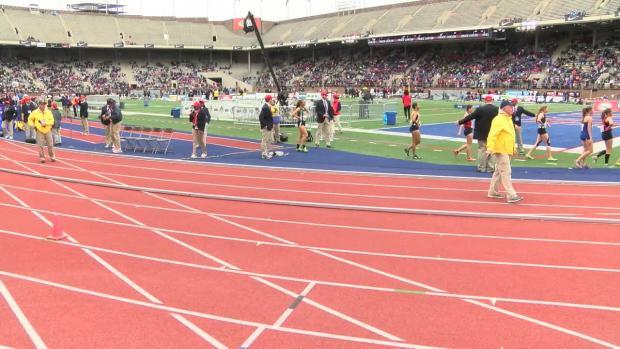 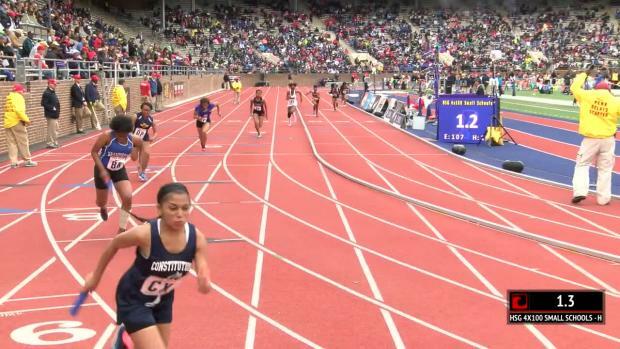 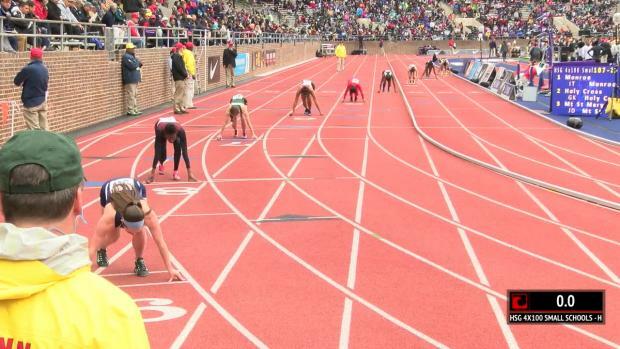 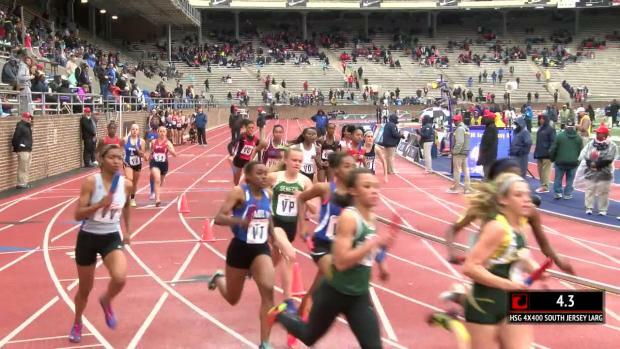 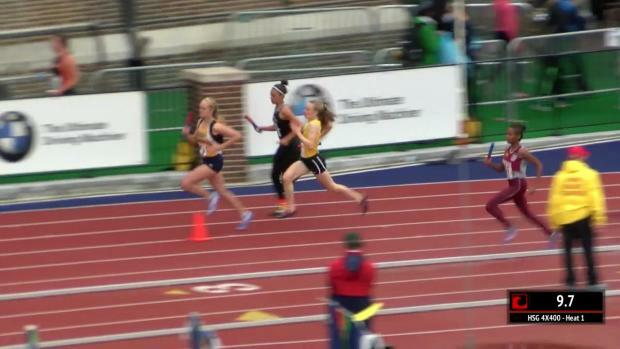 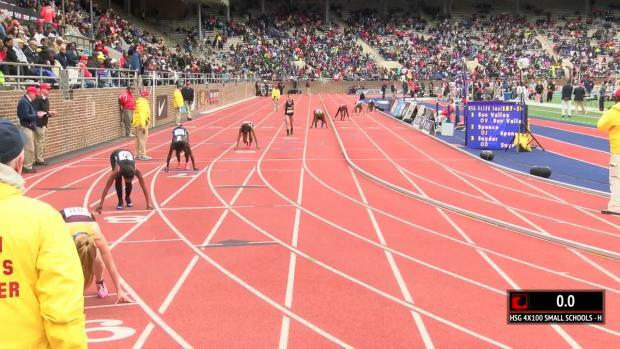 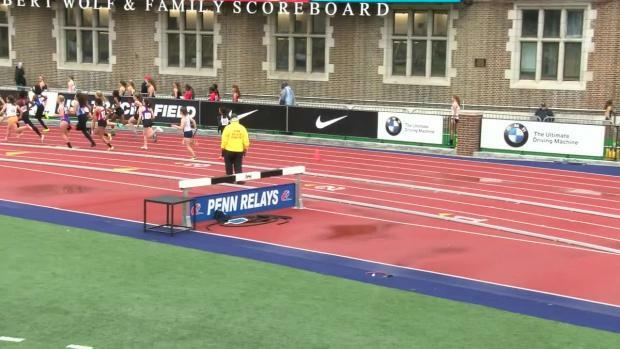 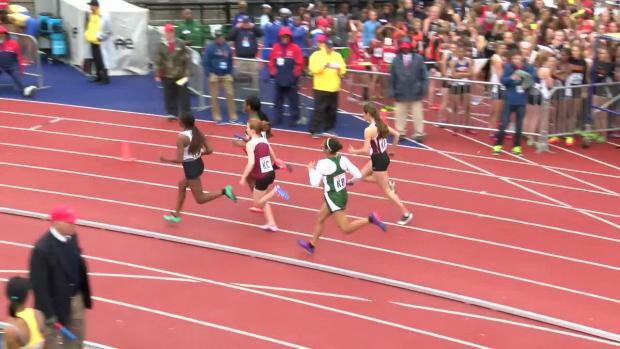 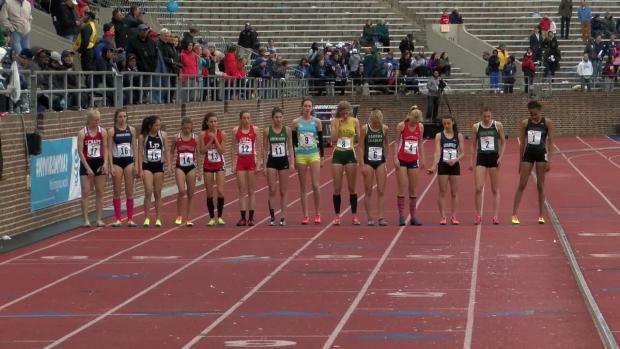 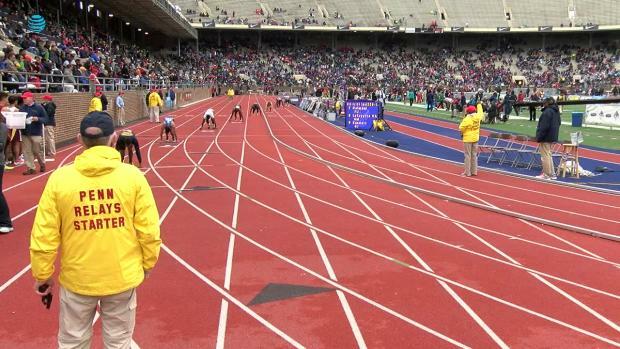 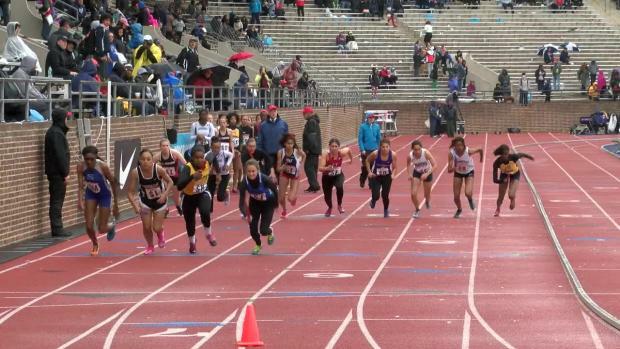 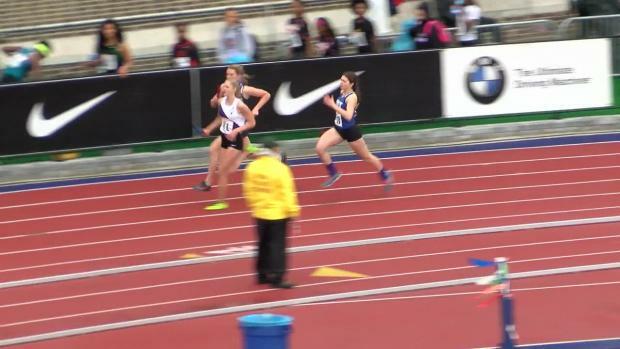 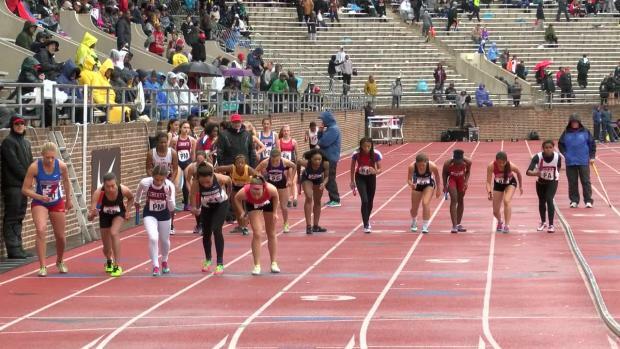 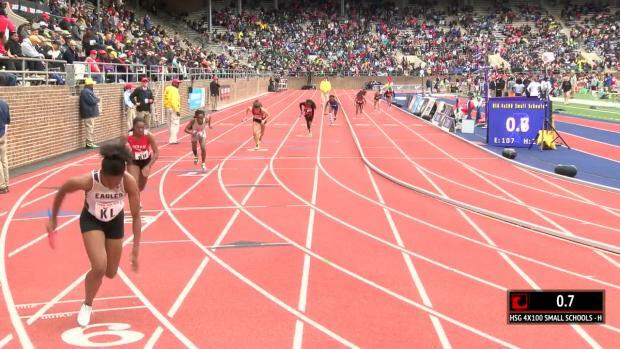 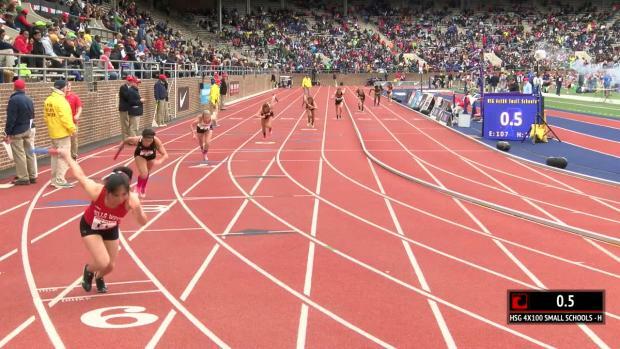 The Pennsylvania girls shined in the opening day of the Penn Relays! 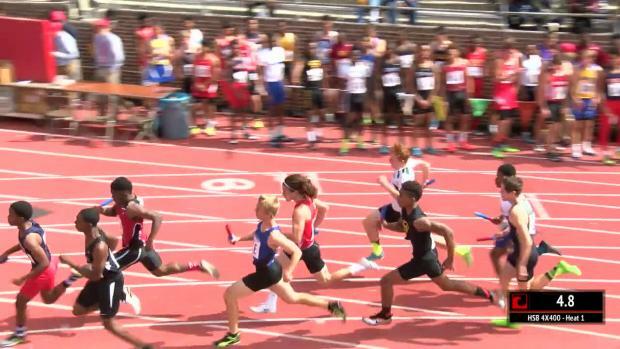 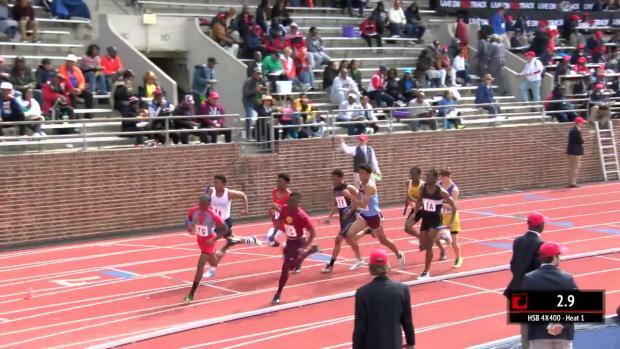 Compiled results for Maryland boys relays and individuals from the 2016 Penn Relays. 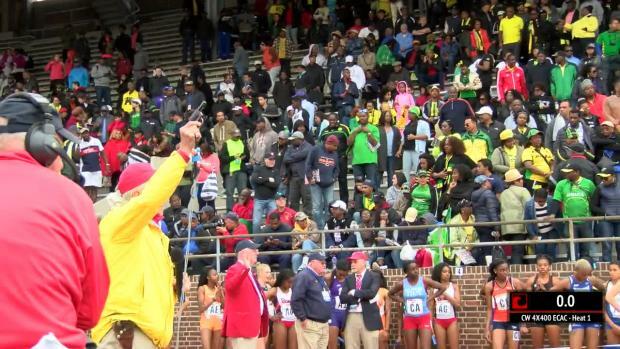 Watch the one and only champion dance! 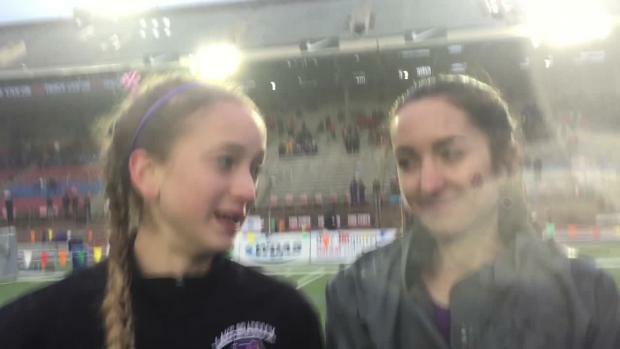 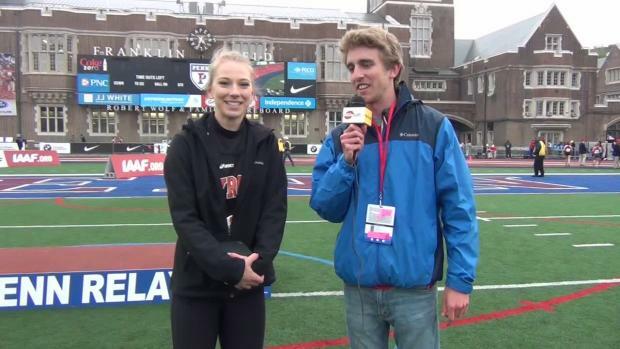 Gordon and Meg break down top college relay entries! 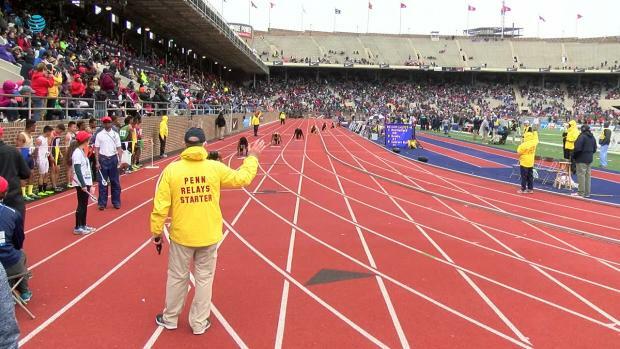 We've got all the races you want to see, and then some, from the Penn Relays. 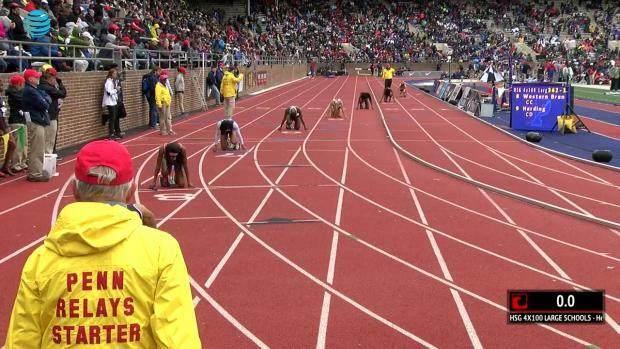 Below are all the COA races from Day 1. 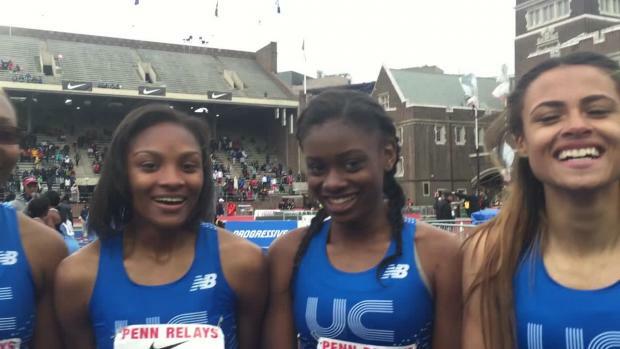 The Union Catholic girls took to the track ready to go head to head with top Jamaican and American teams in the Championship of America 4x400 meter on Friday at Penn Relays. 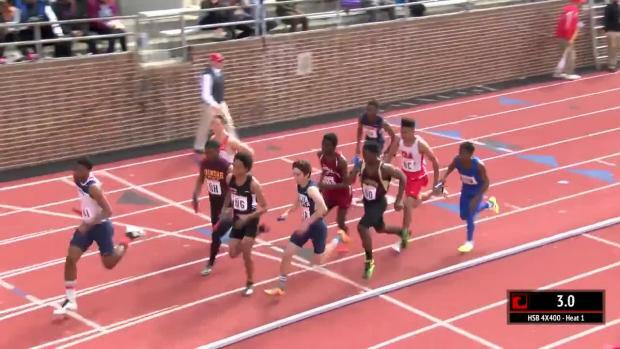 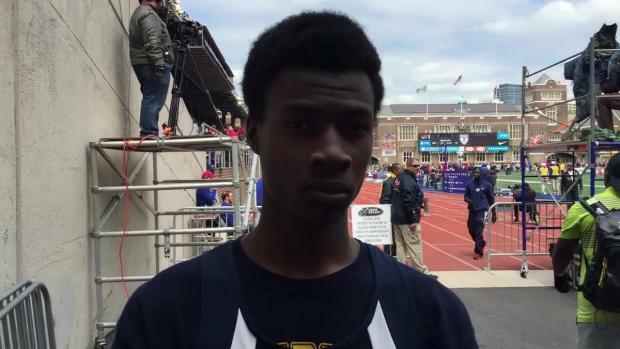 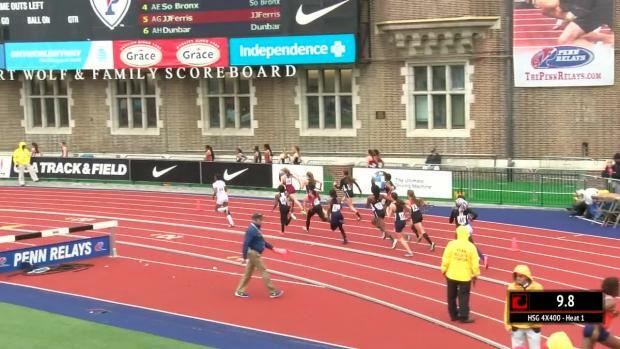 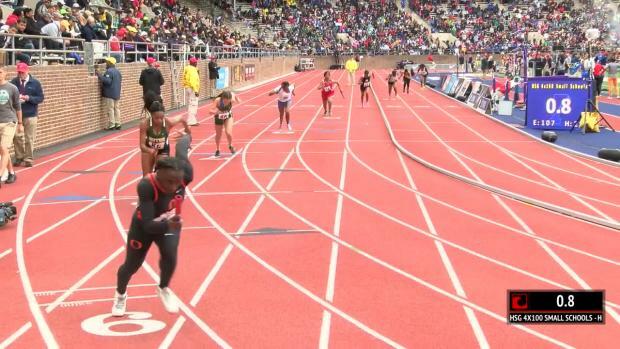 Highlights from Thursday at Penn Relays. 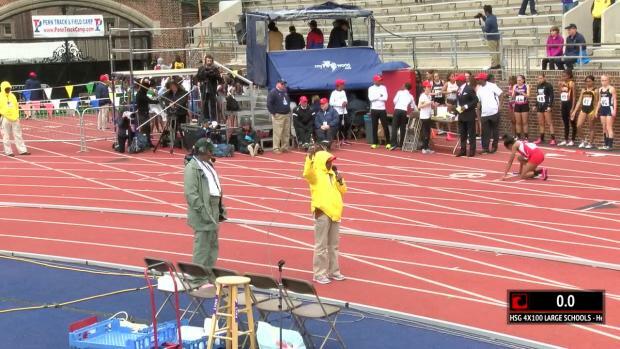 Ida Keeling continues to tear it up after ten decades in the game. 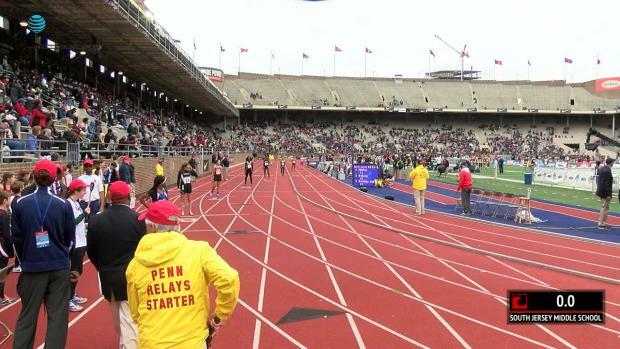 A look at the Ohio athletes and relay teams competing at the 2016 Penn Relays. 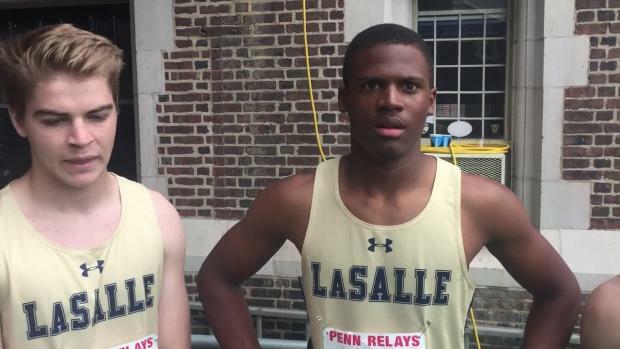 Check out who got the invite for the high school 4x800 and DMR for next week's Penn Relays in Philadelphia. 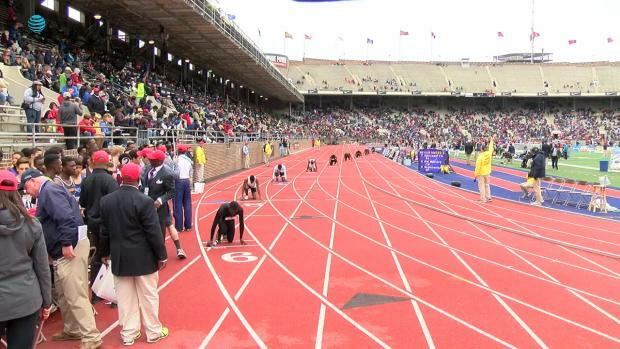 On a cool, final Saturday in April each year, the longest event of the Penn Relays gets underway. 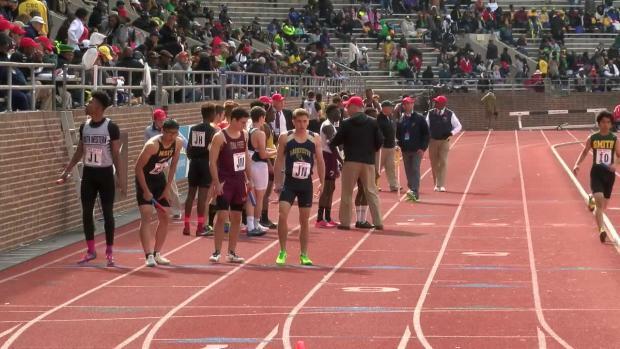 Rams just .001 from Loudoun Valley and Drew Hunter, finish second with state record of 10:00.04. 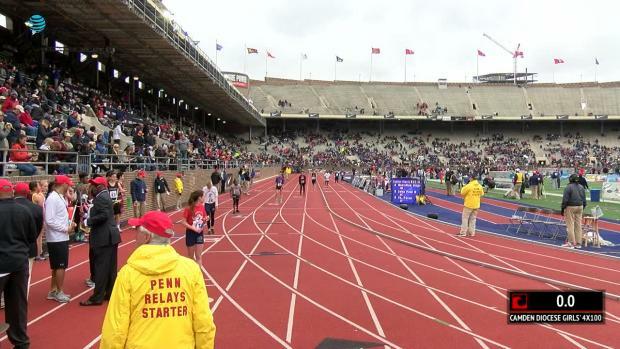 State College had a big final day at the Penn Relays. 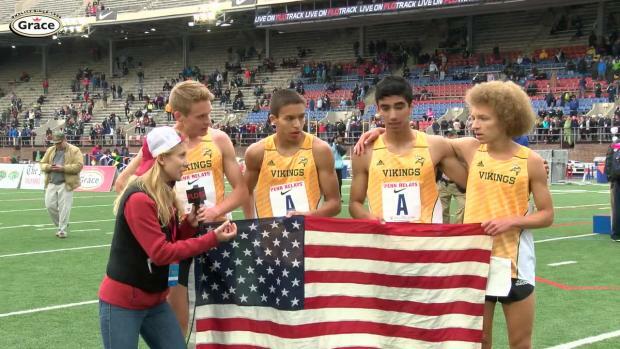 Griffin Thompson won the pole vault, while the boys' 4x800 took fourth in a US#2. 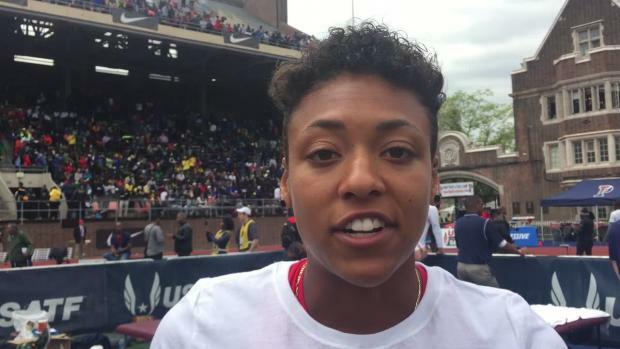 Former Texas A&M standout Olivia Ekpone is no stranger to the Penn Relays - the Maryland native raced here in high school and won wheels as an Aggie. 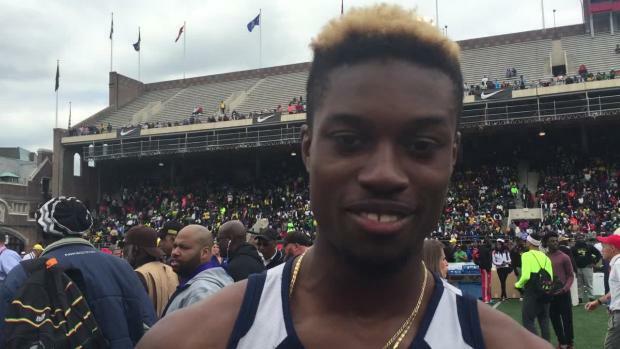 Now based in Austin, Texas, Ekpone talks about racing the 4x100m and 4x200m for Team Nigeria and pursuing the Olympic Games this summer. 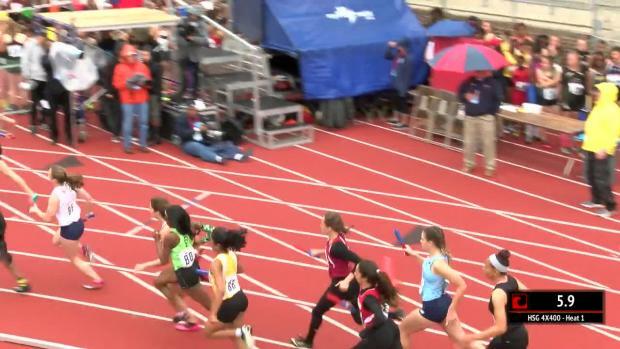 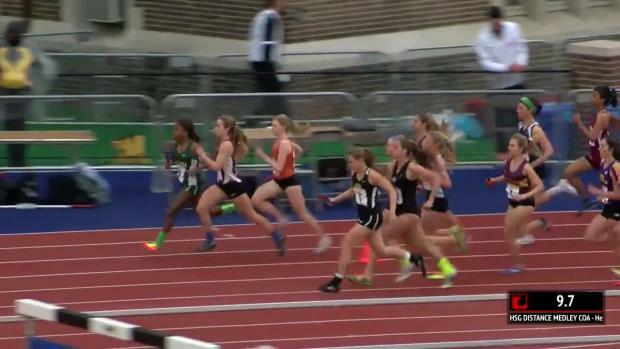 Compiled results for Maryland girls relays and individuals from the 2016 Penn Relays. 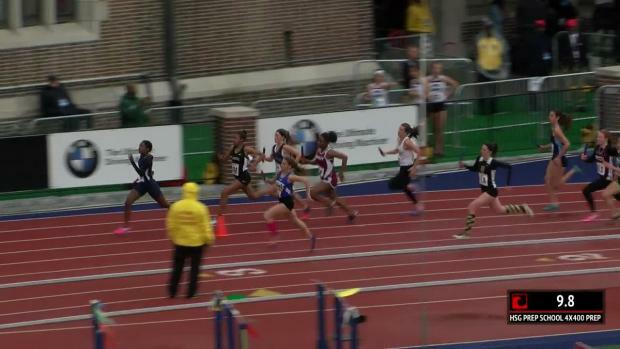 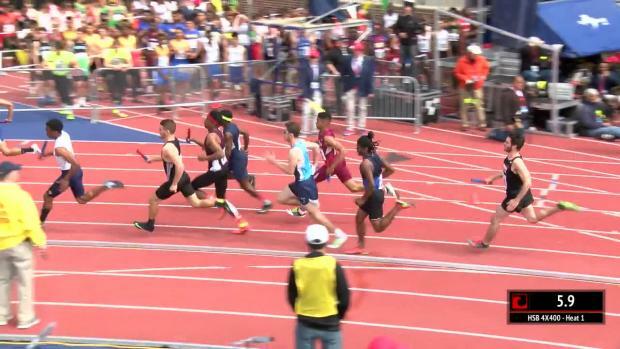 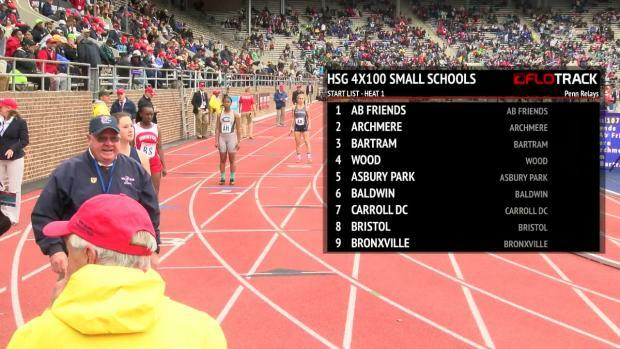 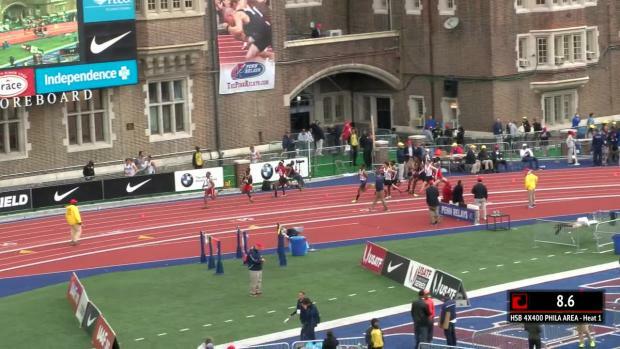 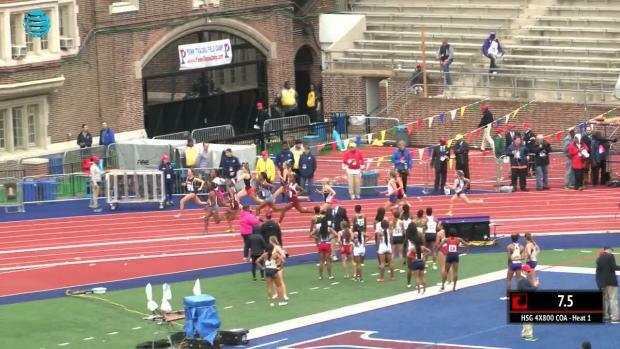 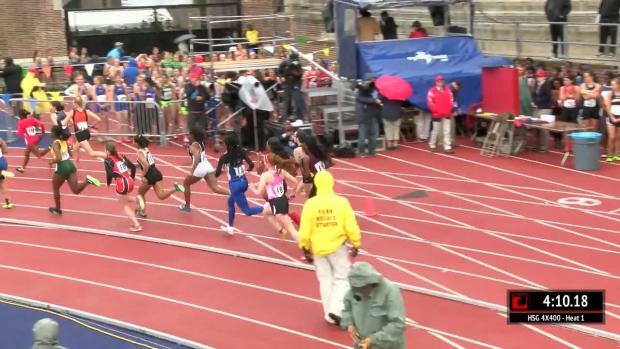 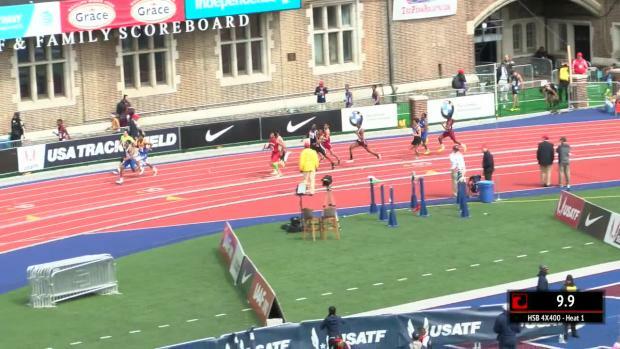 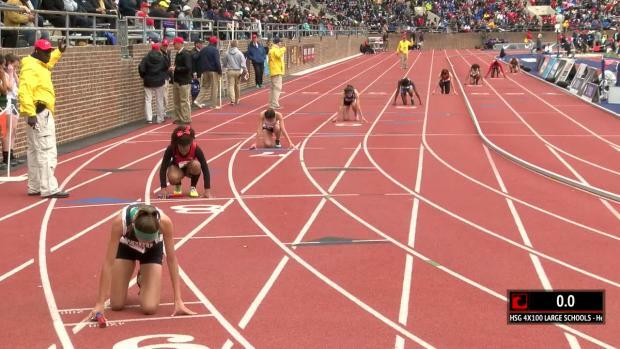 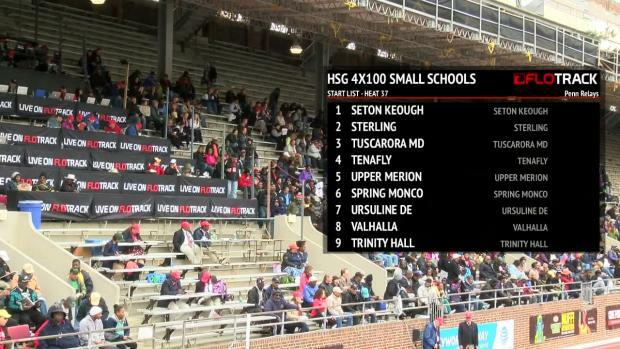 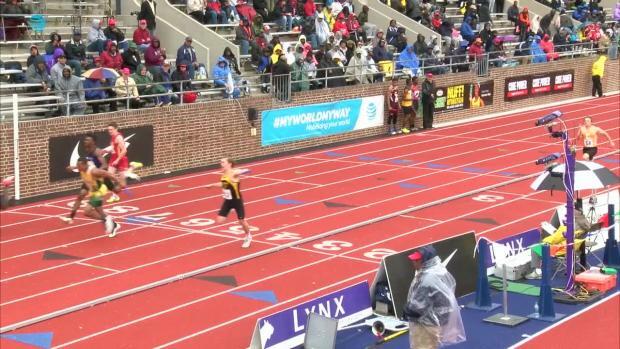 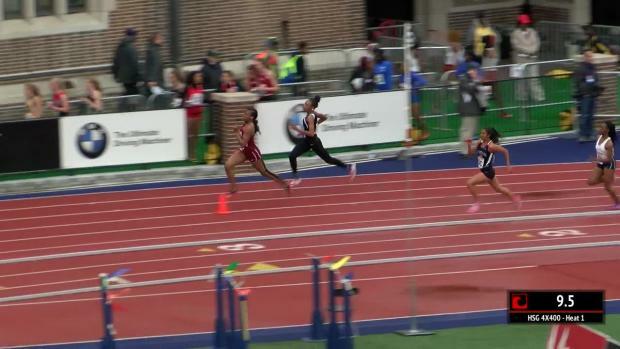 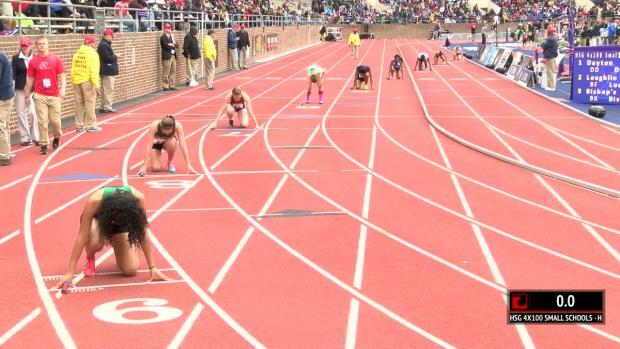 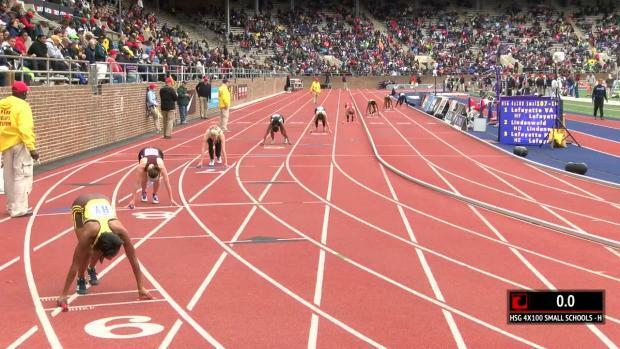 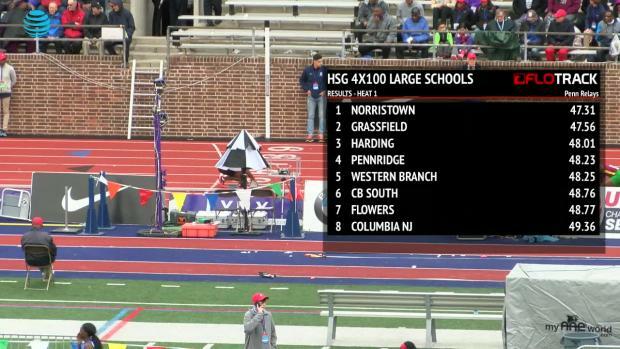 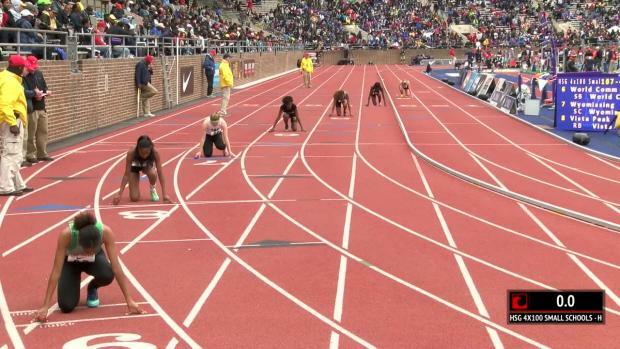 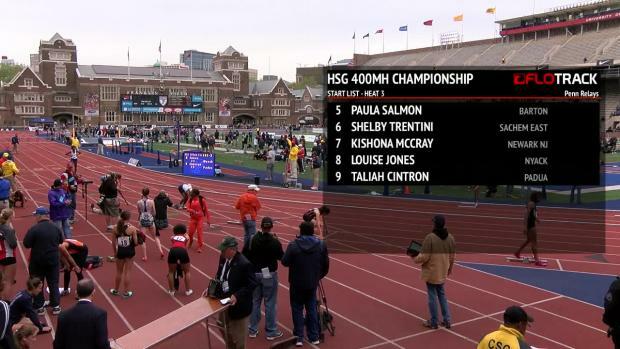 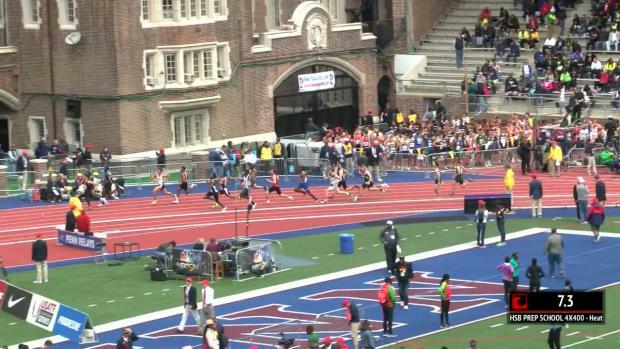 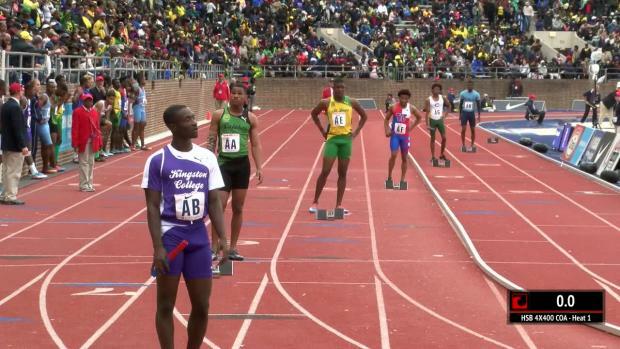 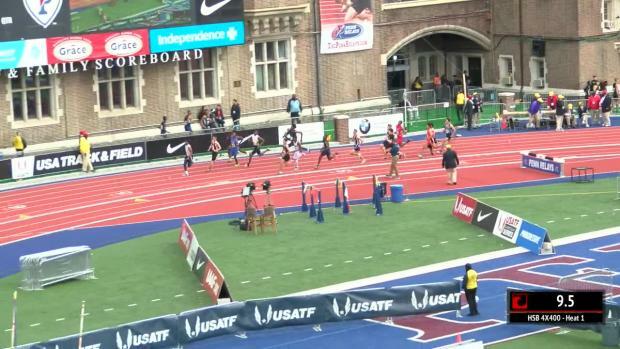 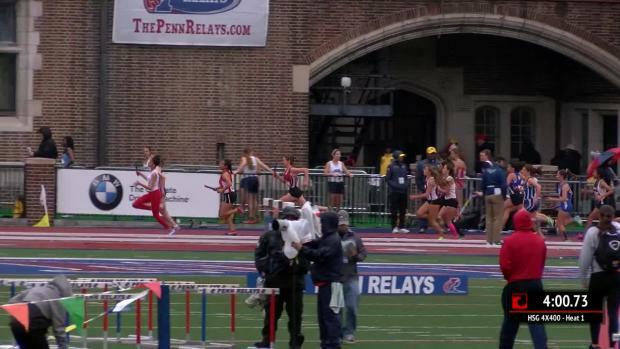 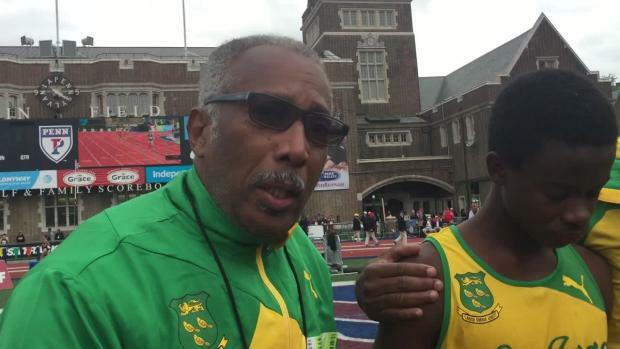 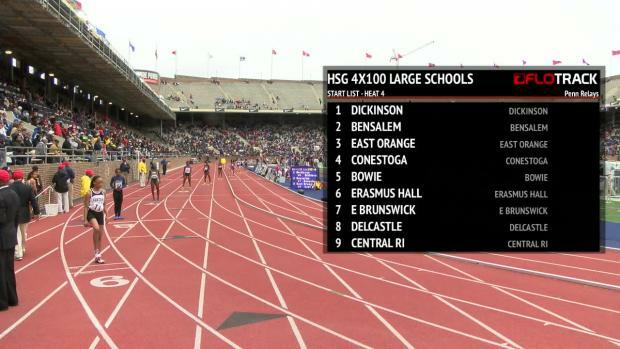 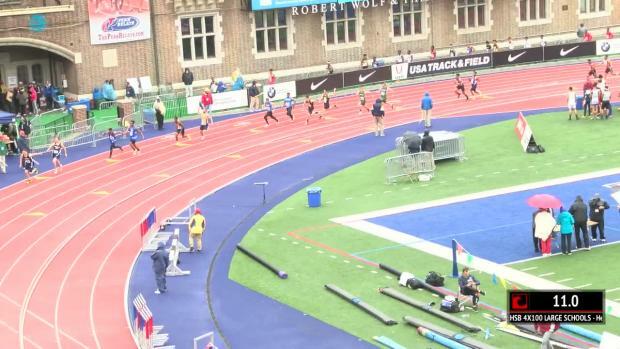 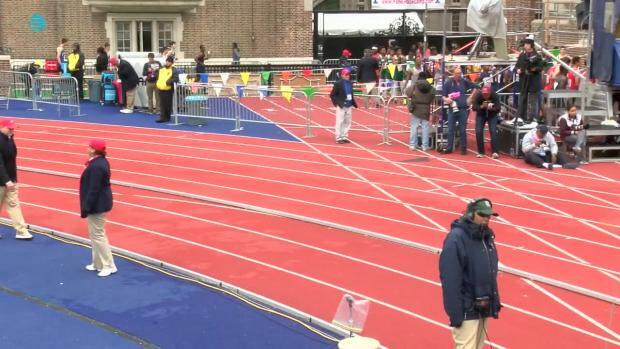 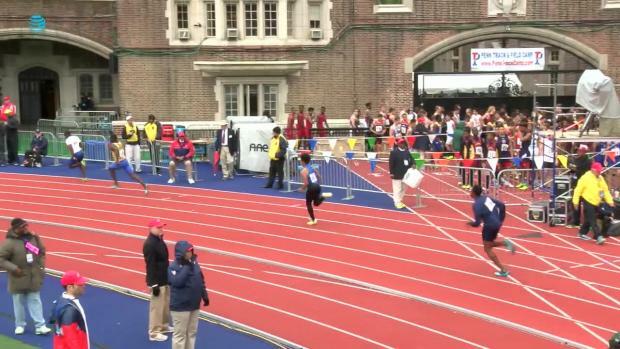 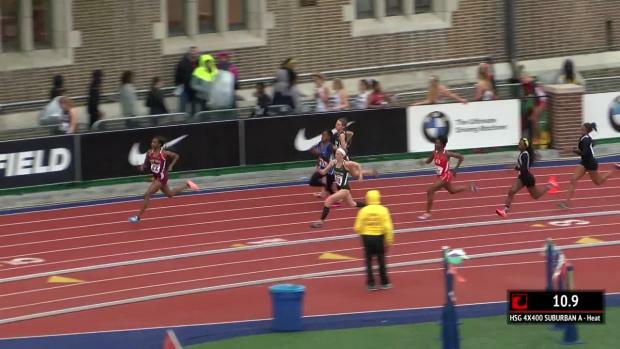 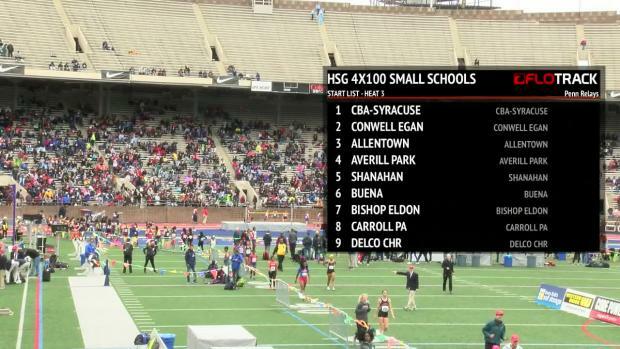 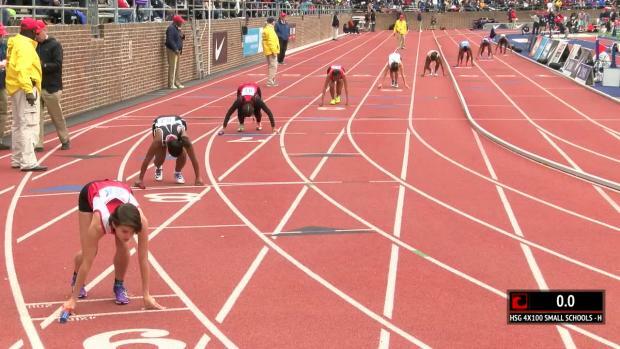 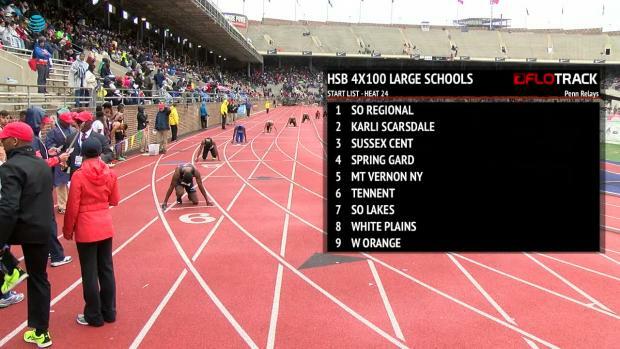 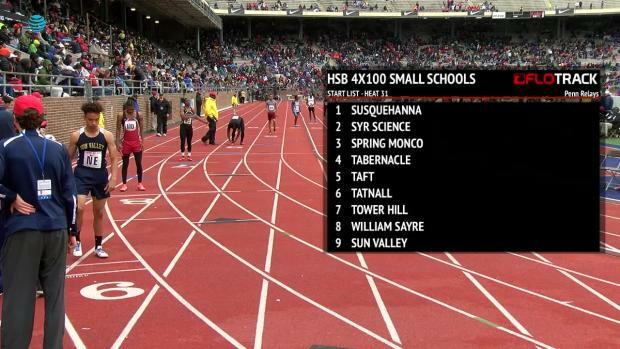 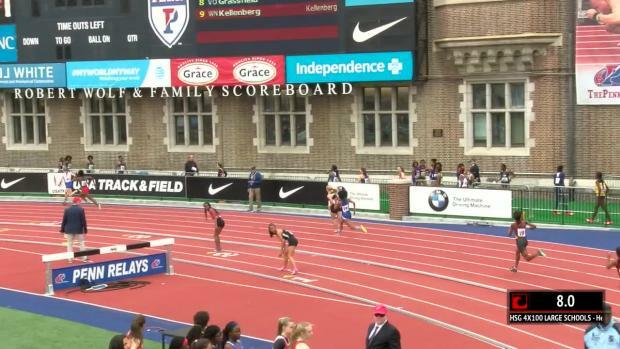 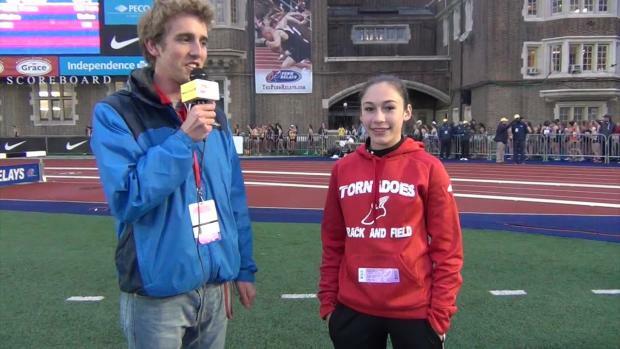 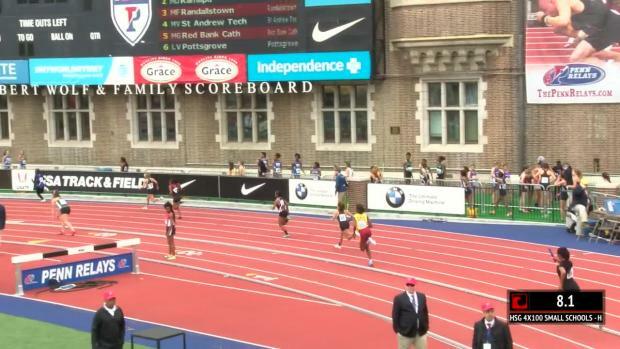 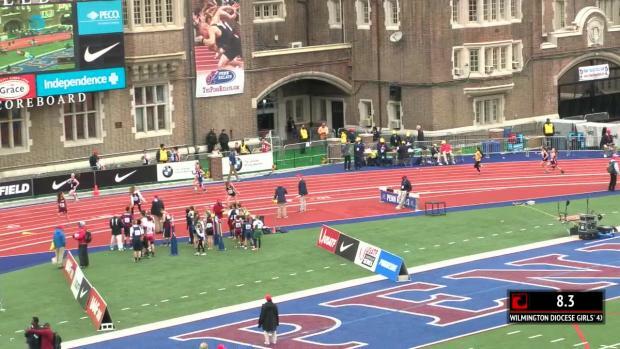 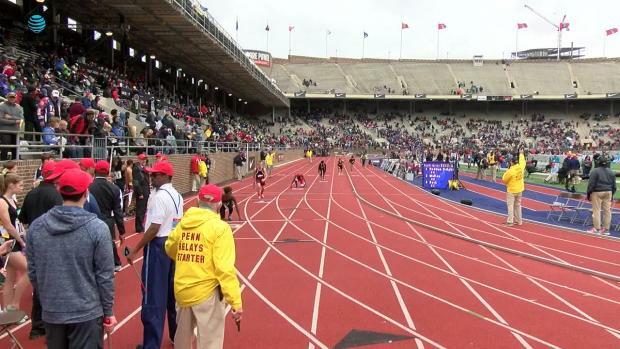 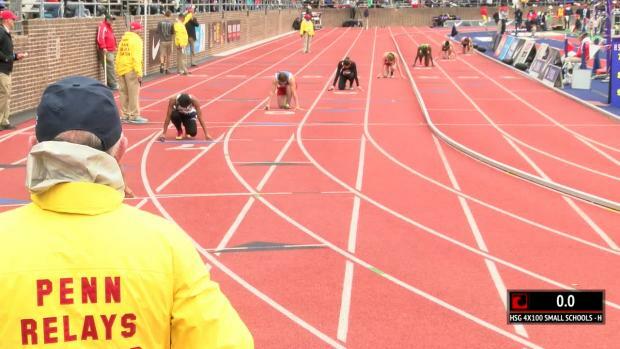 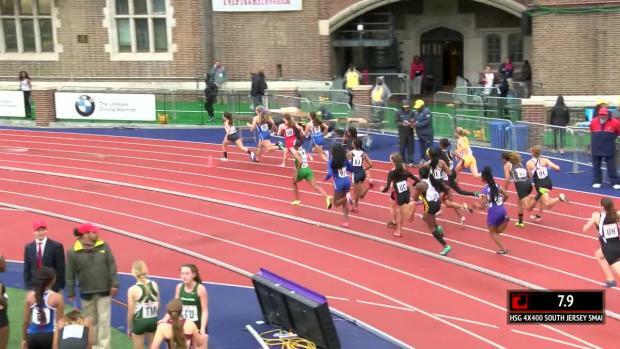 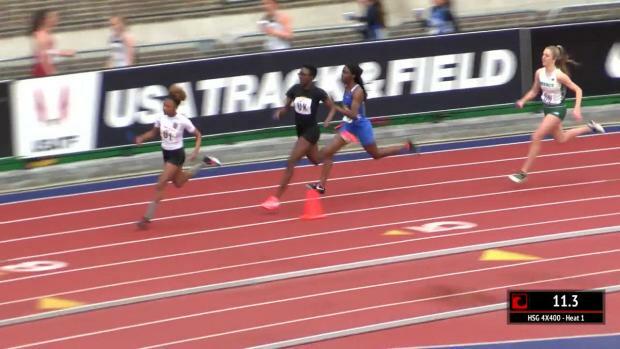 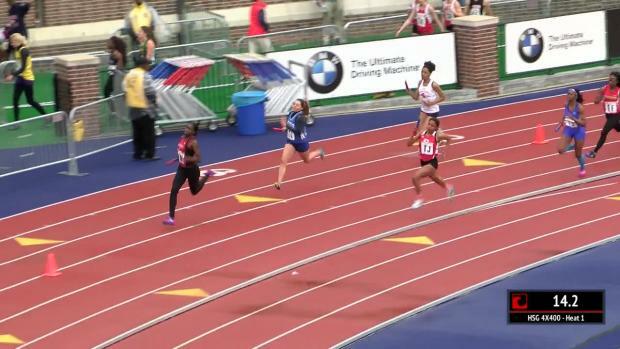 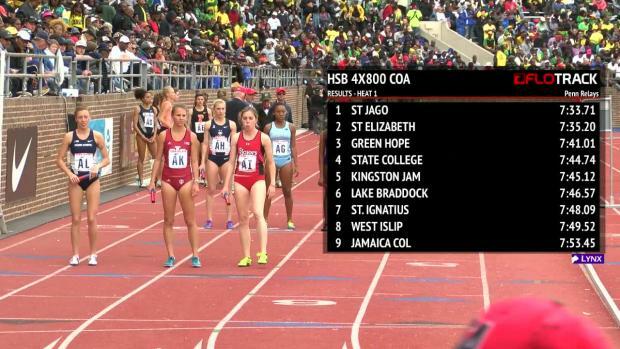 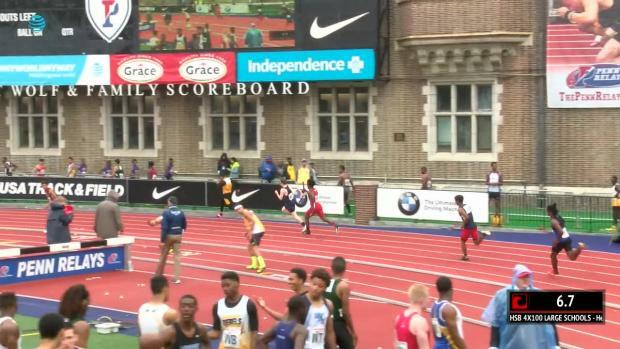 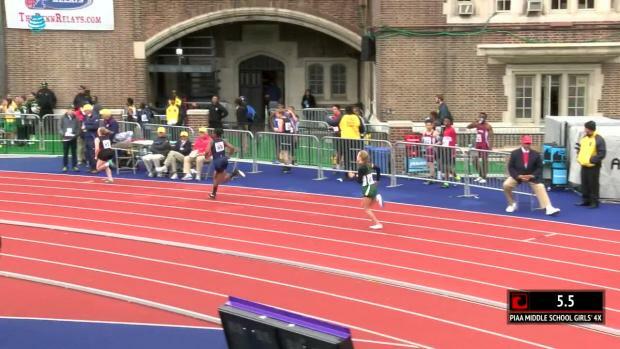 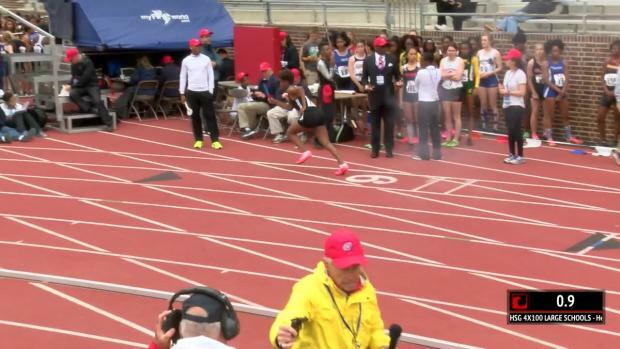 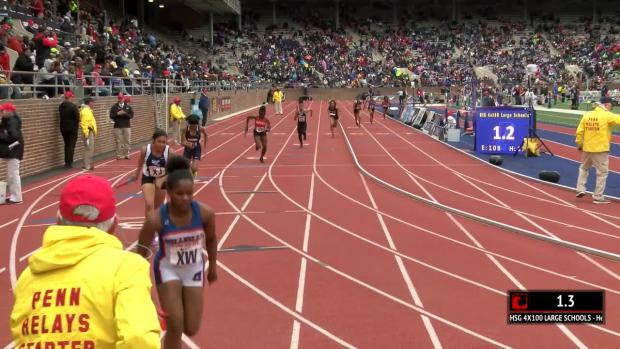 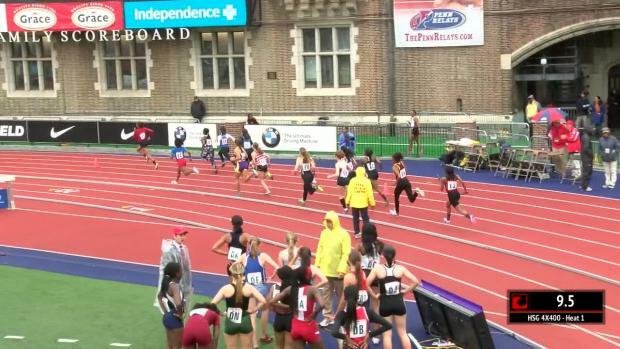 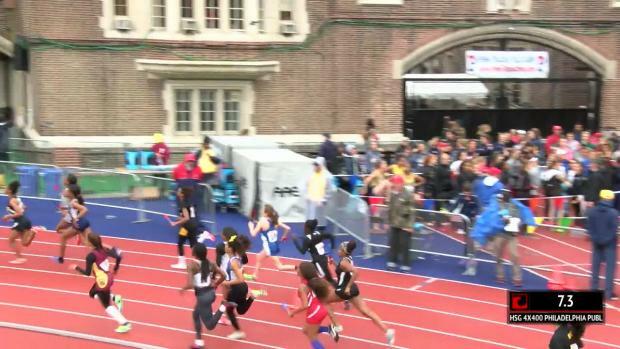 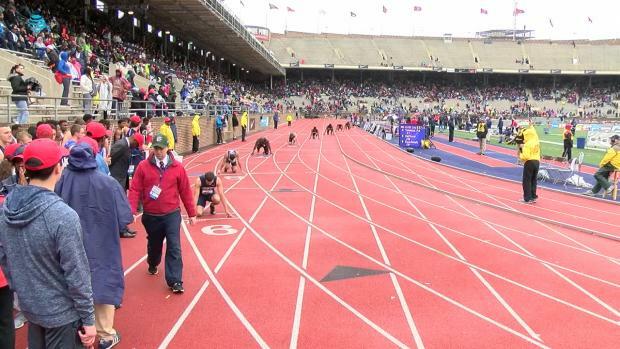 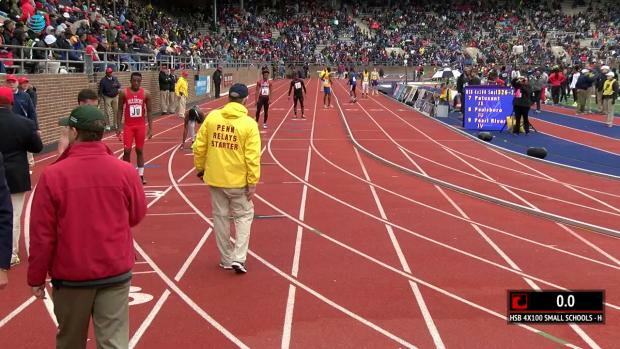 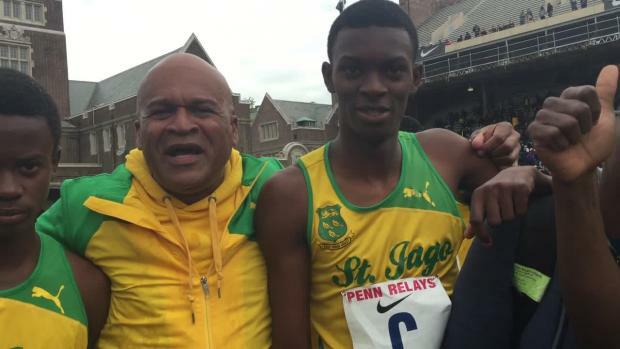 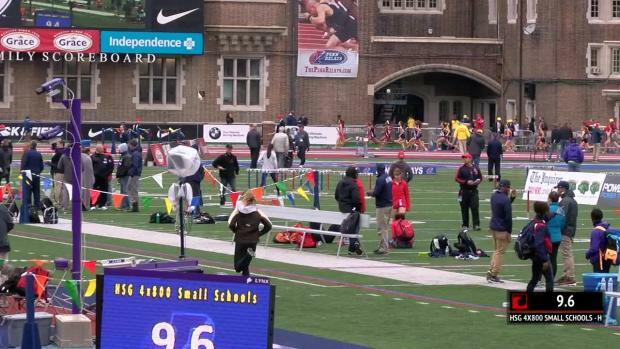 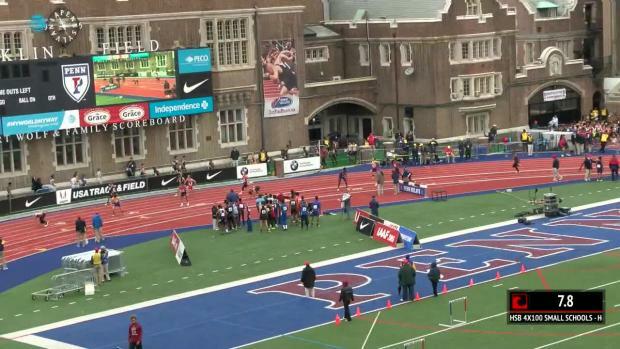 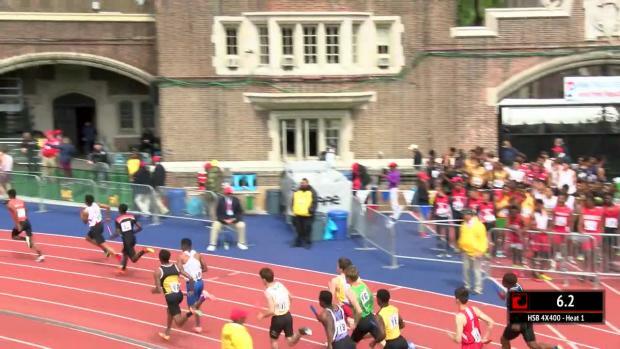 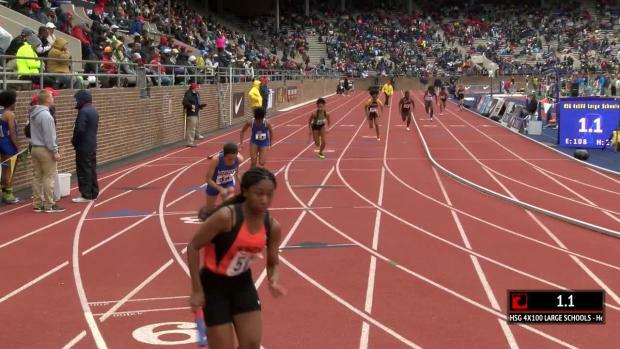 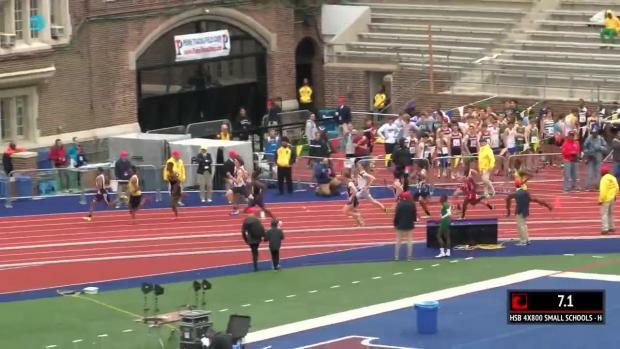 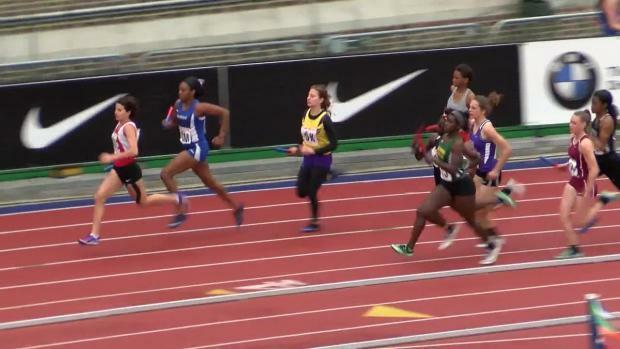 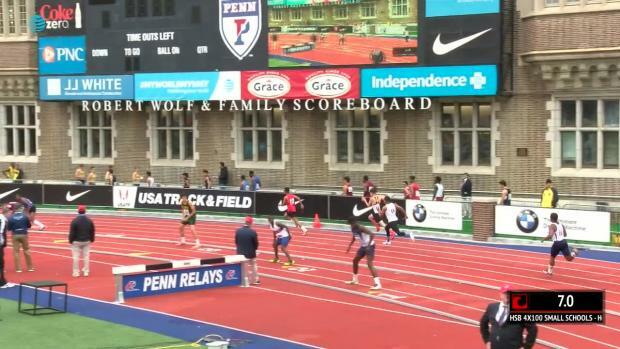 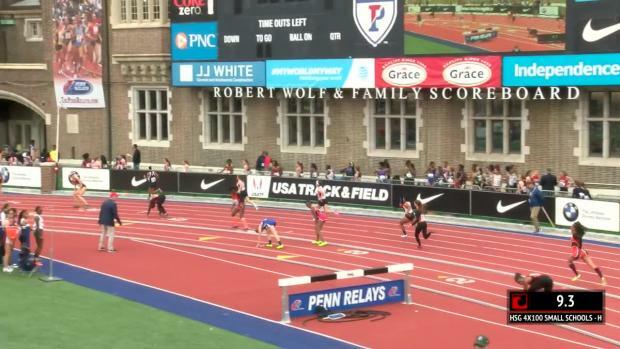 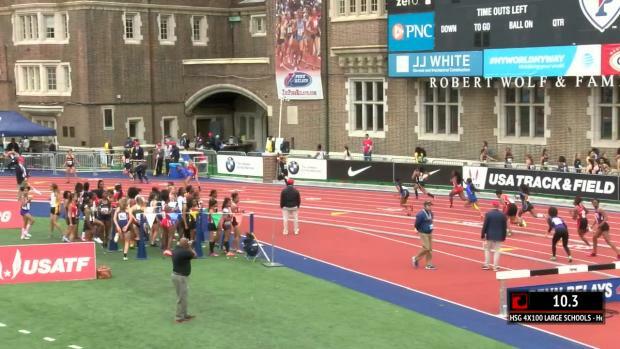 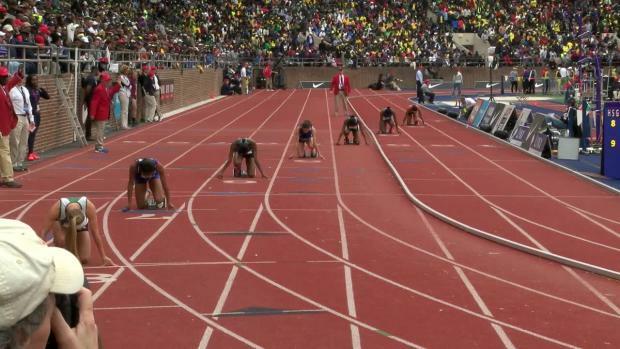 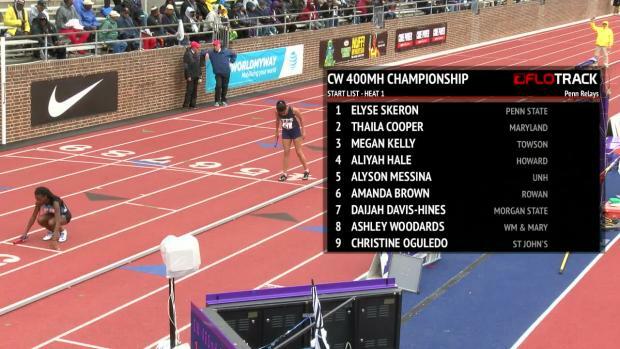 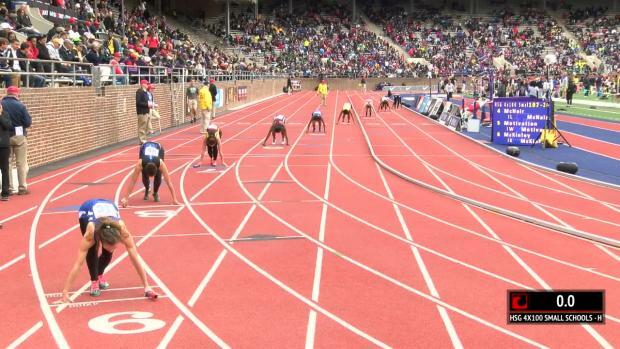 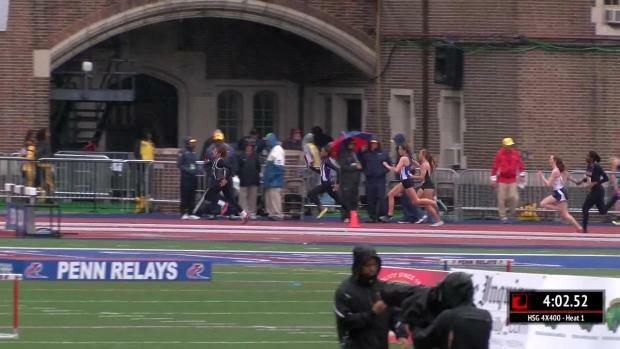 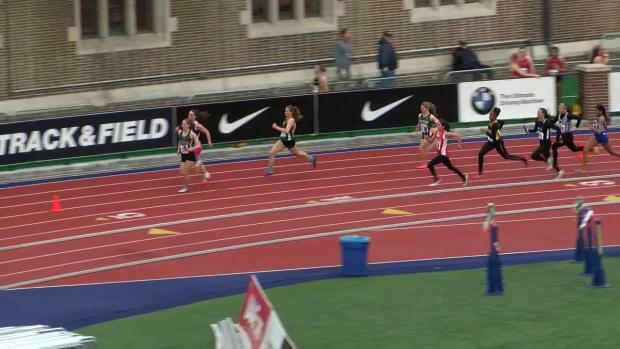 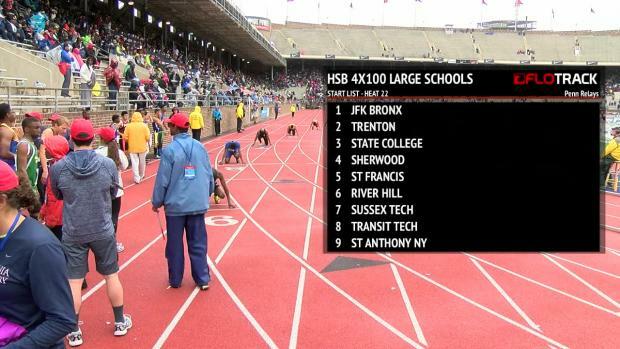 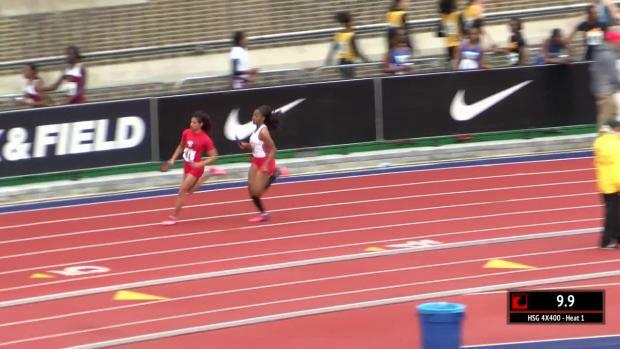 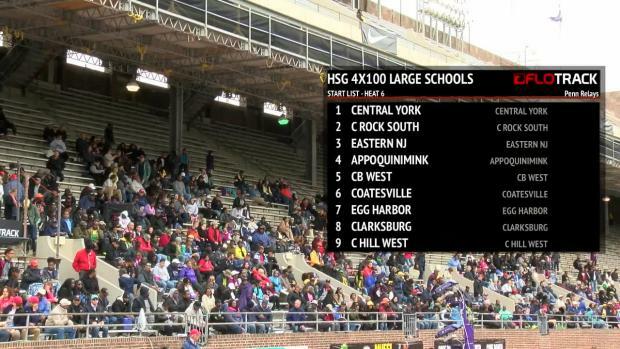 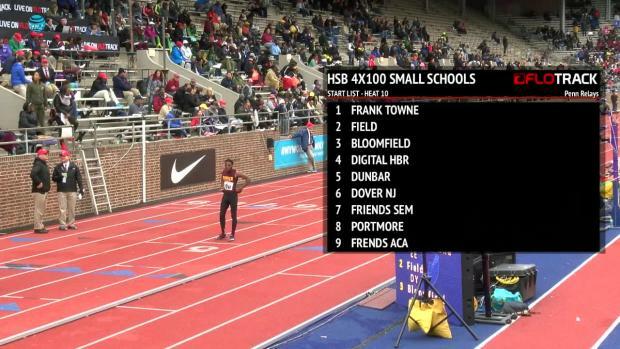 Can watch all the archived high school races from the Penn Relays uploaded now on MileSplit.com! 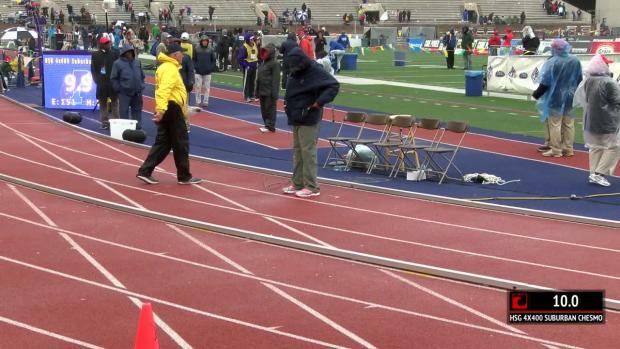 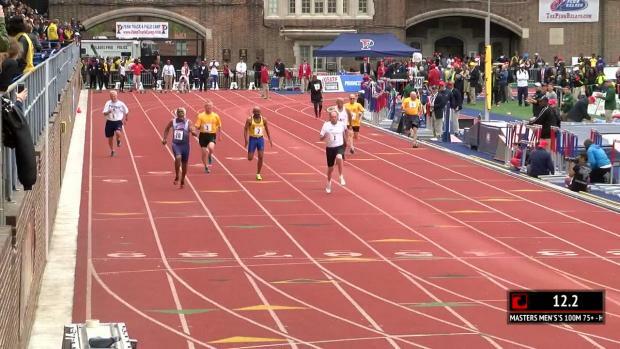 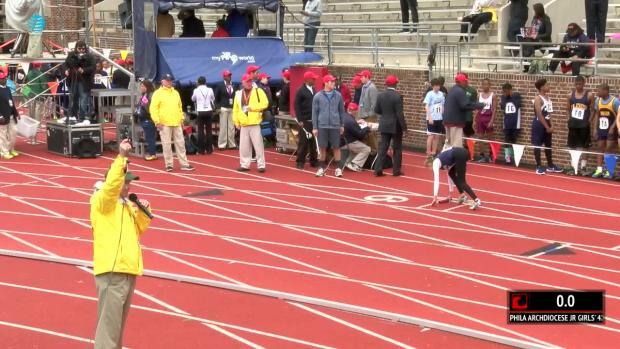 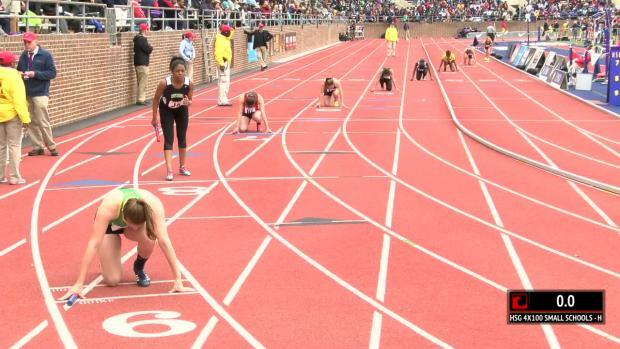 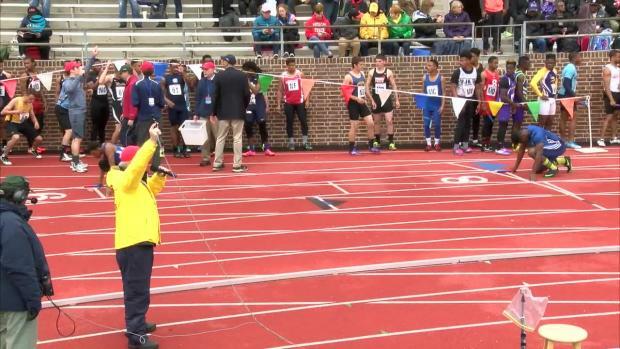 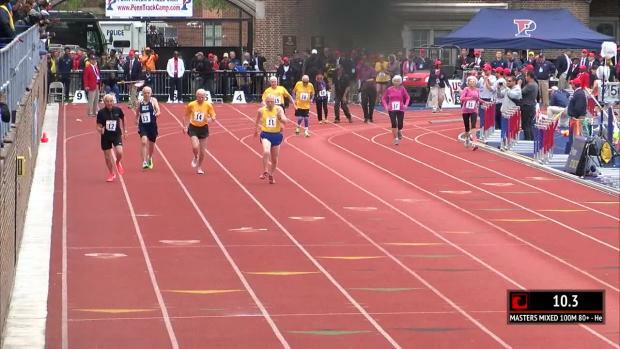 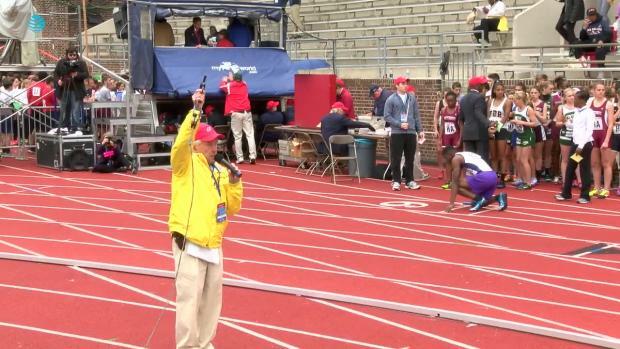 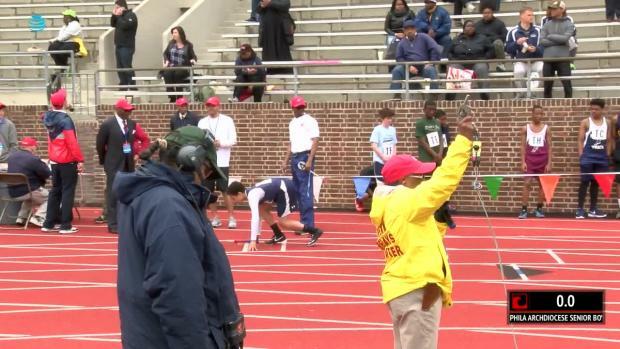 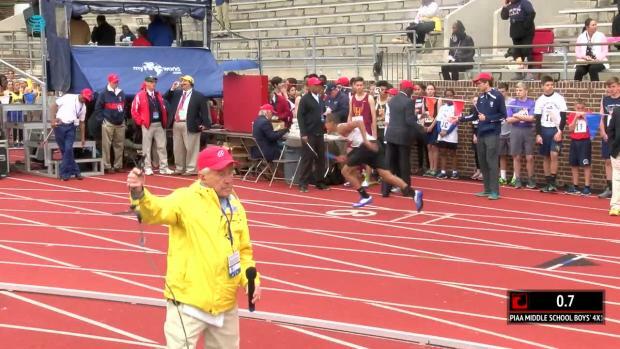 We talked with the 99-year-old sprinter before Penn. 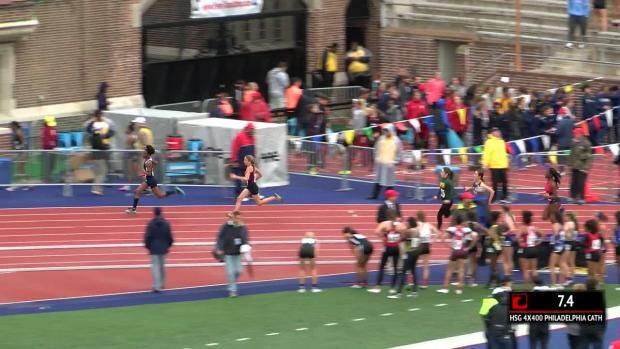 Meg and Jojo are hyped to be at Franklin Field! 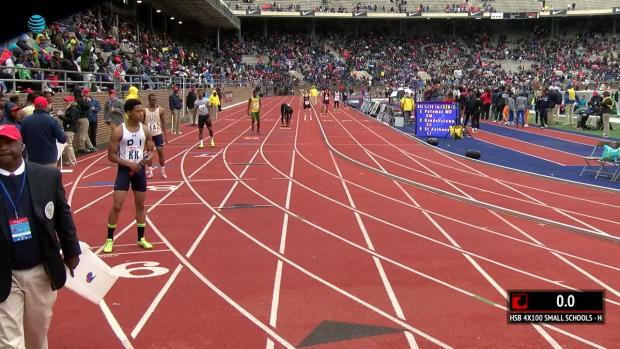 We dig deep into the MileSplit database to bring you some All-Time Rankings abroad. 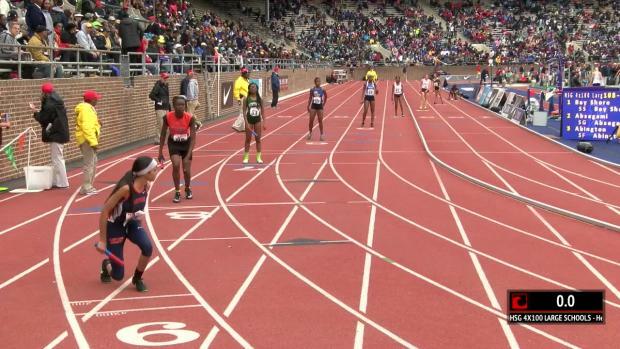 Here are the best marks of the past decade and a half at Penn Relays for the Individual girls. 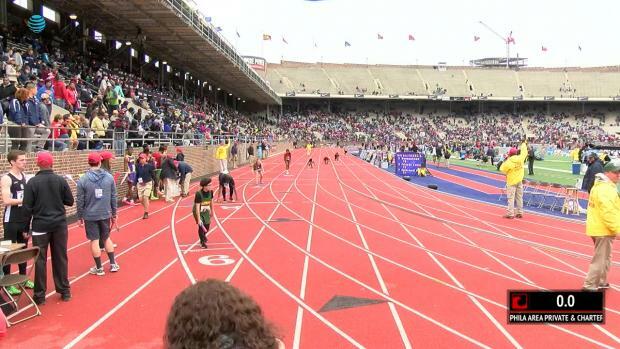 See what you have to run to make some noise at the biggest Track Meet in the World. 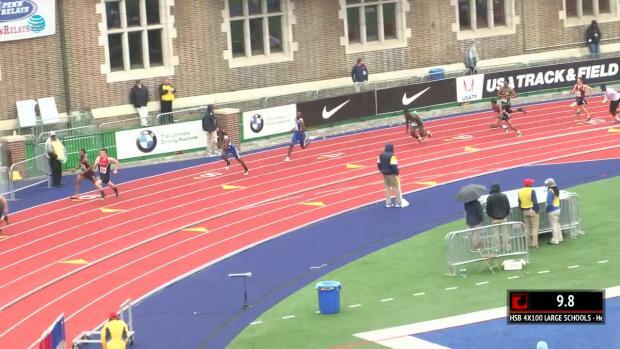 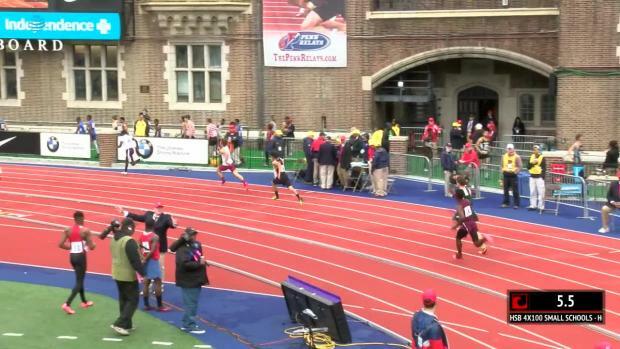 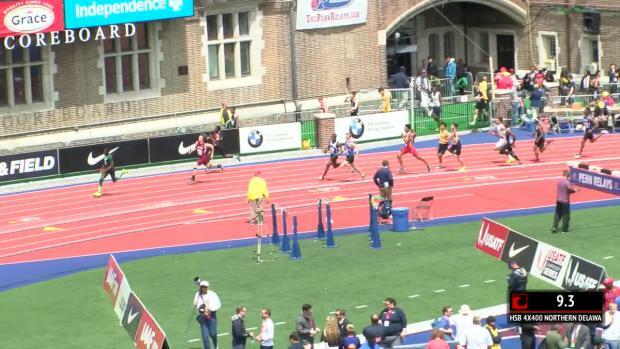 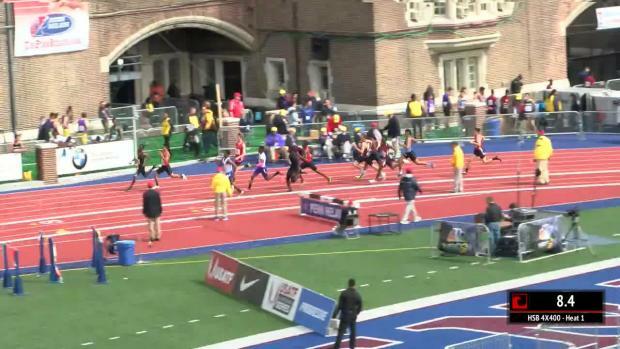 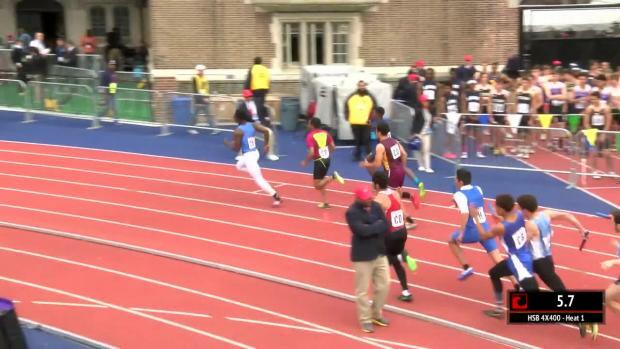 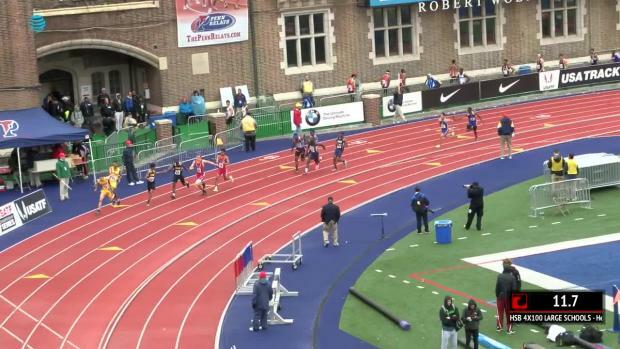 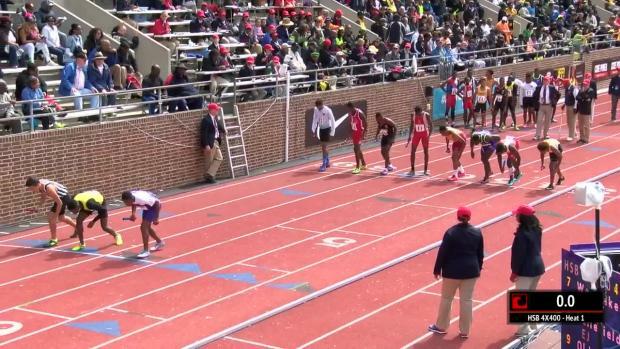 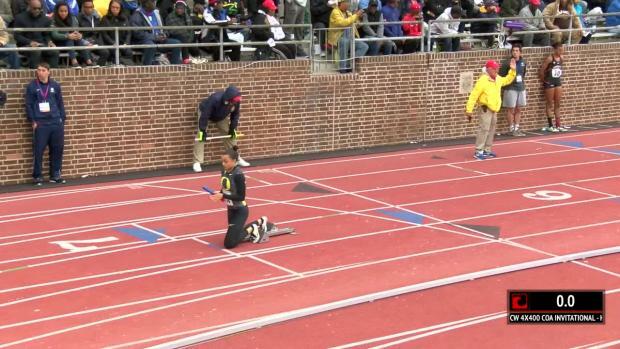 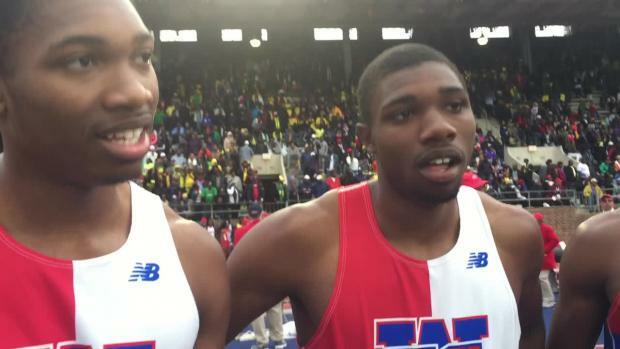 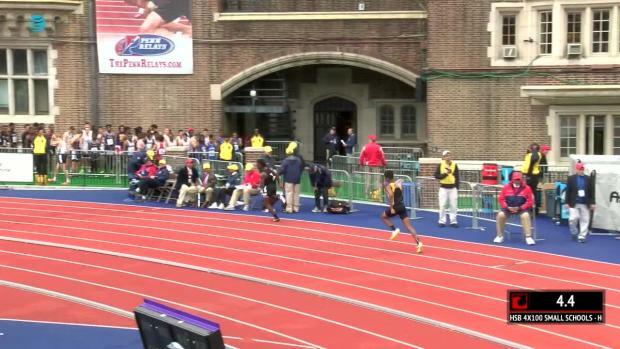 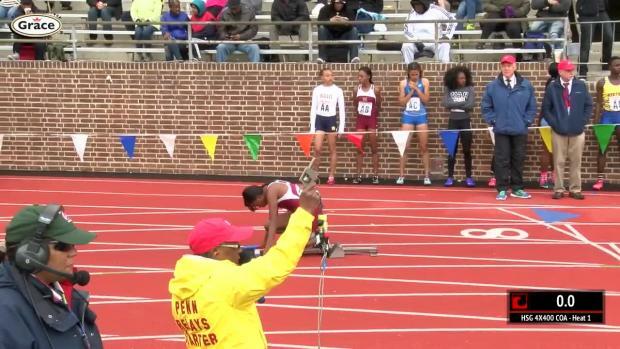 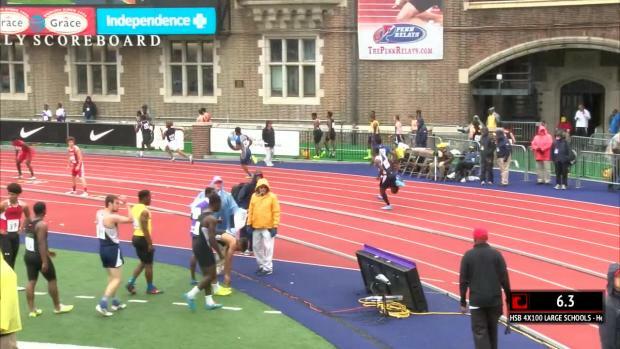 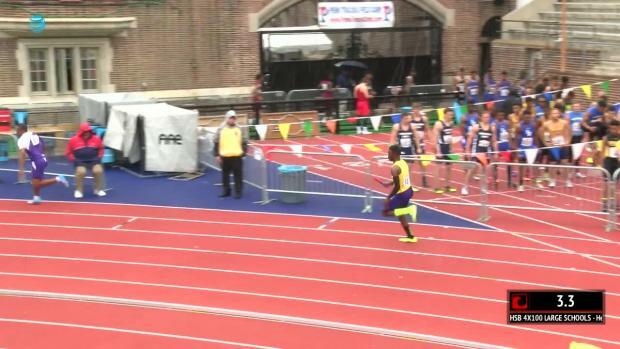 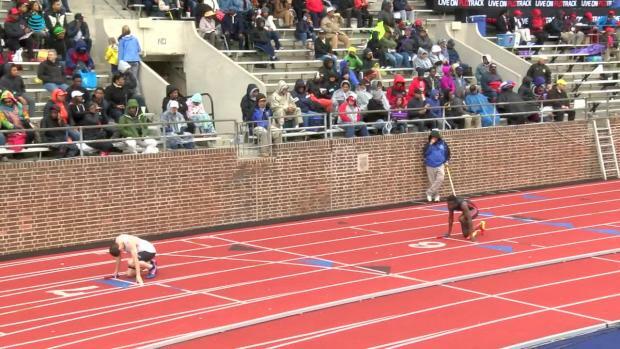 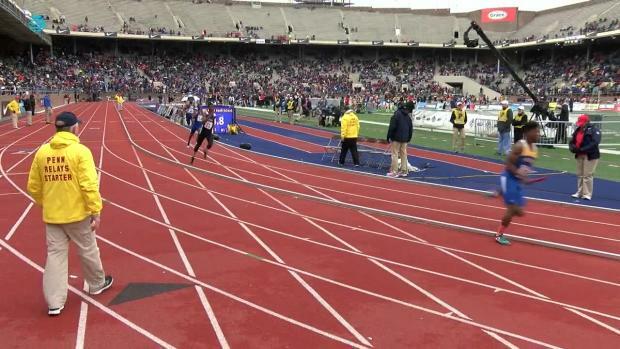 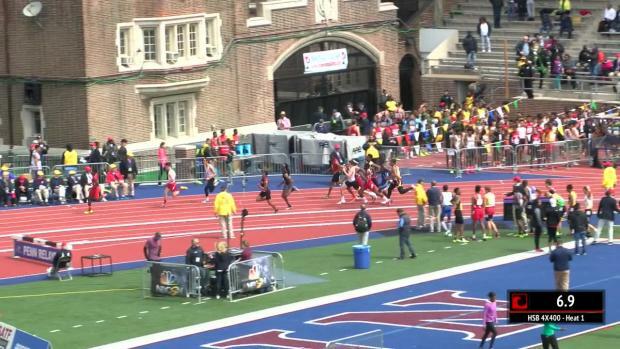 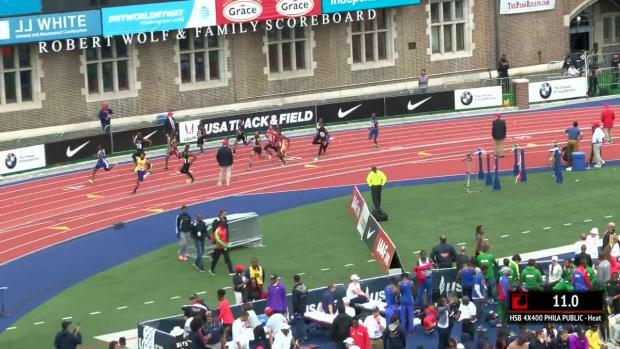 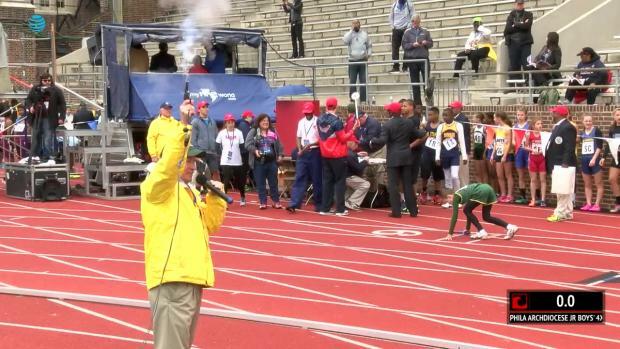 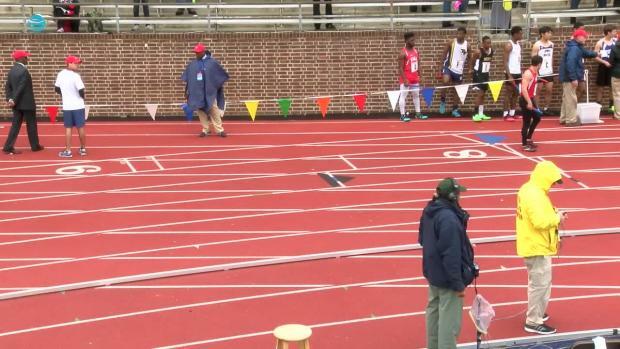 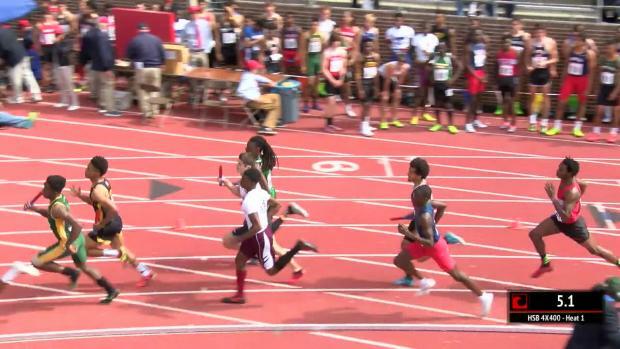 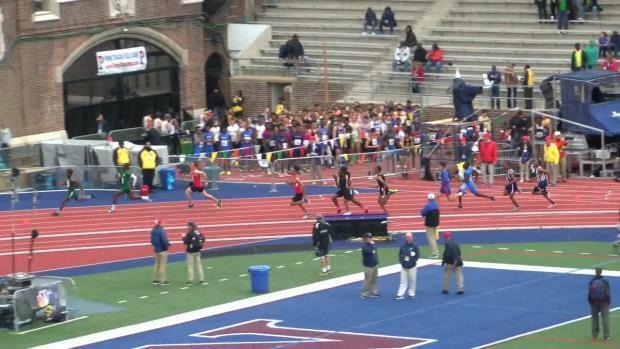 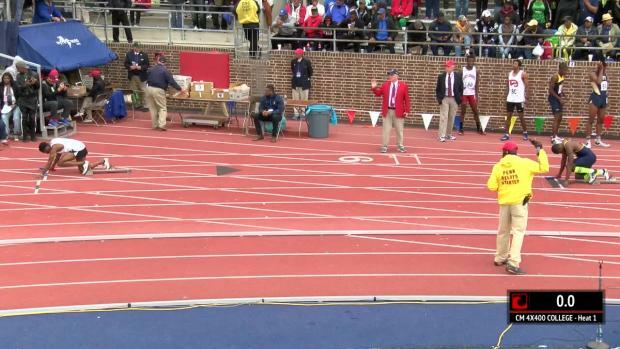 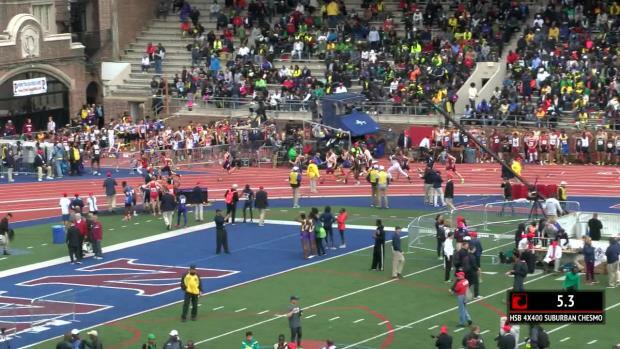 Penn Wood and Cheltenham dueled to the line in an epic Penn Relays 4x400 finish. 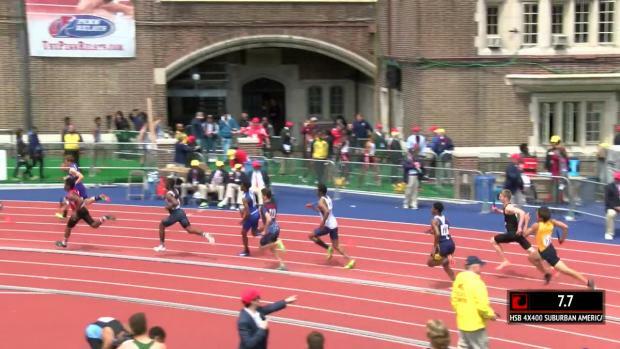 Watch that race here! 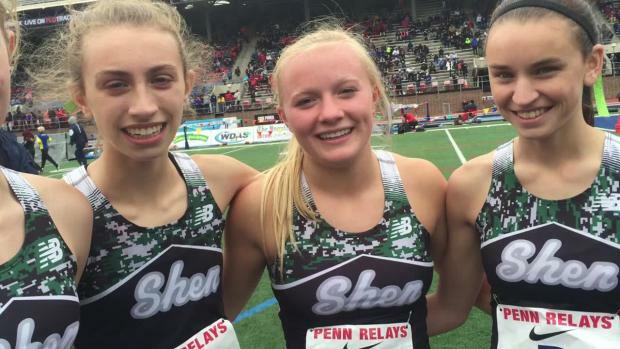 Current and former stars made their mark at this past weekend's meet. 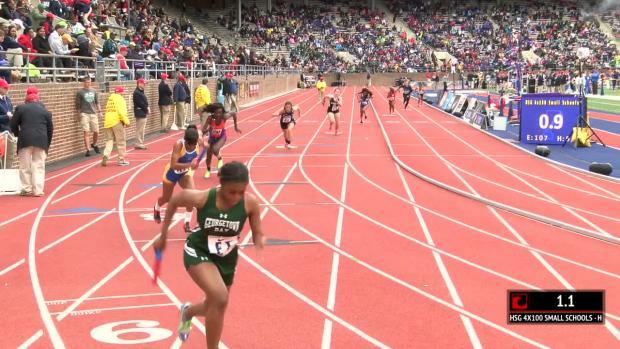 Check out who the best performers at the Penn Relays were since 2001! 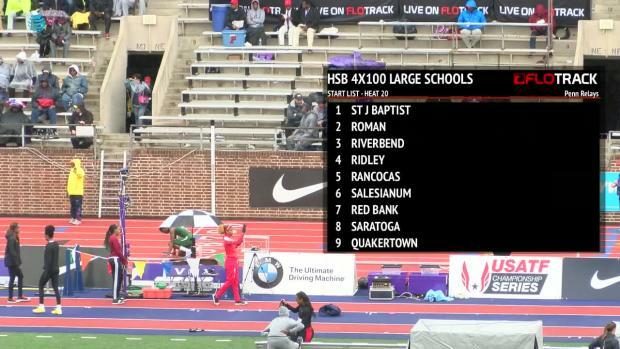 Rams set state record by finishing second to Drew Hunter and Loudoun Valley with time of 10:00.004. 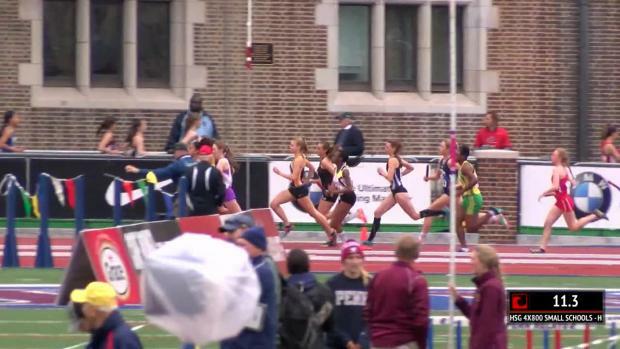 We have video footage of the race from start to finish (with commentary). 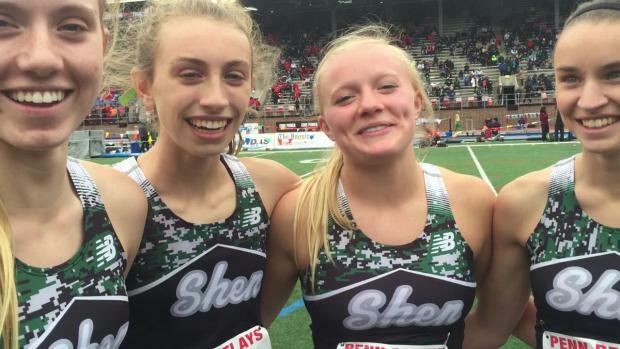 It has been quite the weekend for the Alumni of the Empire State. 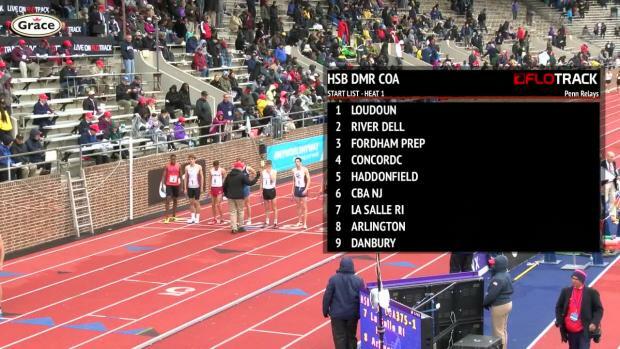 How has R.I. fared in the last seven years at the prestigious meet? 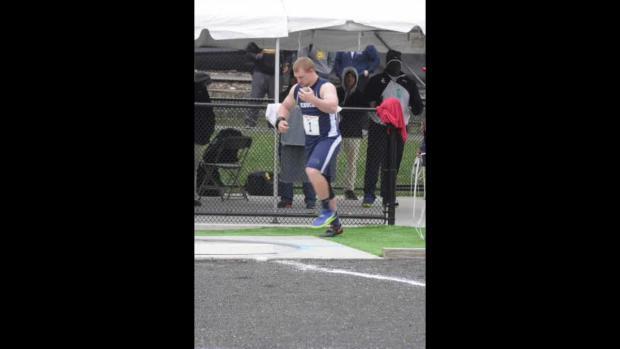 Warwick R.I. resident is one of the most respected individuals when it comes to track & field. 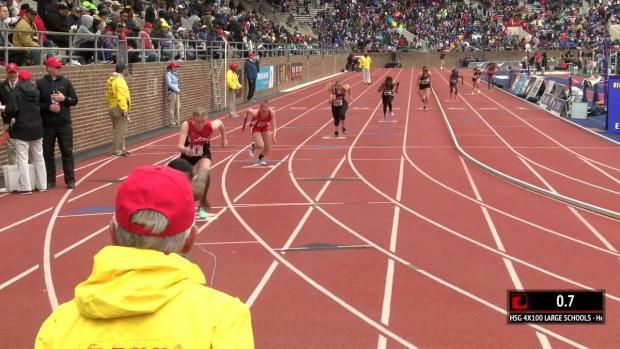 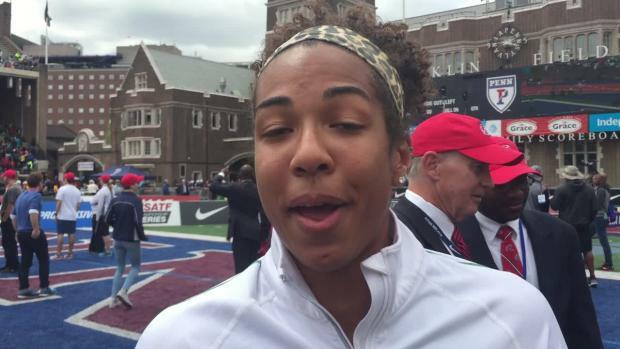 Maryland highlights from Thursday's events at the 2016 Penn Relays. 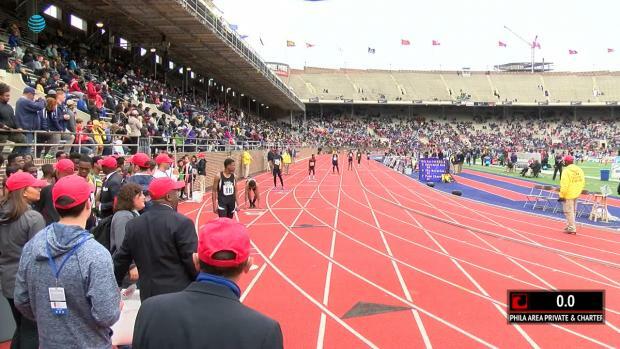 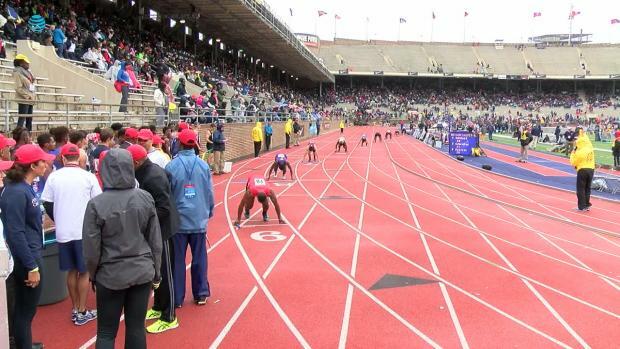 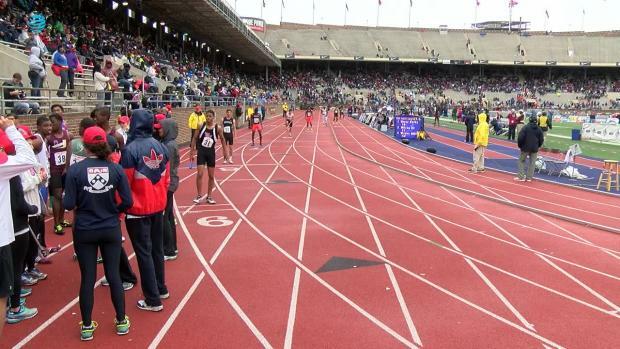 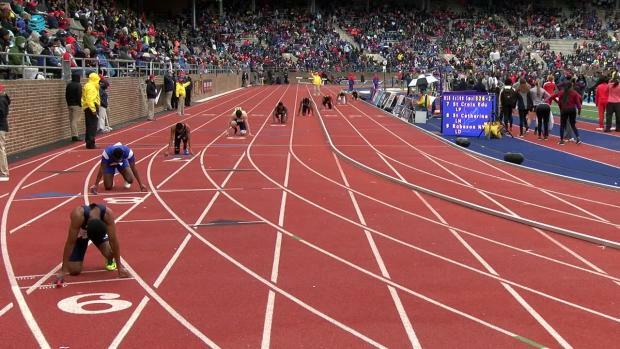 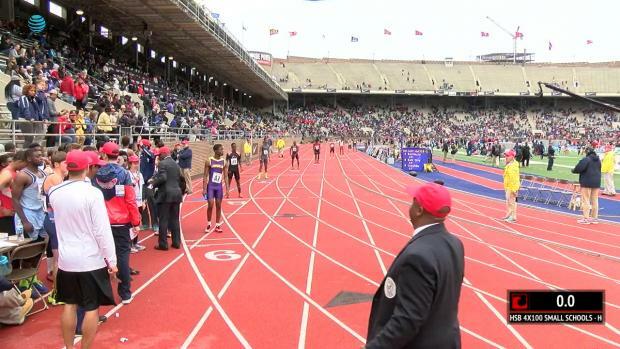 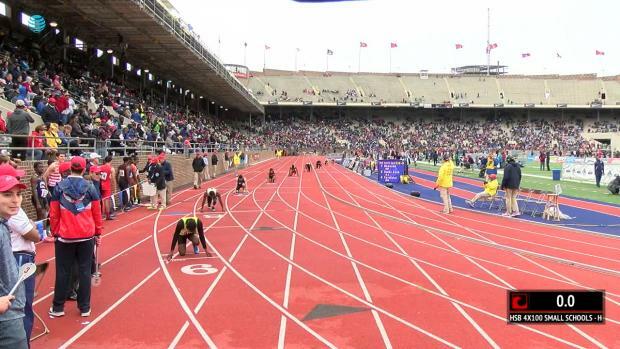 The granddaddy of all track & field meets begins this week with the 121st annual Penn Relays Carnival in Philadelphia, held from Thursday to Saturday. 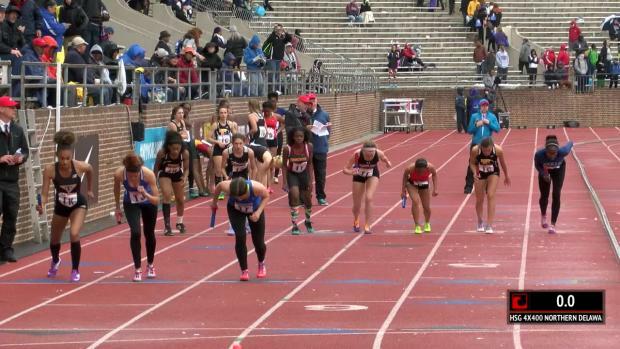 Check out the top 50 Maryland girls 4x100 meter relay times at the Penn Relays over the last 10 years (since 2006). 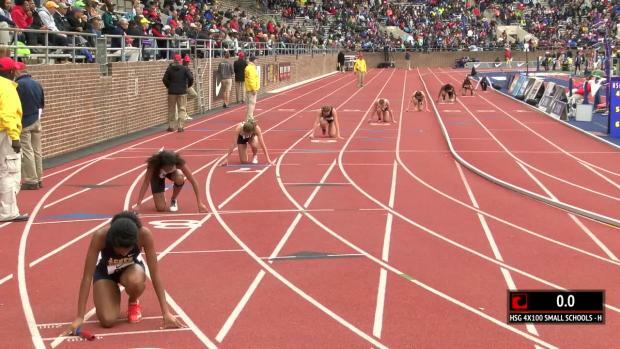 Can the Bullis girls or any of the 2016 squads from Maryland challenge for a sub 47 clocking at Franklin Field this weekend? 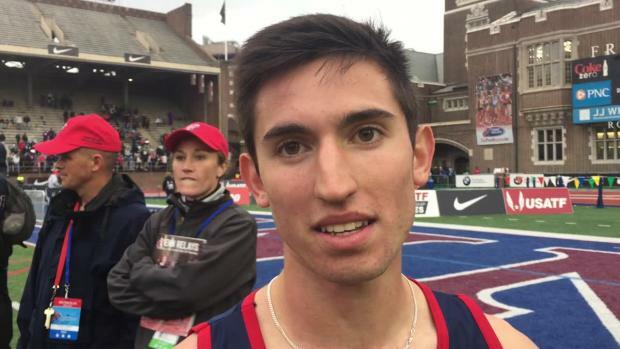 Northwestern alumnus Brandon Hudgins finished second in the Penn Relays Olympic Development Men's Mile Run. 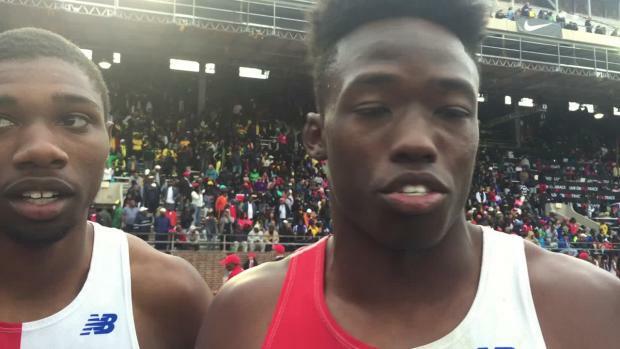 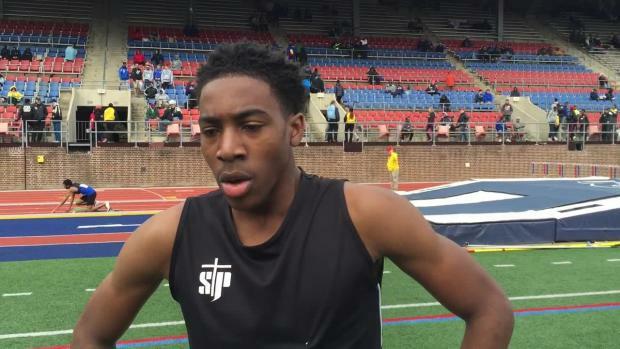 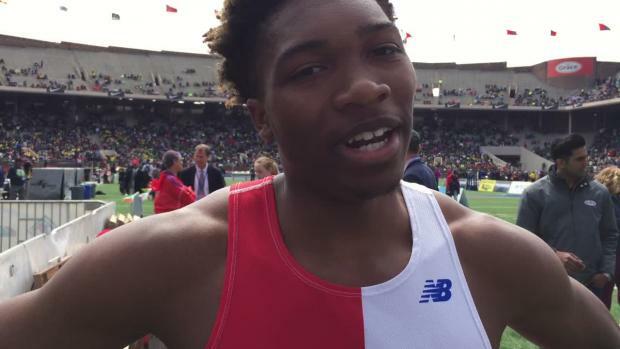 Bowie's Tajh Gilchrist got his first taste of the Penn Relays last year running on the relays for his Bowie squad and boy was it physical! 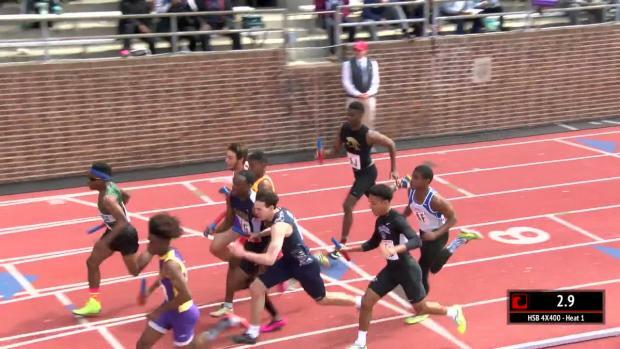 He did a great job staying on his feet after this melee during his opening leg of the 4x400 meter relay. 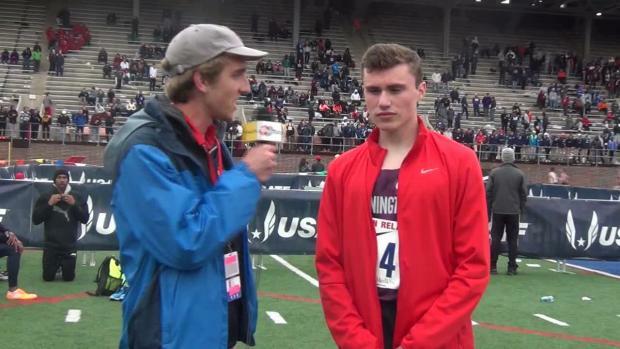 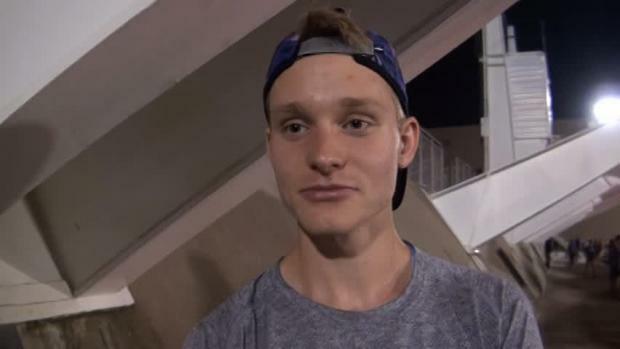 Liam Christensen talks with scrunners about Stanford, javelin and the future. 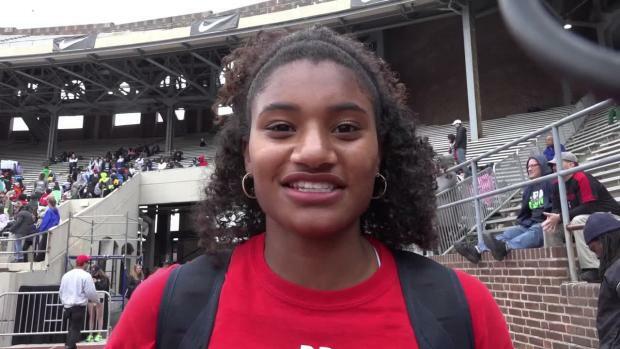 Alyssa Wilson continues to make her mark in high school throwing breaking the meet record at Penn Relays with a throw of 51-6.5! 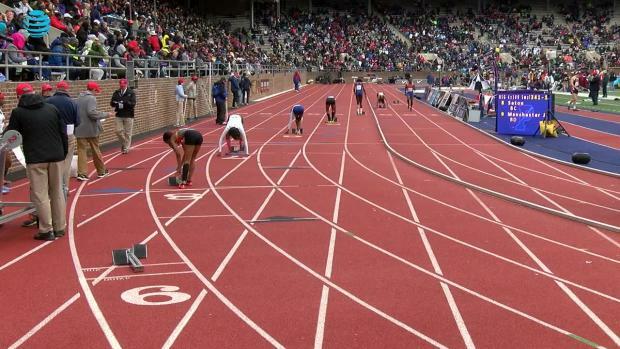 Upgrade to MileSplit Universal, so you can watch the Penn Relays LIVE on Flotrack as well as the archived race videos immediately after the event! 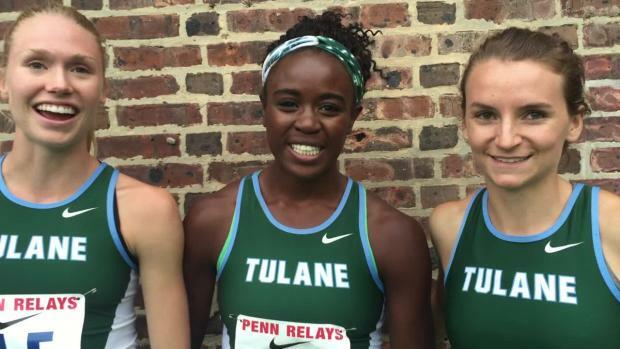 The Tulane girls talk about a historic weekend for their program at The Penn Relays that included a third place run in the Sprint Medley Relay Championship of America and a spot in the 4x400m Championship of America final, where they ran 3:36 - the second-fastest time in program history. 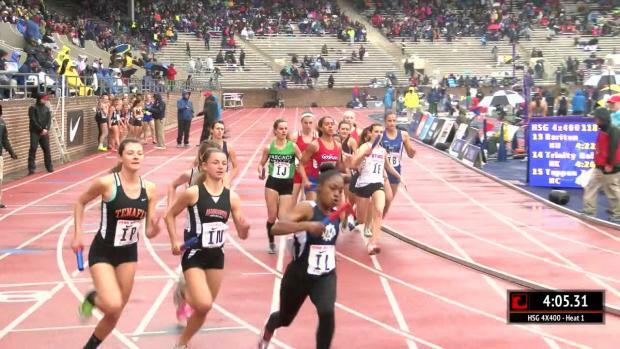 The state of Maryland has a great history at the Penn Relays including over the last 15 years as we take a look at the top 10 performances over that time in the girls mile, 3K, and 400 meter hurdles. 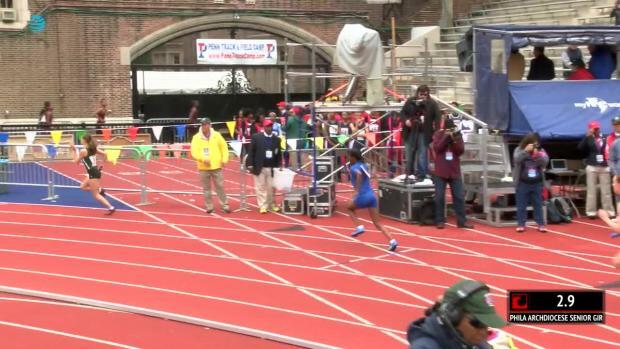 Alexis Franklin of Old Mill win the 2012 Penn Relays in the 400 meter hurdles. 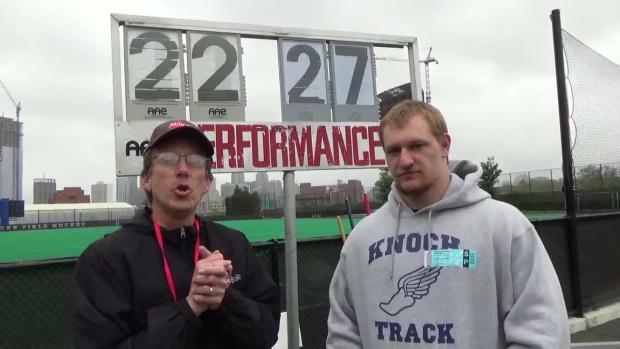 The senior from Starpoint, Sam Wray, can add another accolade to his résumé. 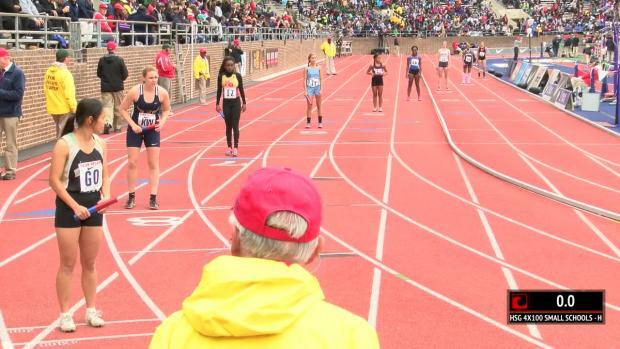 Check out the top 50 Maryland girls 4x400 meter relay times at the Penn Relays over the last 10 years (since 2006). 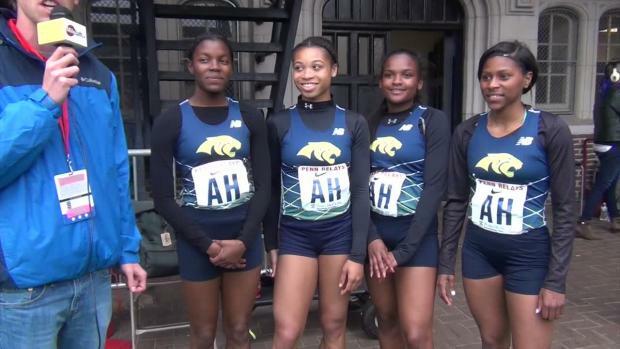 Remember when the Eleanor Roosevelt girls beat the Jamaicans not just once (2007), but two years (2008) in a row in the Championship of America 4x400 finals? 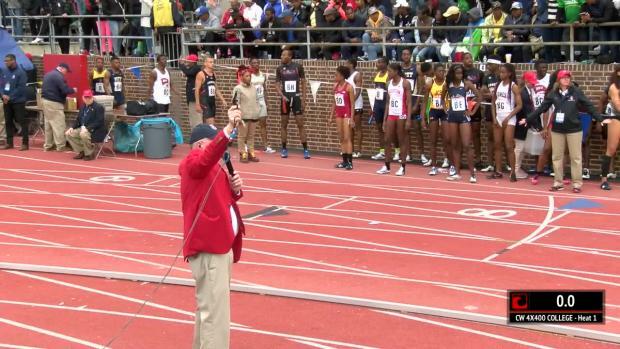 Check out the top 50 Maryland girls 4x800 meter relay times at the Penn Relays over the last 10 years (since 2006). 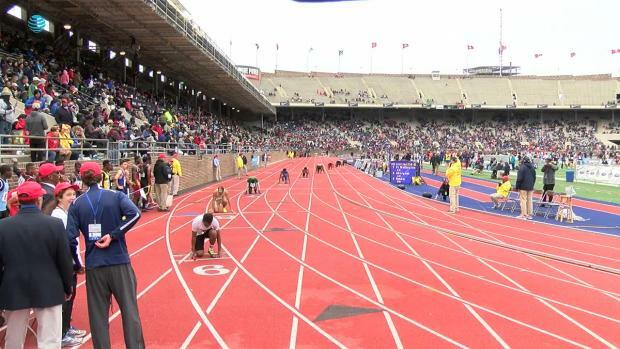 The Northwest girls made the Championships of America finals in 2010 with a school record performance of 9:08.47 at the Penn Relays. 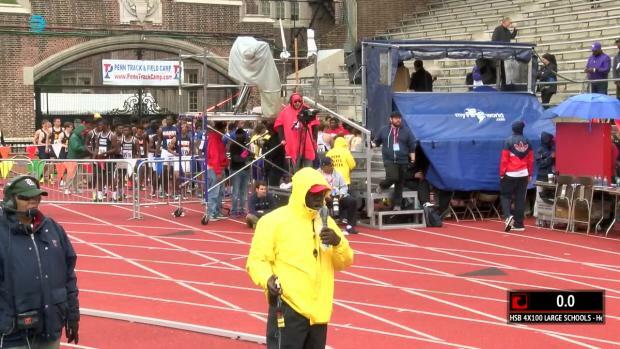 Brandon Hudgins talks with scrunners via video chat while he's talking with youth in New York for the Vasculitis Foundation. 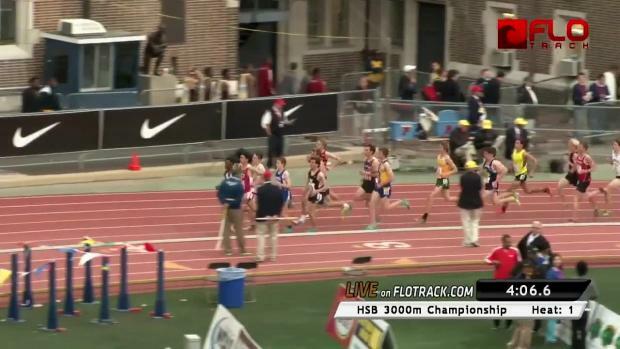 DeBalsi sixth in Championship 3K. 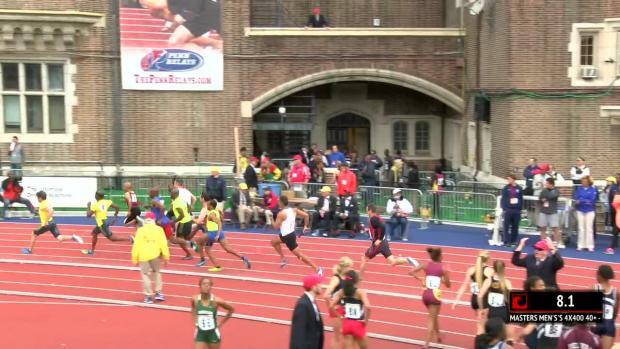 Green-Sea Floyd alumnus Calesio Newman was part of the Penn Relays U.S.A. vs the World 4x100-meter relay Saturday. 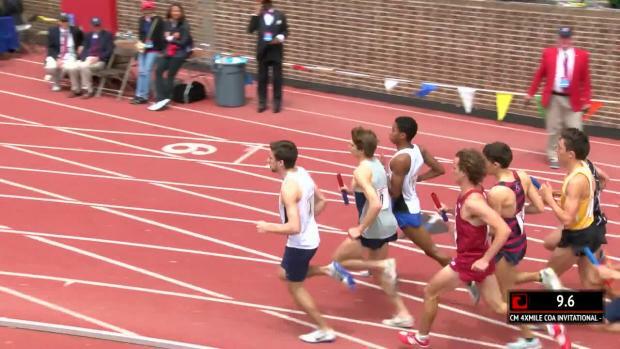 Two All Americans face each other in the 3K on Friday. 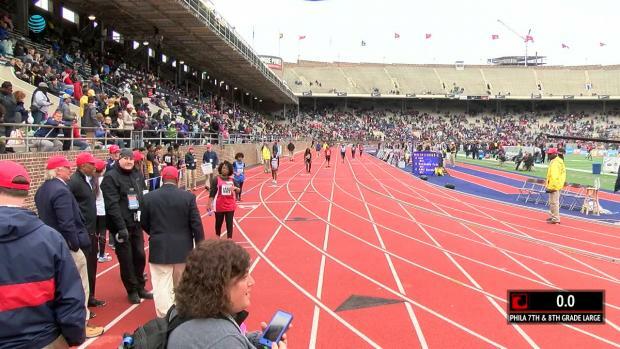 The 2016 Penn Relays Carnival is NEXT WEEK! 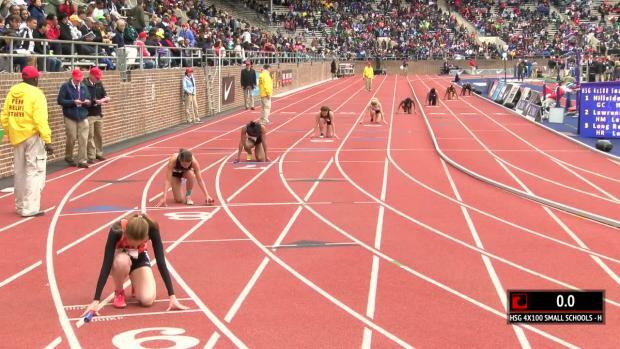 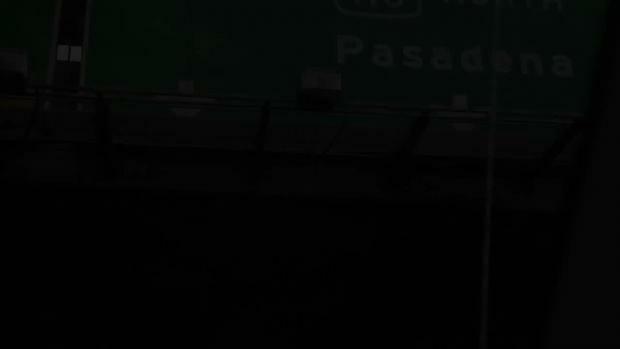 We have 1000s of photos posted and more are on the way! 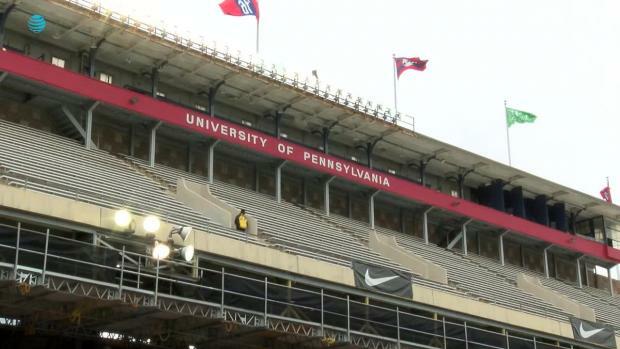 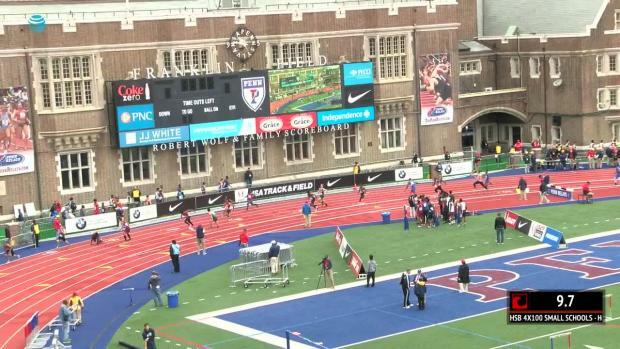 Don't miss one second of the action from Franklin Field! 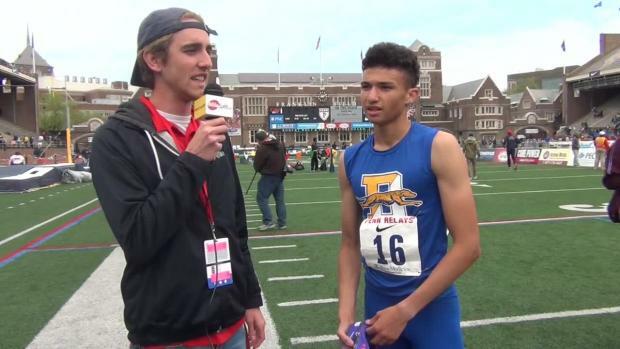 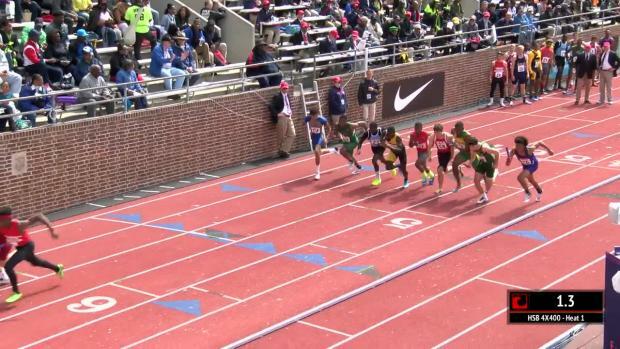 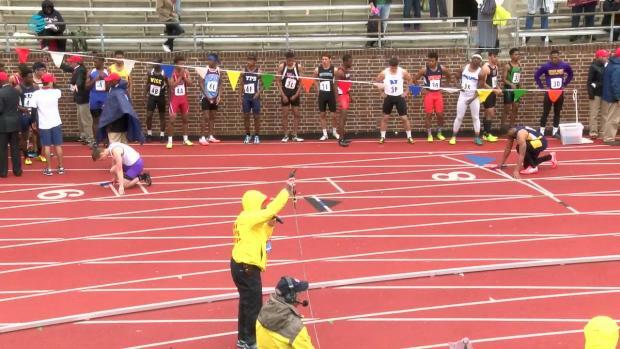 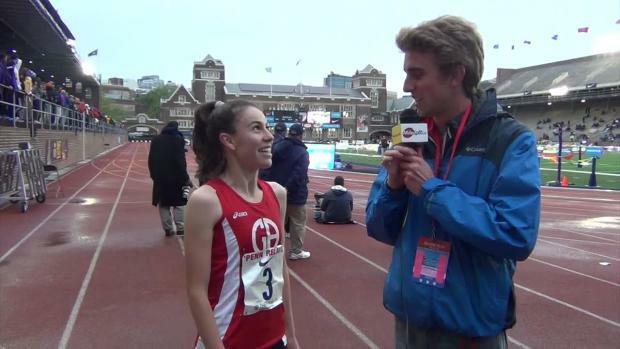 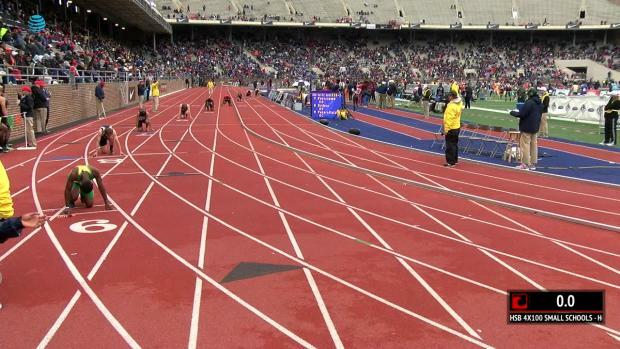 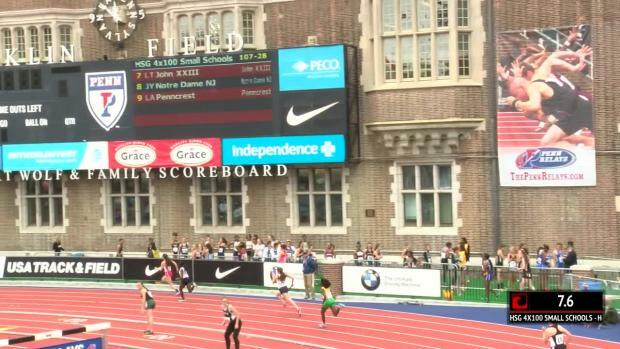 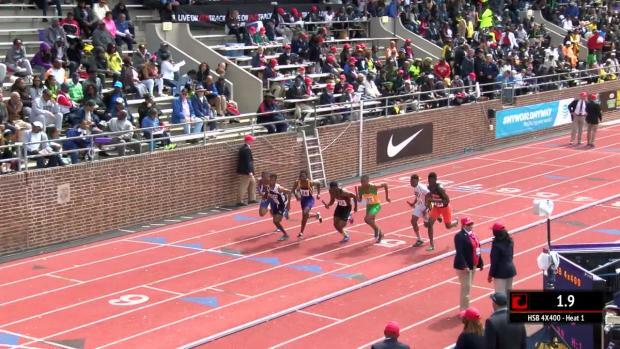 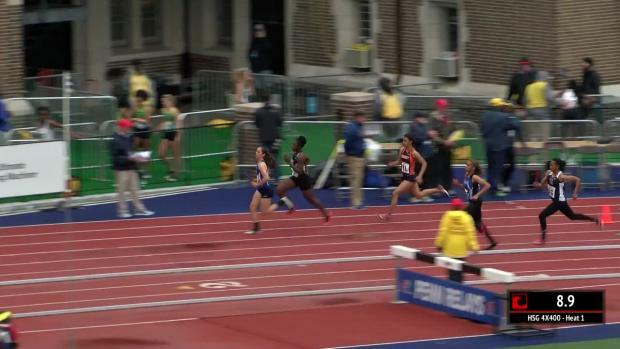 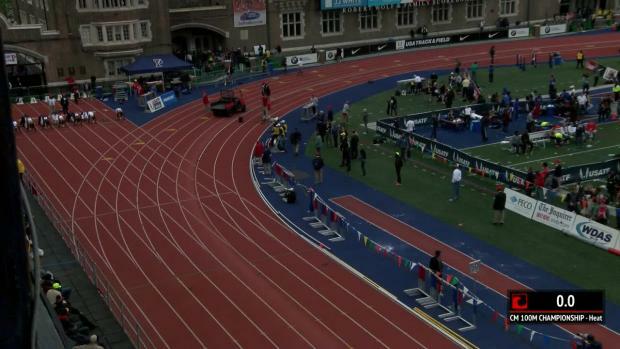 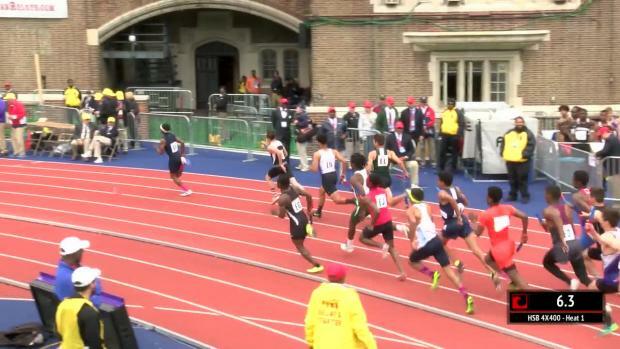 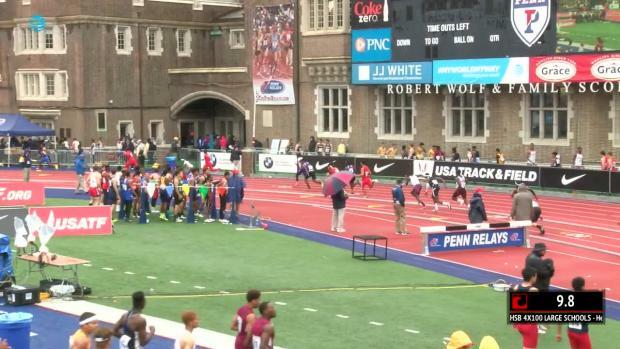 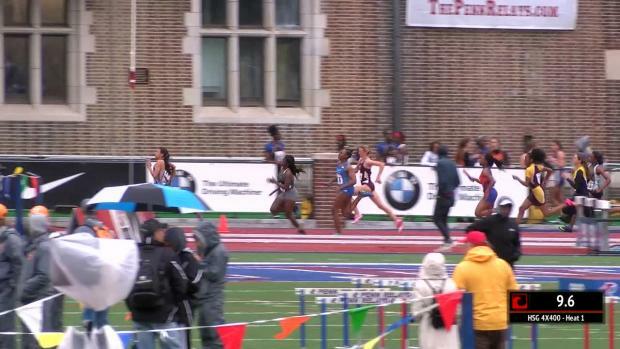 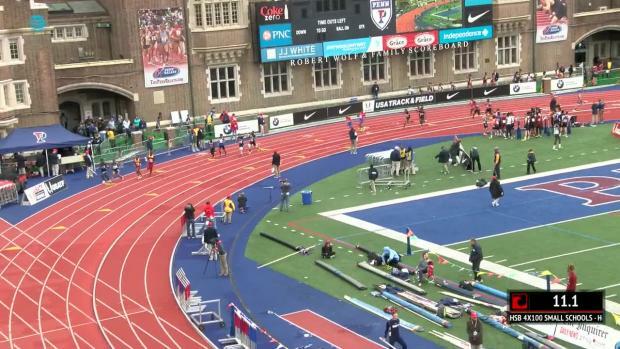 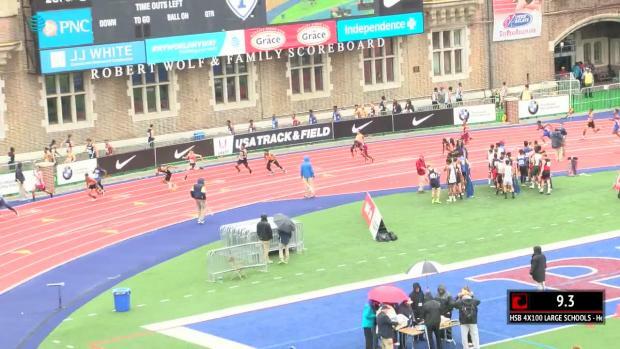 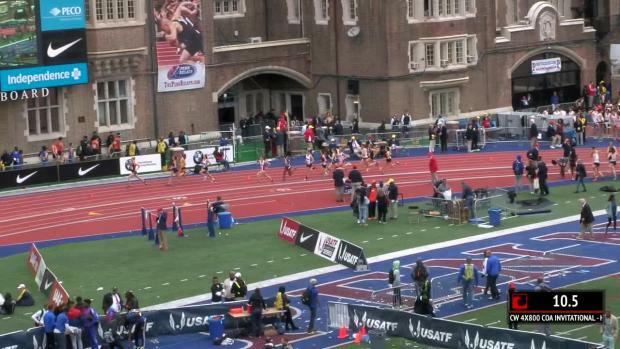 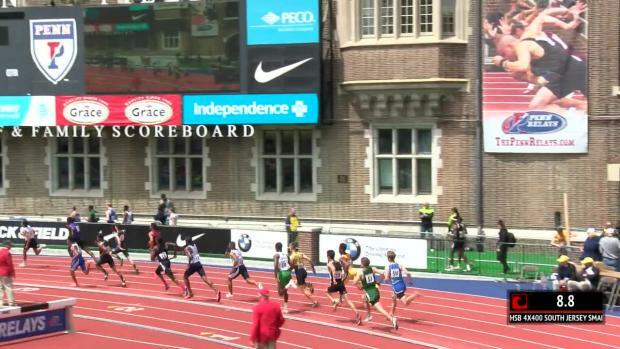 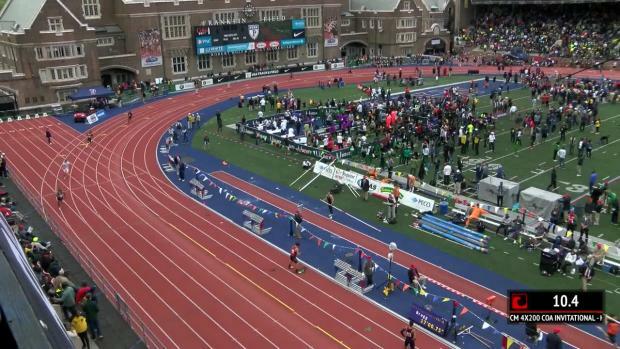 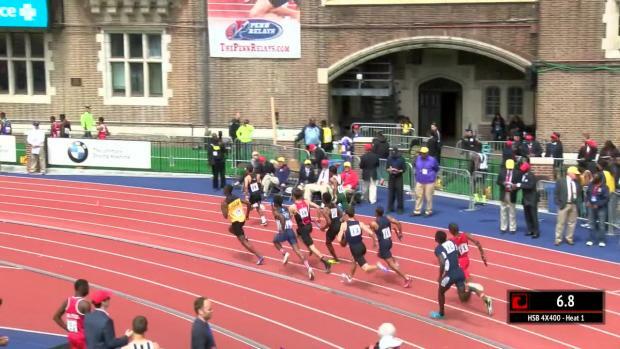 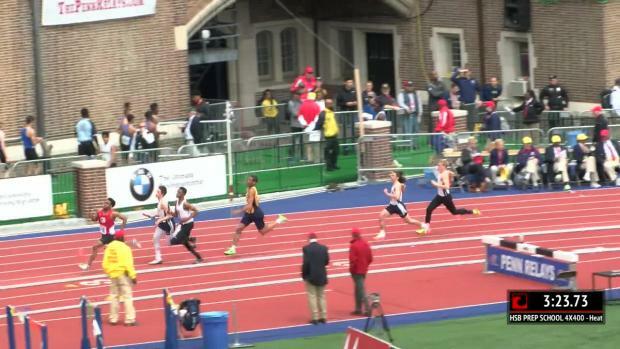 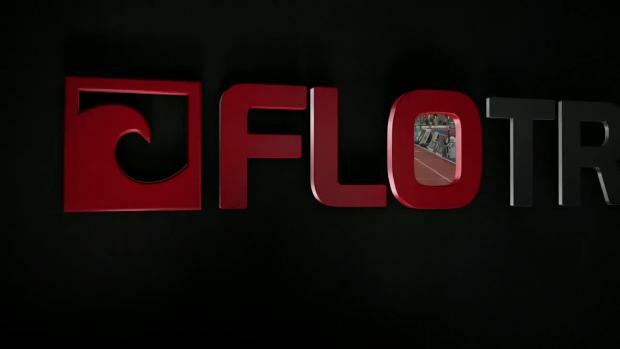 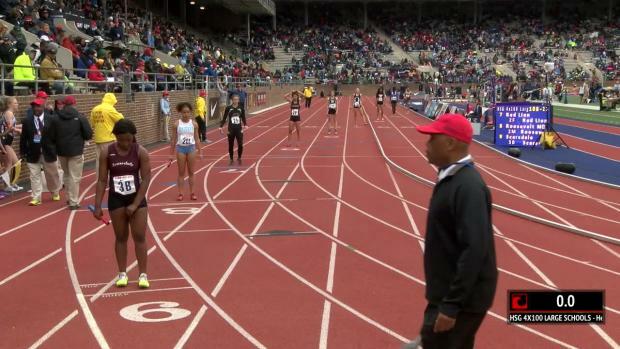 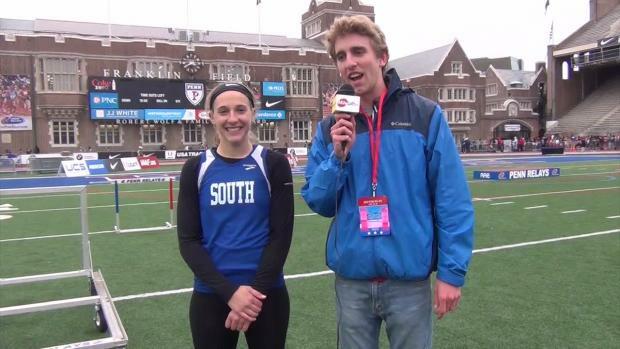 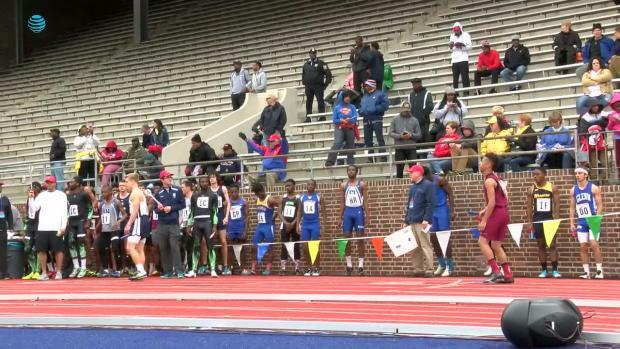 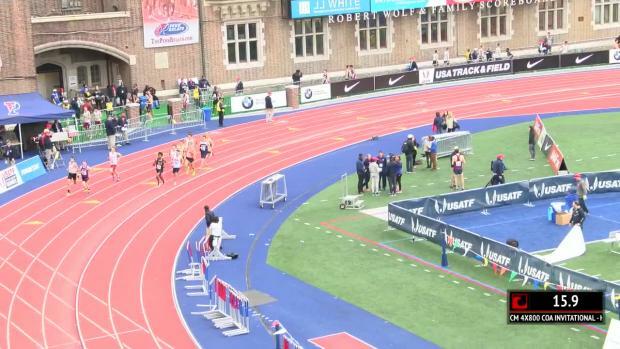 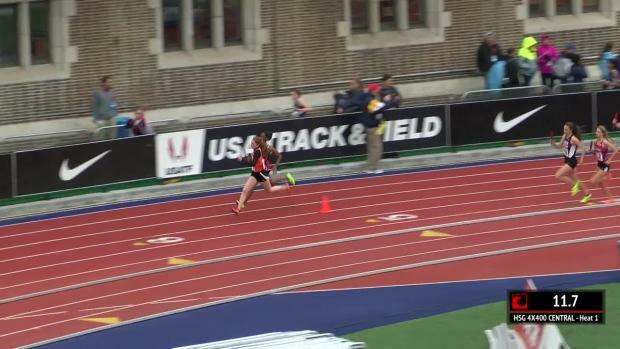 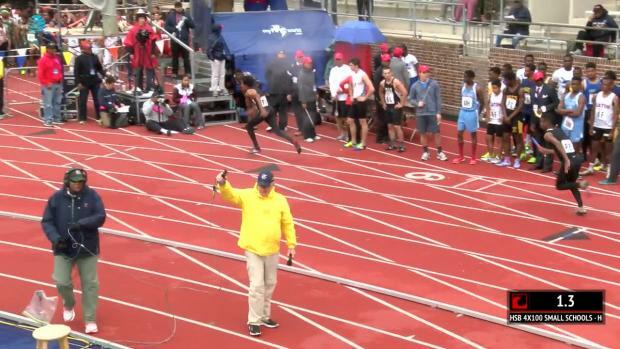 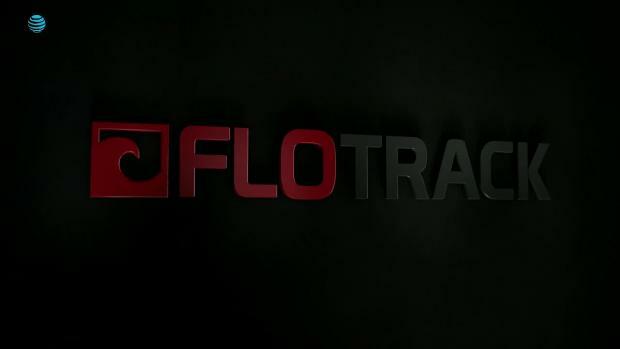 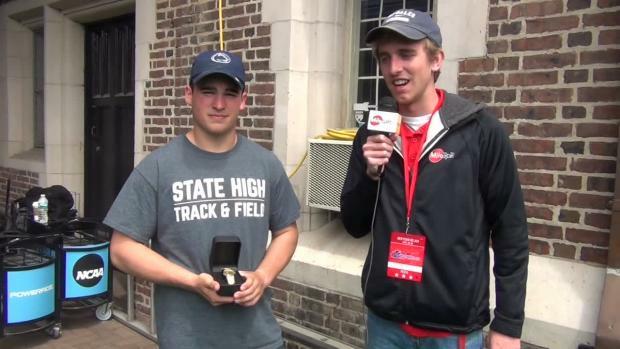 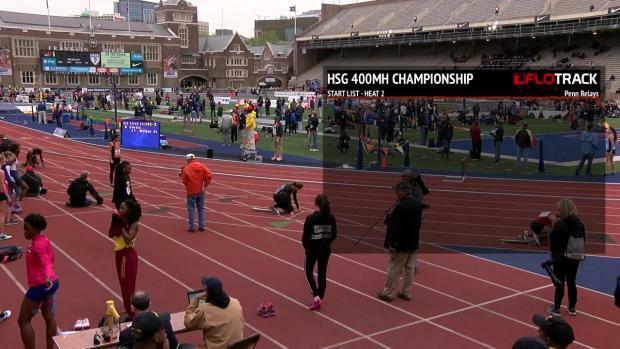 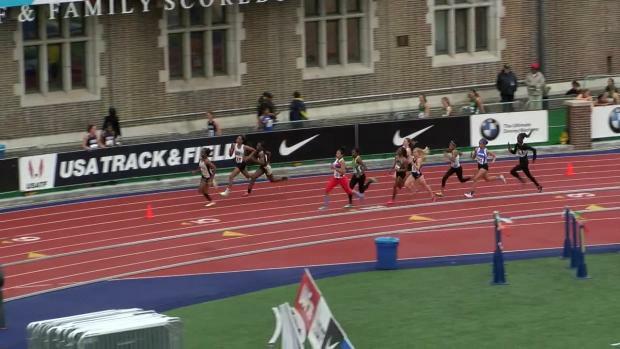 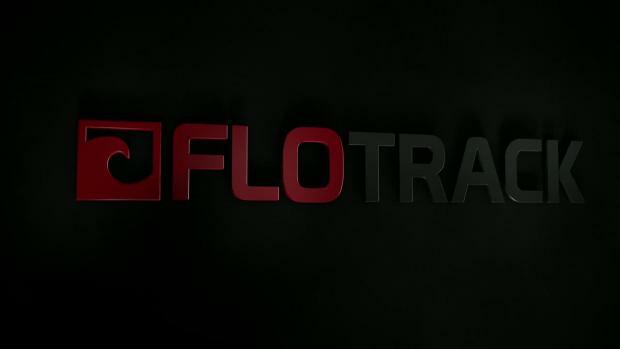 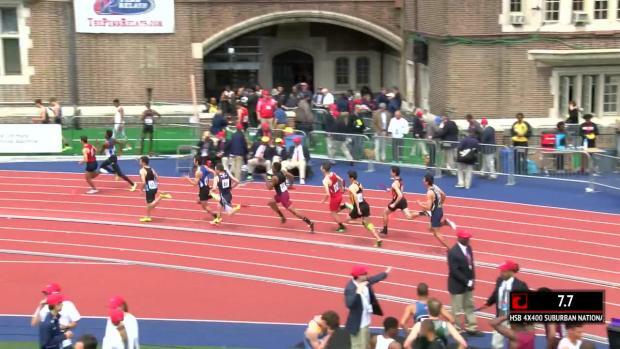 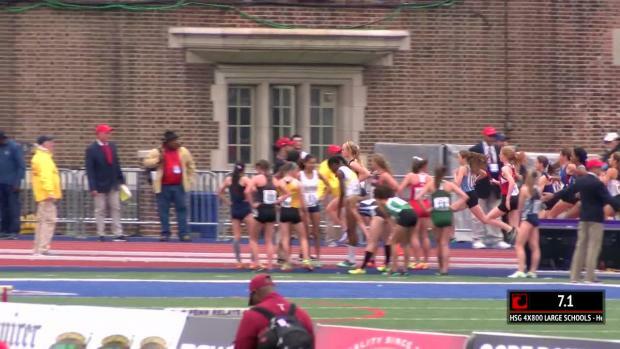 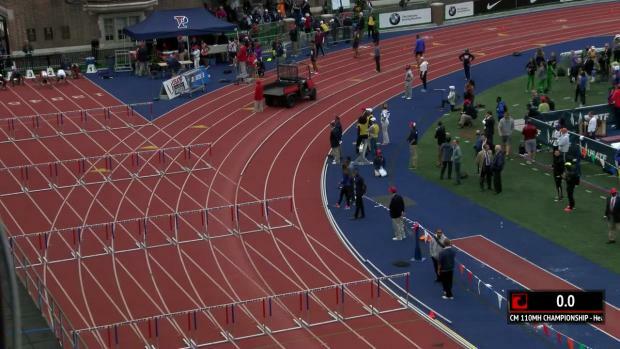 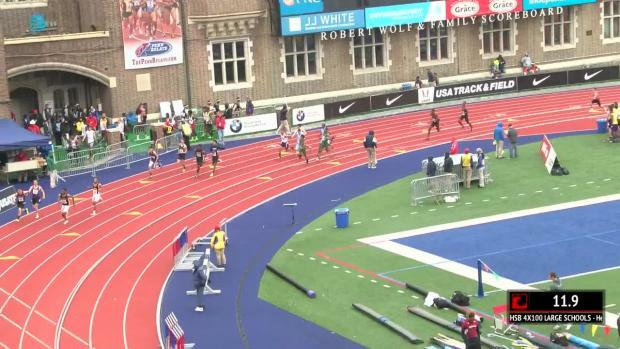 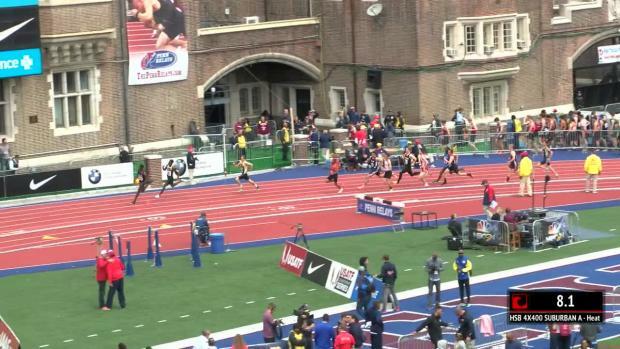 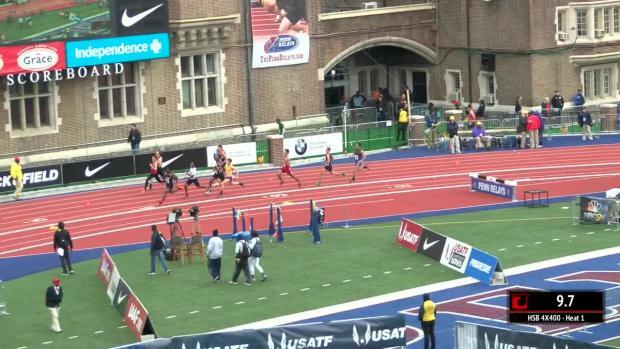 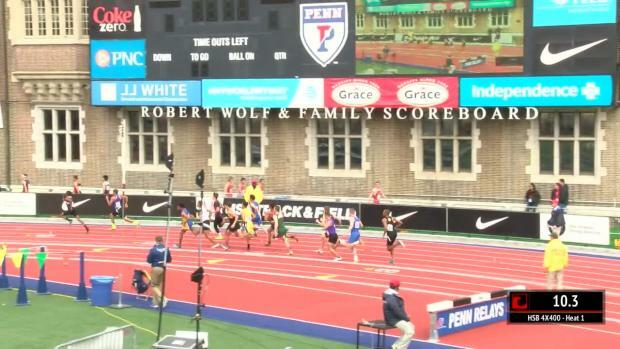 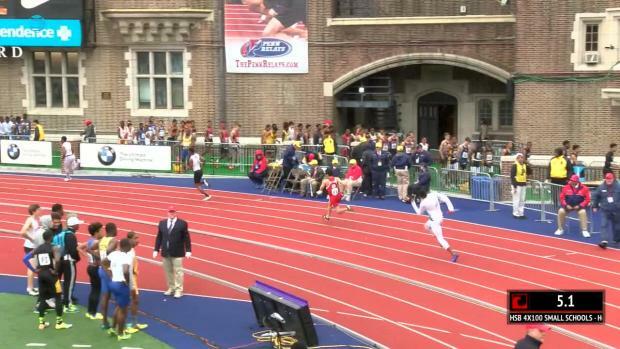 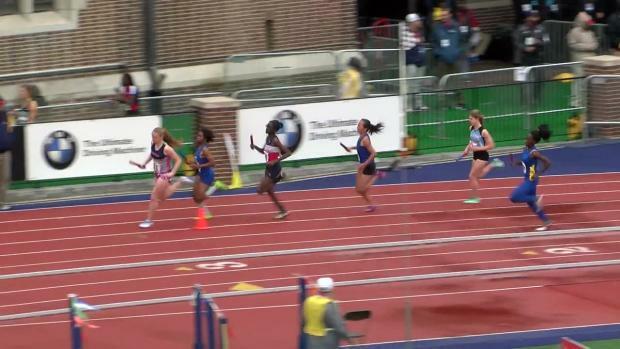 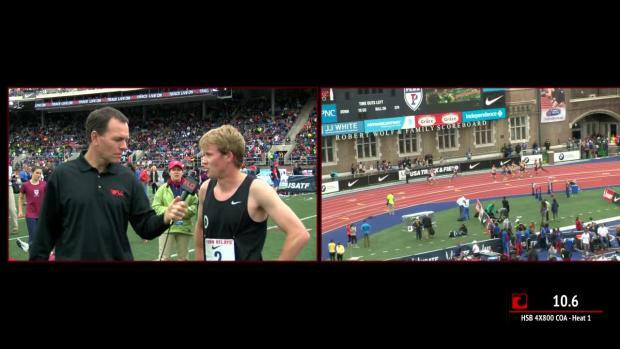 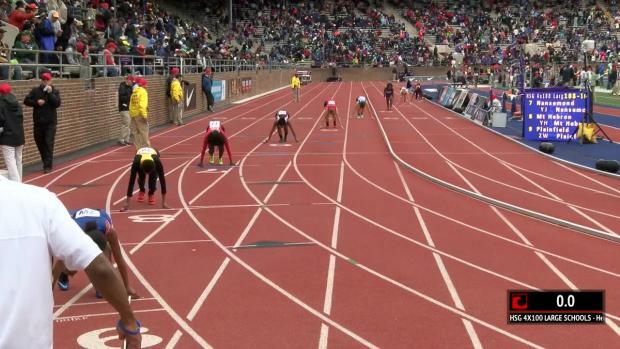 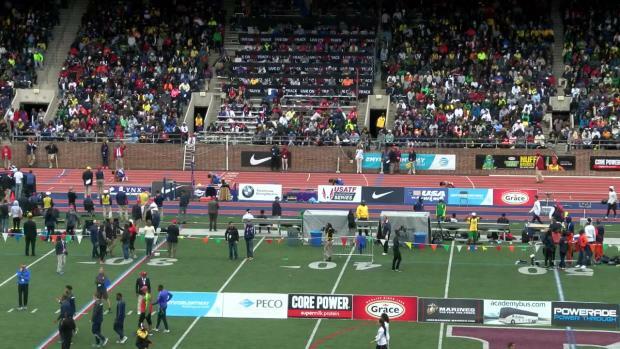 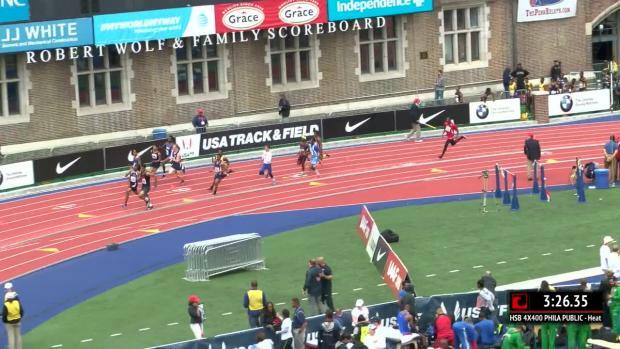 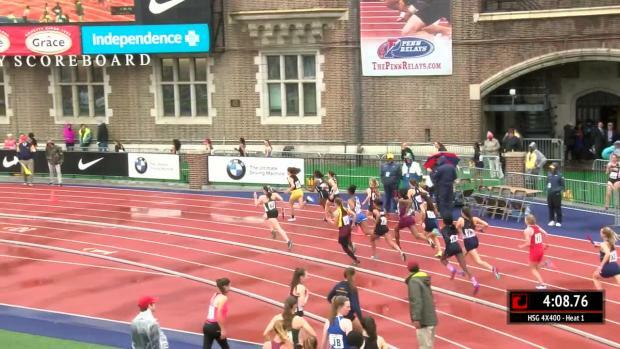 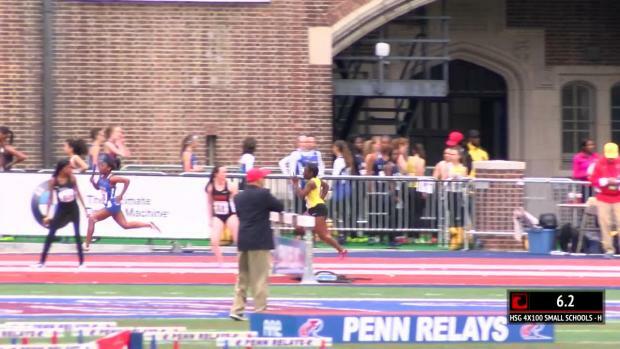 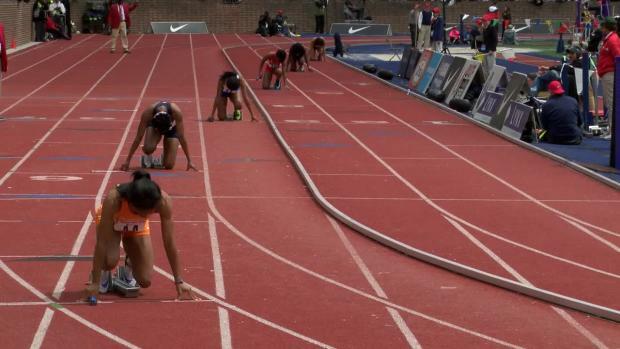 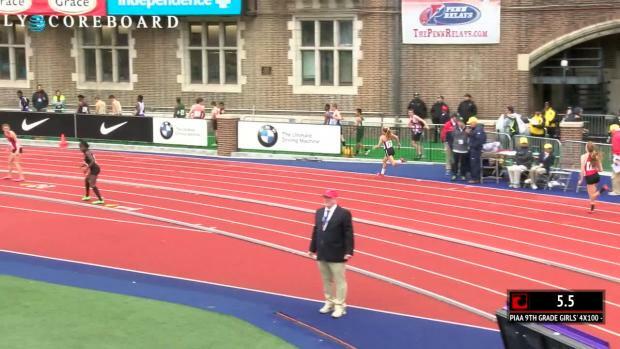 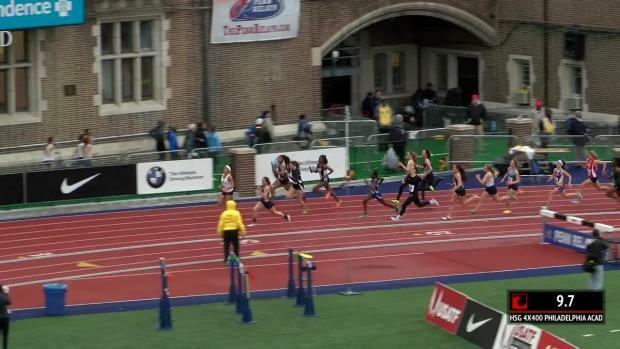 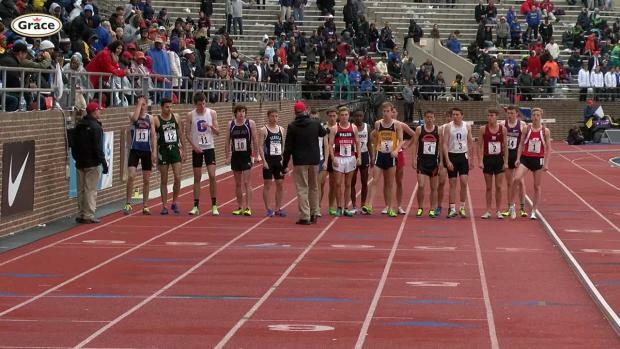 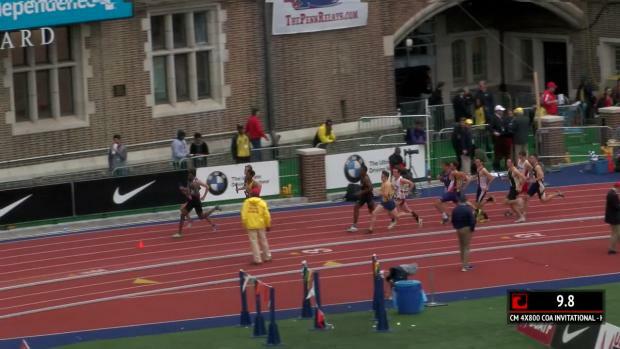 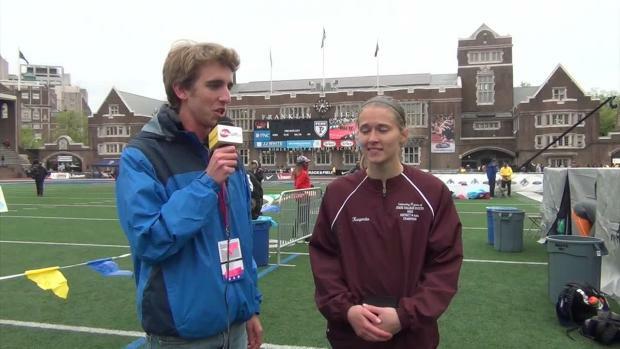 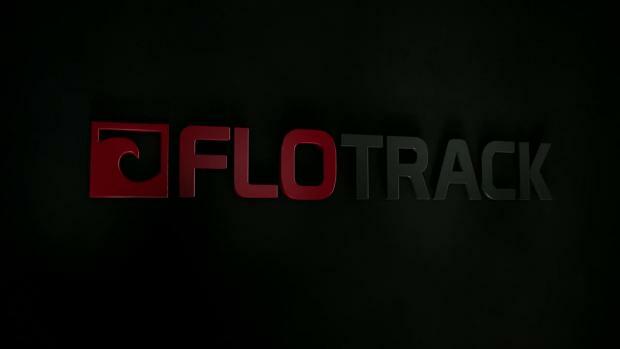 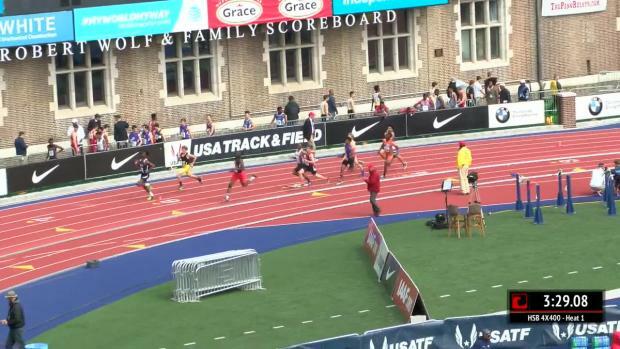 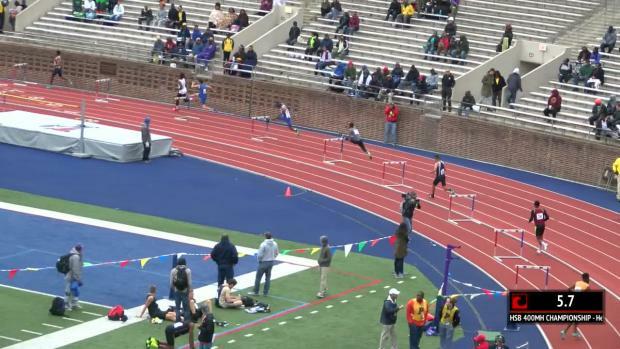 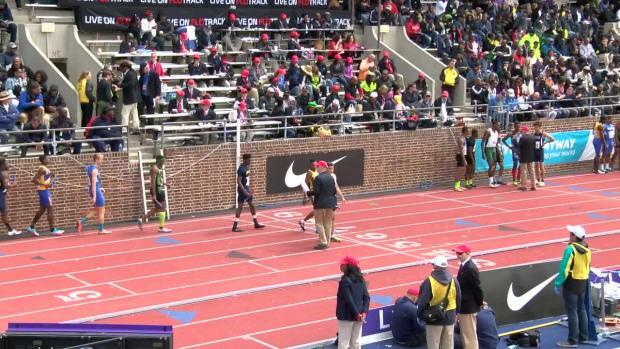 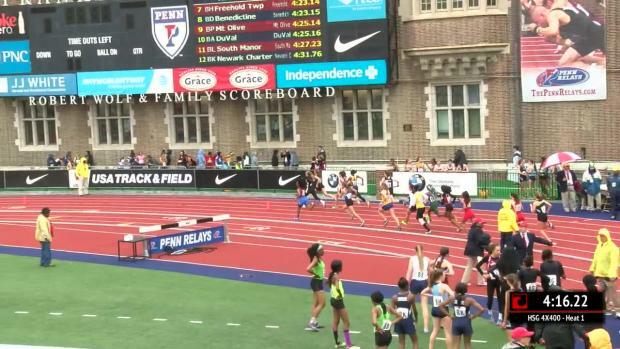 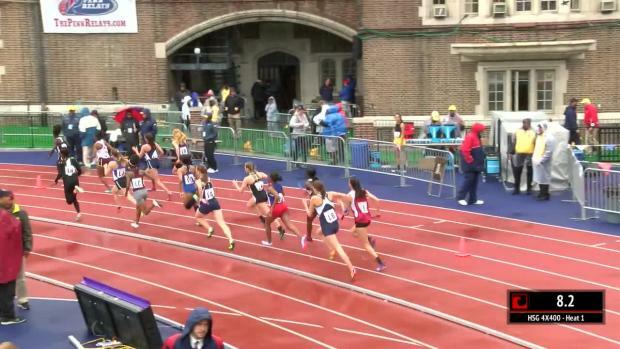 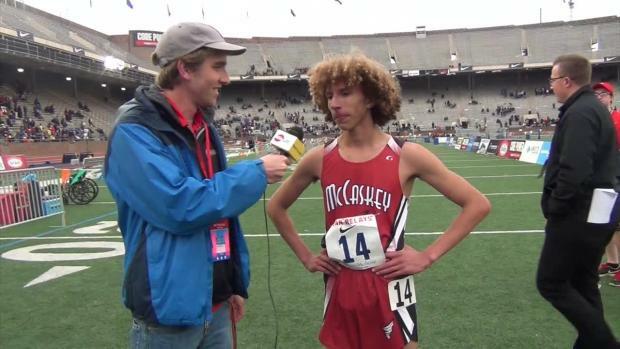 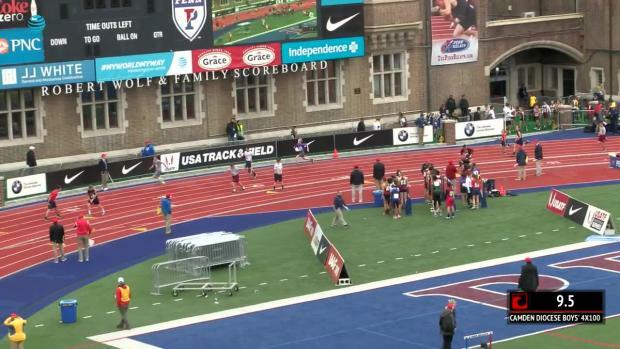 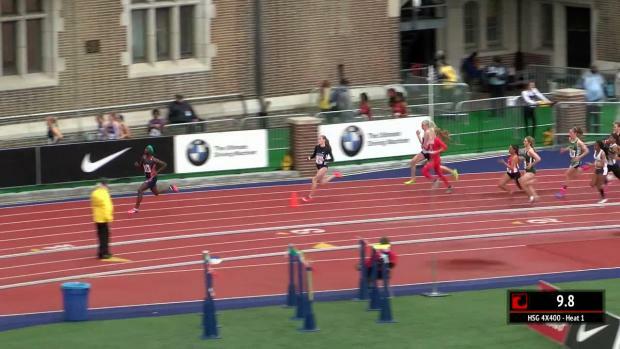 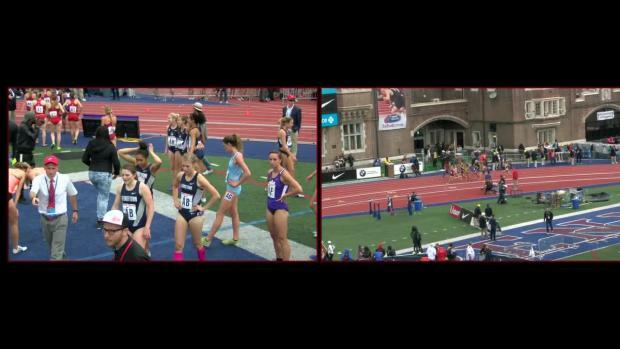 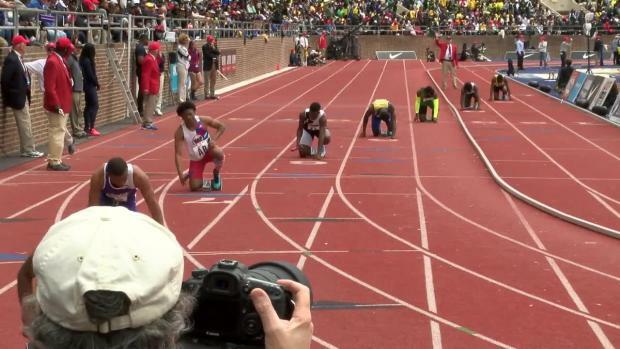 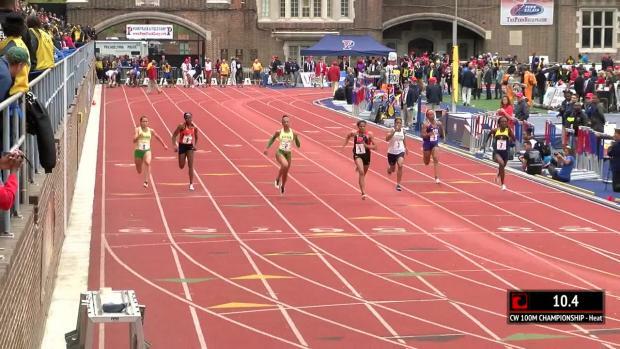 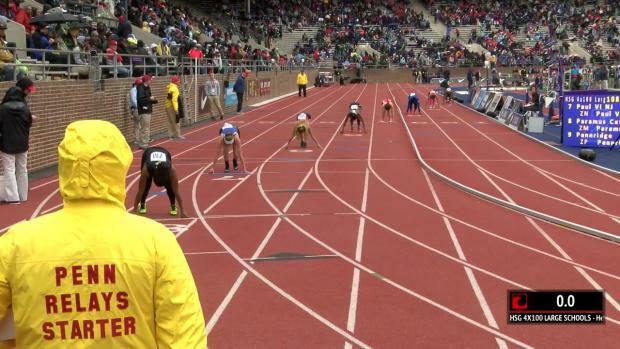 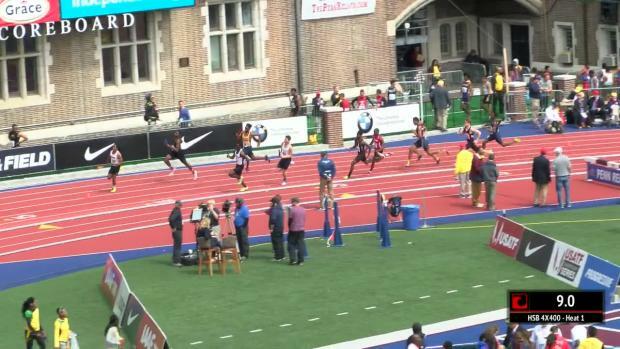 We've archived all the videos from Flotrack's stream of the 122nd Penn Relays. 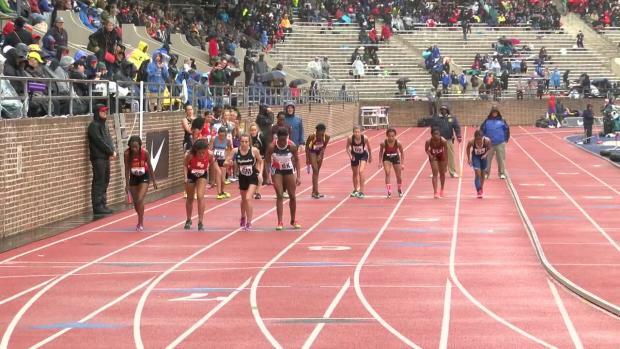 Watch those races now on MileSplit! 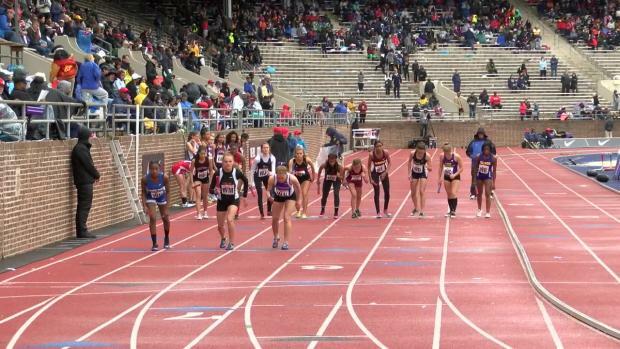 Check out John Roemer's Thursday photos from high school girls races at the Penn Relays. 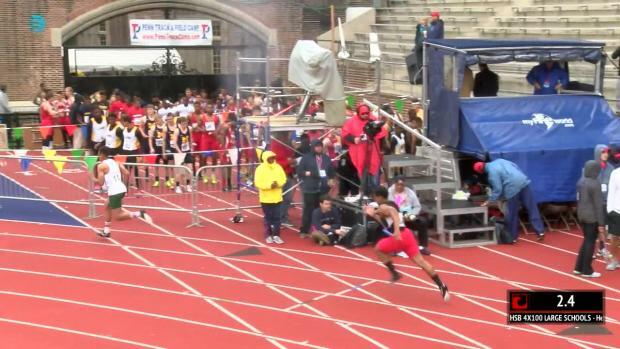 Anything can happen with the magic of the Penn Relays, especially when Drew Hunter is behind you!